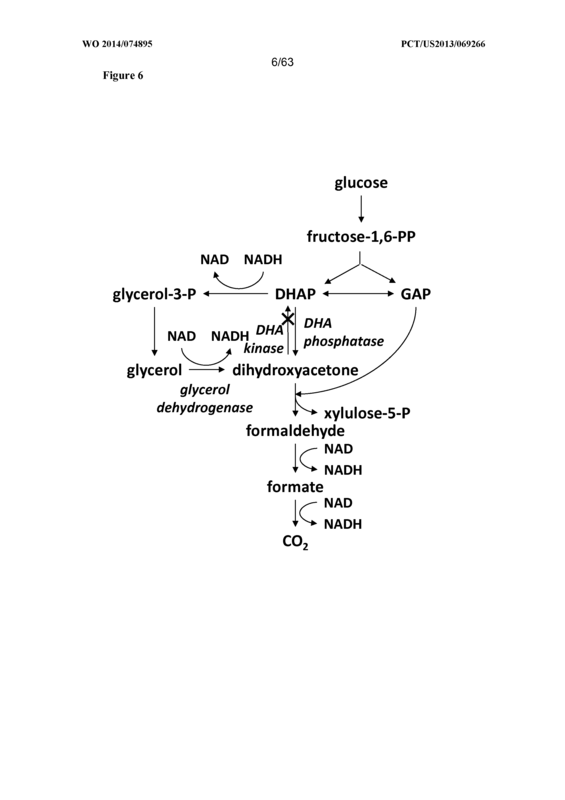 The present invention provides for novel metabolic pathways to detoxify biomass- derived acetate via metabolic conversion to ethanol, acetone, or isopropanol. 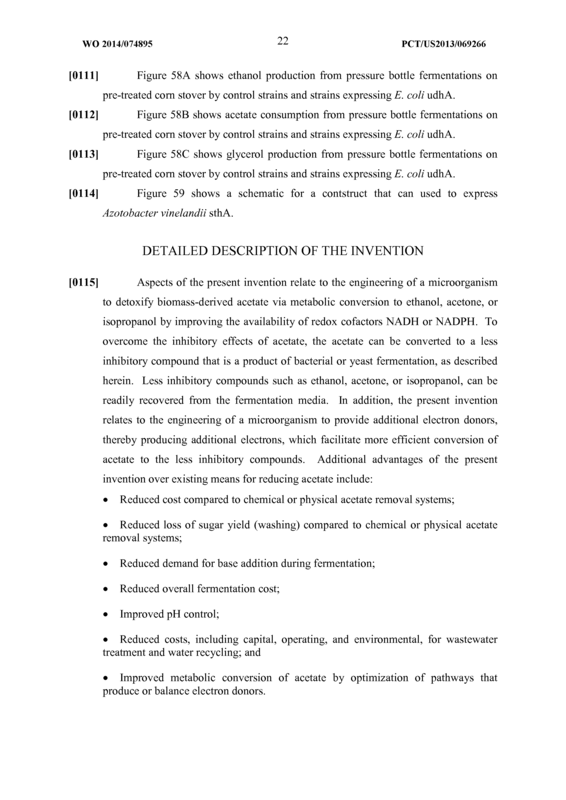 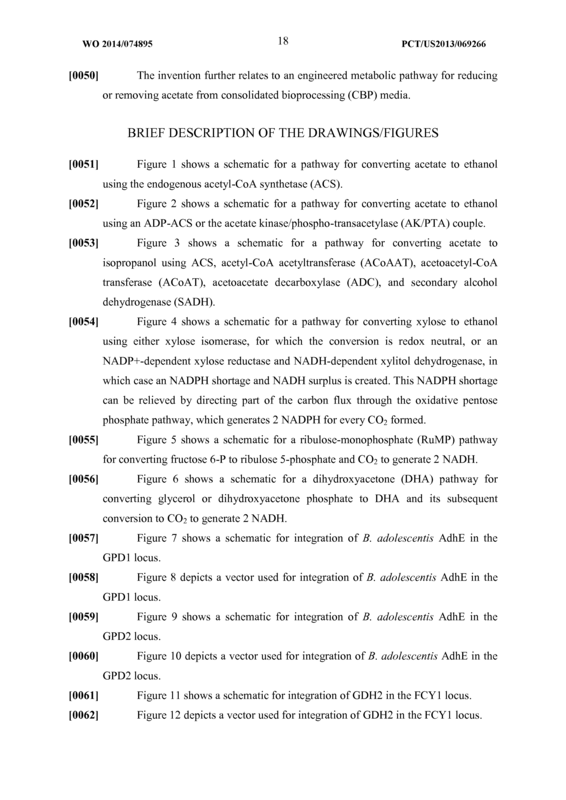 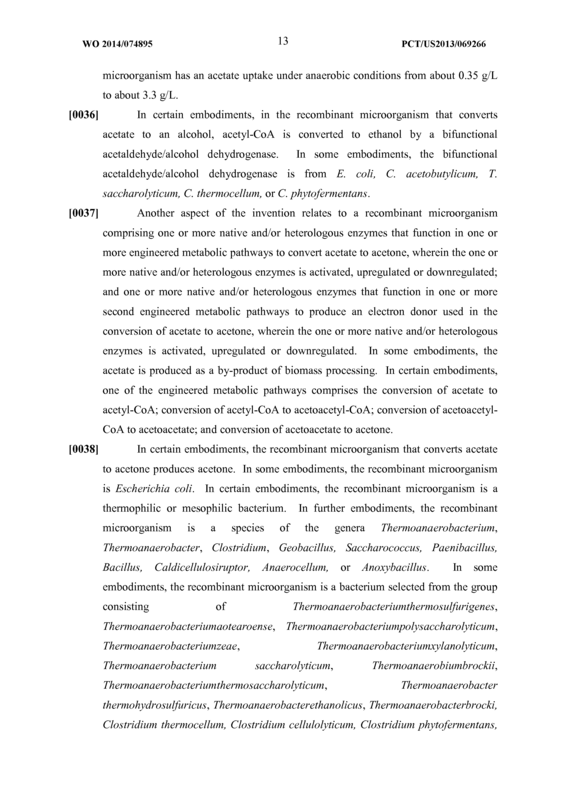 More specifically, the invention provides for a recombinant microorganism comprising one or more native and/or heterologous enzymes that function in one or more first engineered metabolic pathways to achieve: (1) conversion of acetate to ethanol; (2) conversion of acetate to acetone; or (3) conversion of acetate to isopropanol; and one or more native and/or heterologous enzymes that function in one or more second engineered metabolic pathways to produce an electron donor used in the conversion of acetate to less inhibitory compounds; wherein the one or more native and/or heterologous enzymes is activated, upregulated, or downregulated. 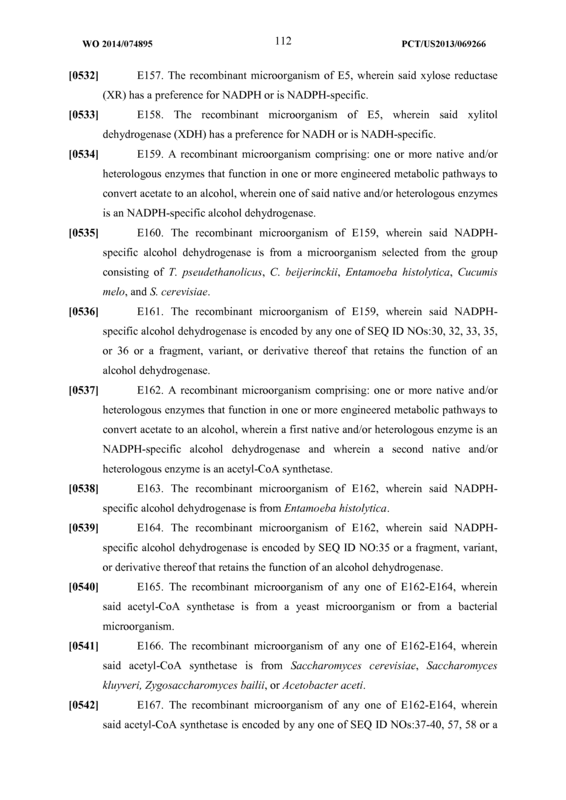 A recombinant microorganism comprising: a) one or more native and/or heterologous enzymes that function in a first engineered metabolic pathway to convert acetate to an alcohol, wherein said one or more native and/or heterologous enzymes is activated, upregulated or downregulated and is recombinantly introduced into said microorganism; and b) one or more native and/or heterologous enzymes that function in a second engineered metabolic pathway to produce NADH, NADPH, or a combination thereof for use in the conversion of acetate to an alcohol, wherein said one or more native and/or heterologous enzymes is activated, upregulated or downregulated and is recombinantly introduced into said microorganism. 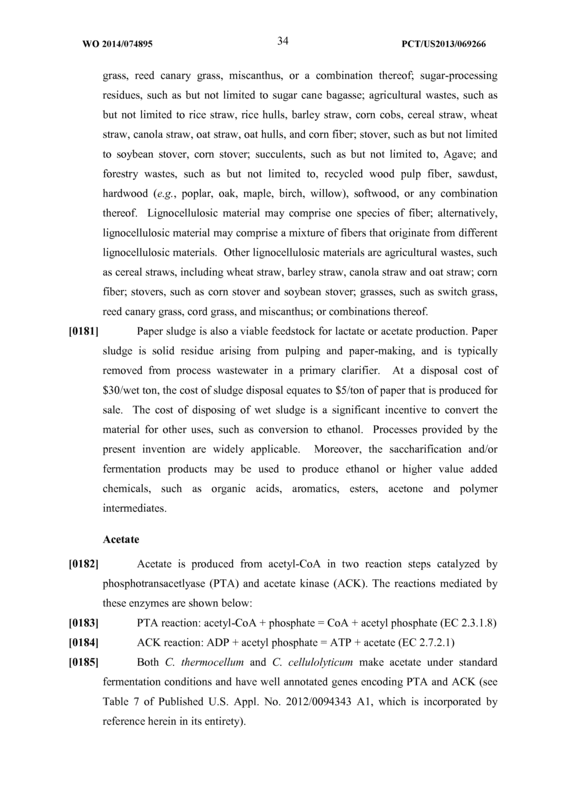 The recombinant microorganism of claim 1, wherein said acetate is produced as a byproduct of biomass processing. 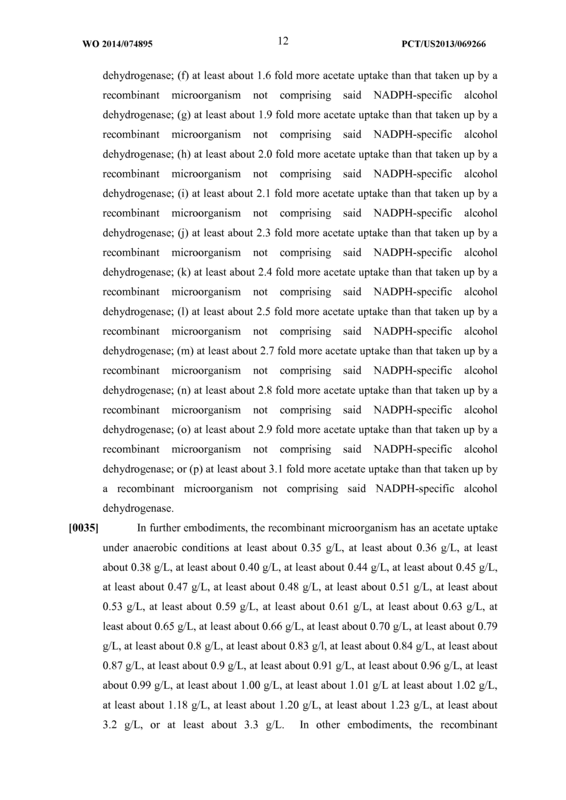 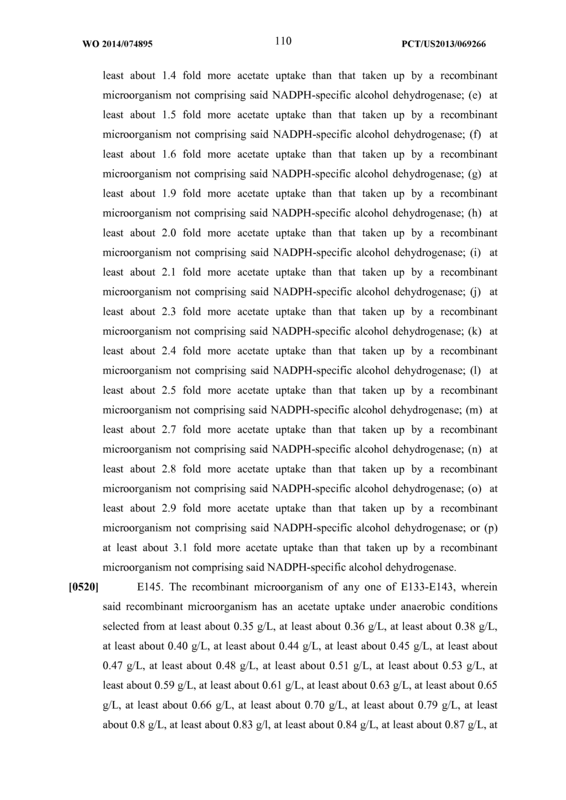 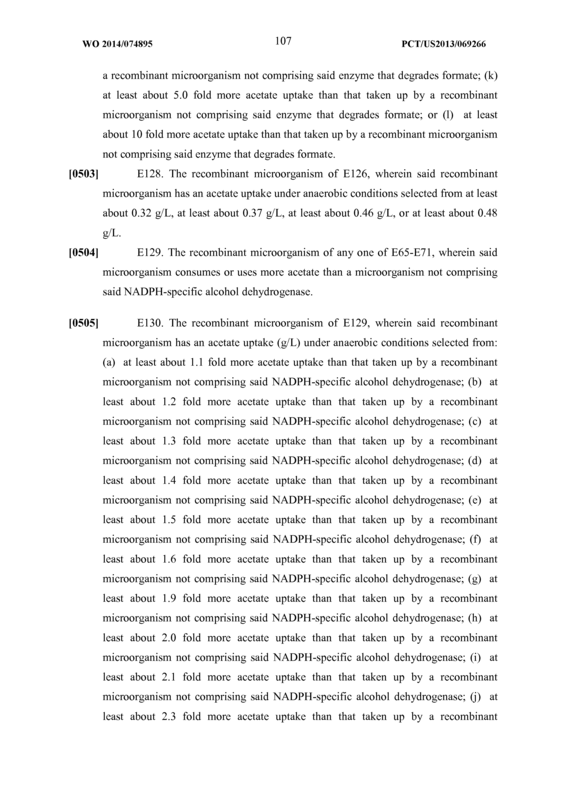 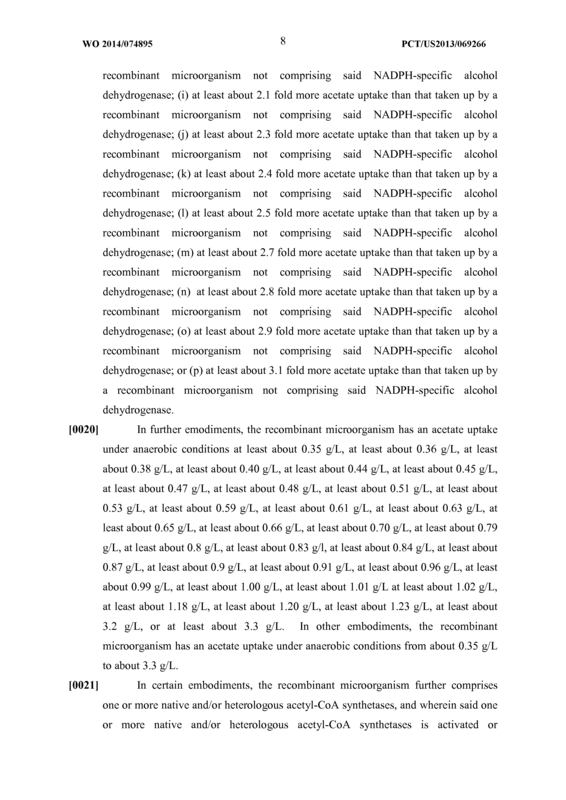 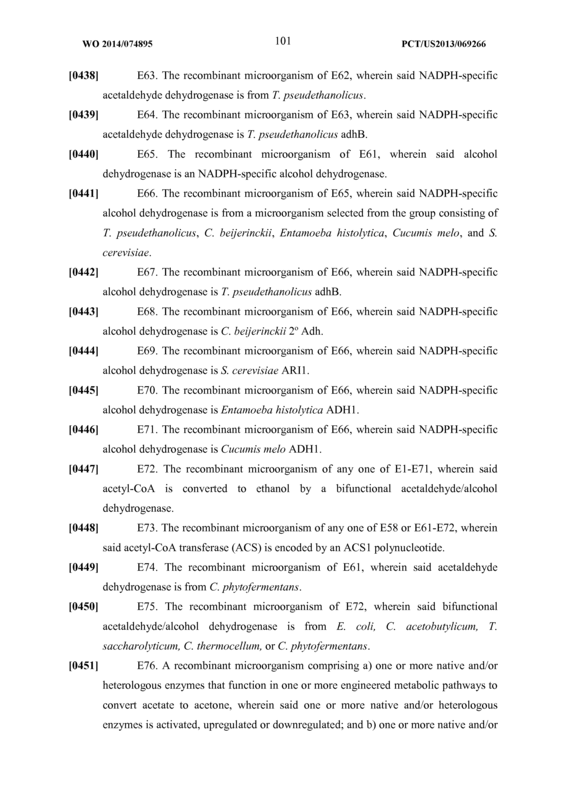 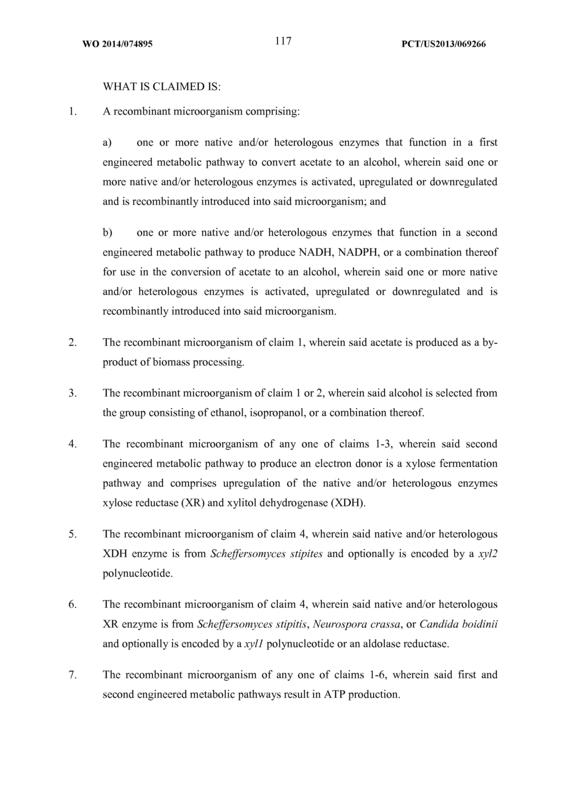 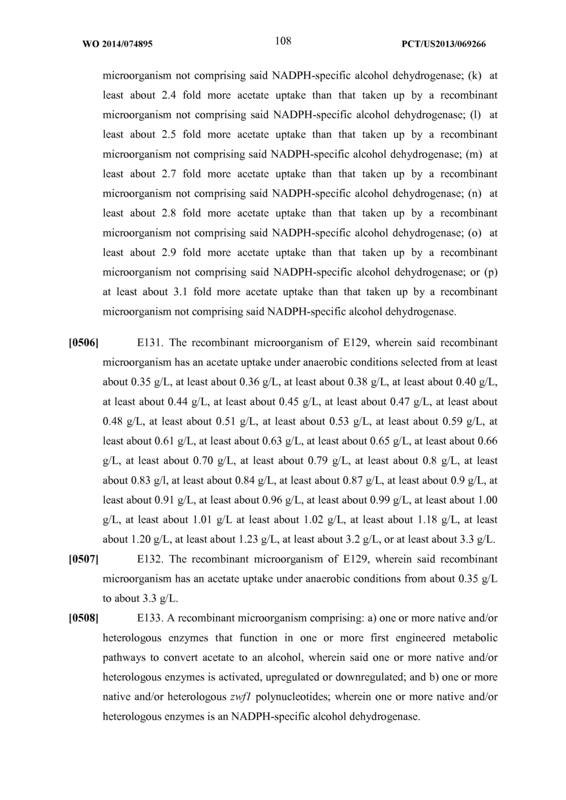 The recombinant microorganism of claim 1 or 2, wherein said alcohol is selected from the group consisting of ethanol, isopropanol, or a combination thereof. 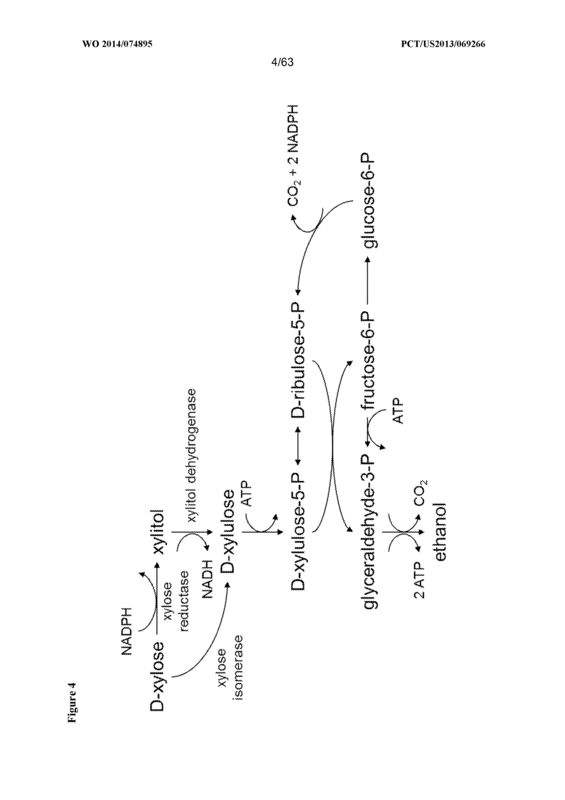 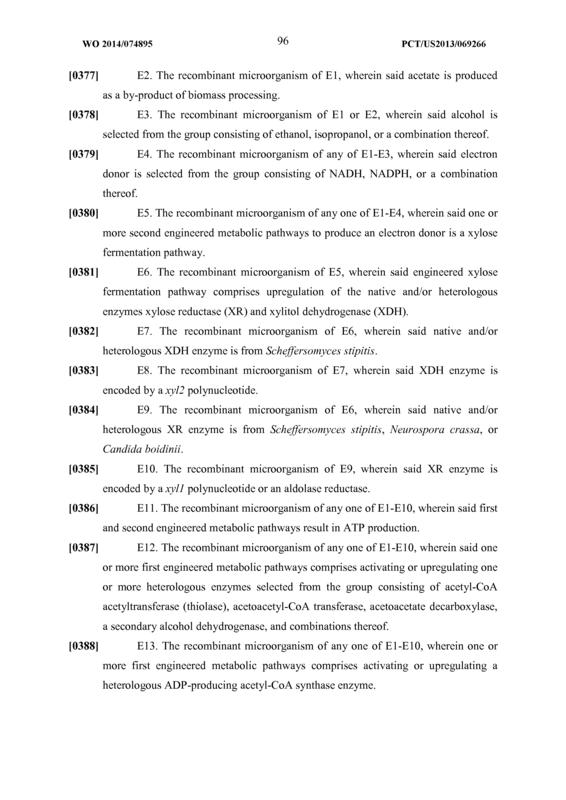 The recombinant microorganism of any one of claims 1-3, wherein said second engineered metabolic pathway to produce an electron donor is a xylose fermentation pathway and comprises upregulation of the native and/or heterologous enzymes xylose reductase (XR) and xylitol dehydrogenase (XDH). 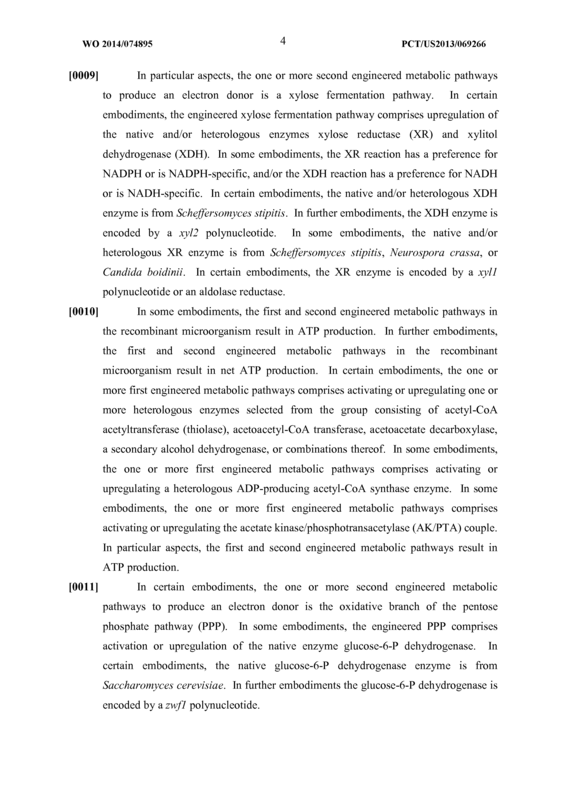 The recombinant microorganism of claim 4, wherein said native and/or heterologous XDH enzyme is from Scheffersomyces stipites and optionally is encoded by a xyl2 polynucleotide. 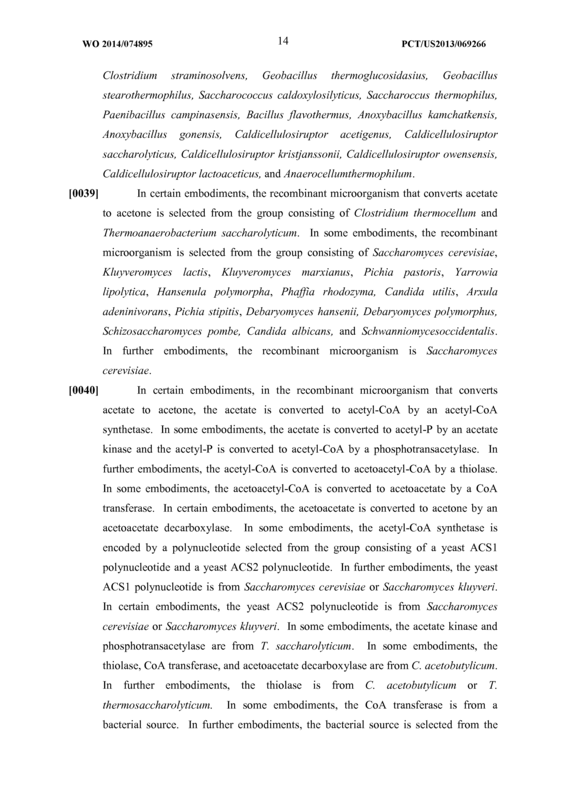 The recombinant microorganism of claim 4, wherein said native and/or heterologous XR enzyme is from Scheffersomyces stipitis, Neurospora crassa, or Candida boidinii and optionally is encoded by a xyll polynucleotide or an aldolase reductase. 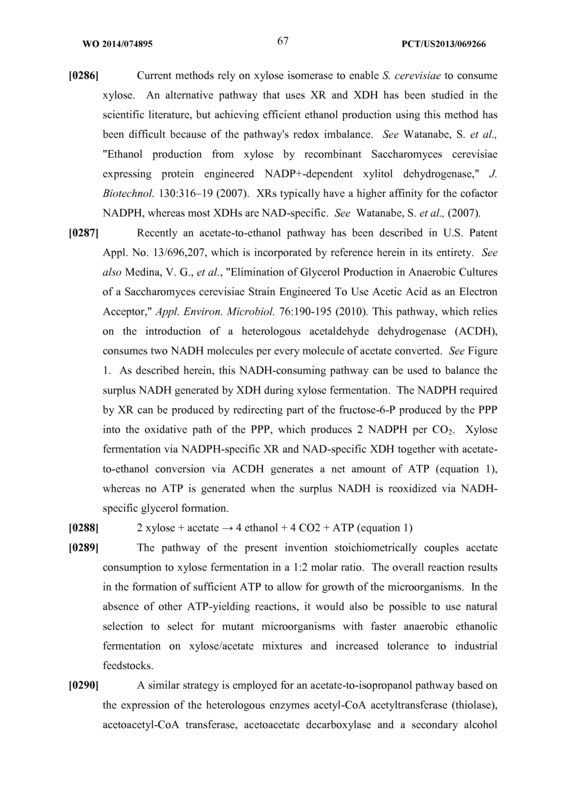 The recombinant microorganism of any one of claims 1-6, wherein said first and second engineered metabolic pathways result in ATP production. 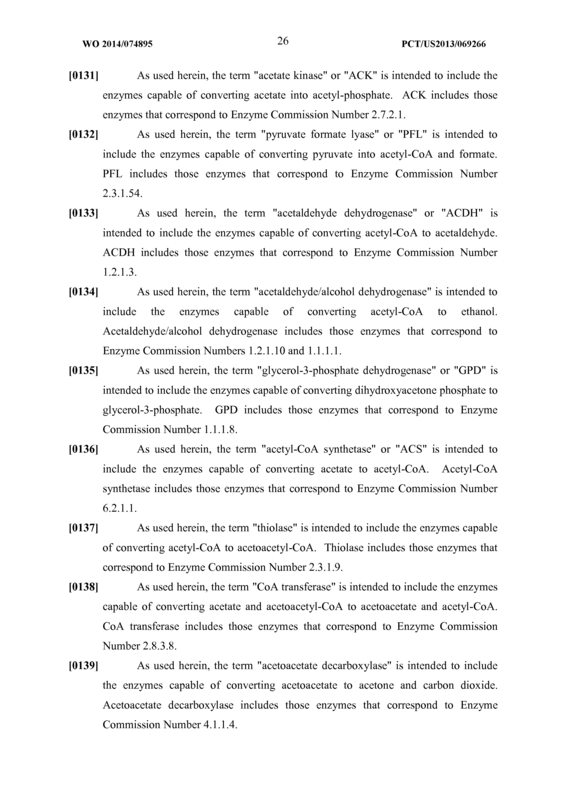 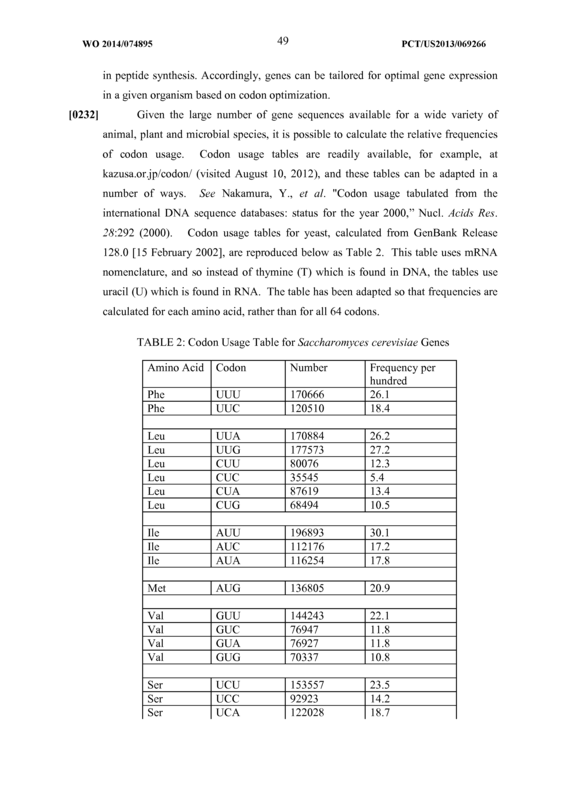 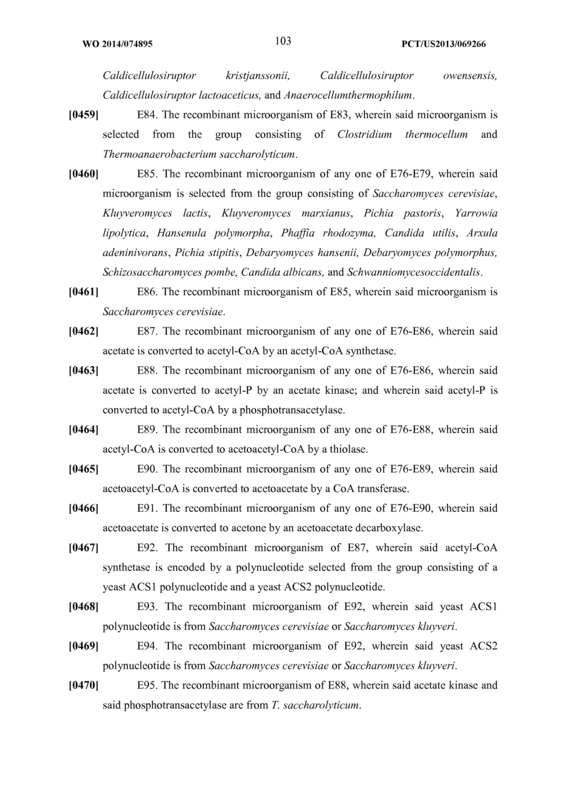 The recombinant microorganism of any one of claims 1-7, wherein said first engineered metabolic pathways comprises activating or upregulating one or more heterologous enzymes selected from the group consisting of acetyl-CoA acetyltransferase (thiolase), acetoacetyl-CoA transferase, acetoacetate decarboxylase, a secondary alcohol dehydrogenase, and combinations thereof. 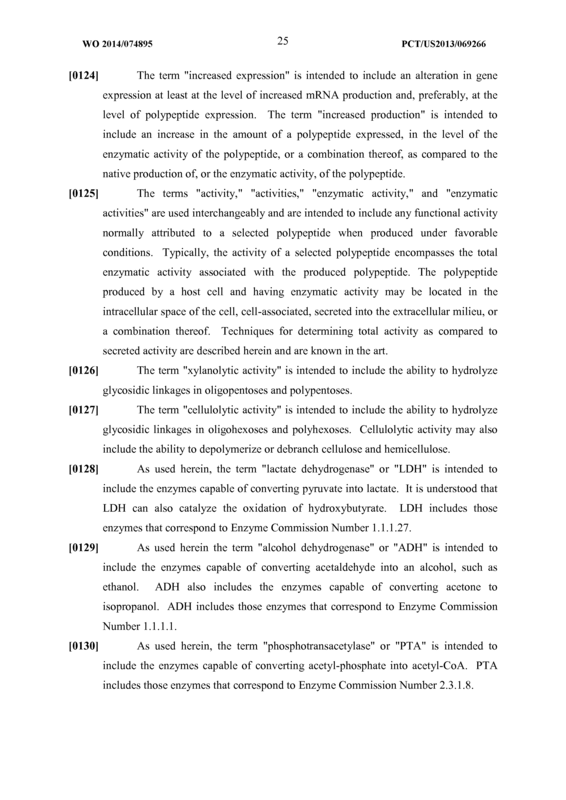 The recombinant microorganism of any one of claims 1-8, wherein said first engineered metabolic pathways comprises activating or upregulating a heterologous ADP-producing acetyl-CoA synthase enzyme. 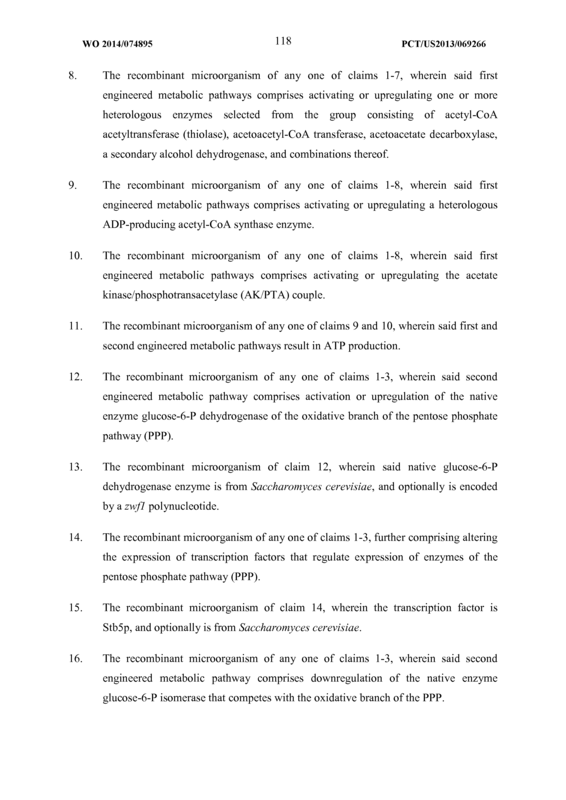 The recombinant microorganism of any one of claims 1-8, wherein said first engineered metabolic pathways comprises activating or upregulating the acetate kinase/phosphotransacetylase (AK/PTA) couple. 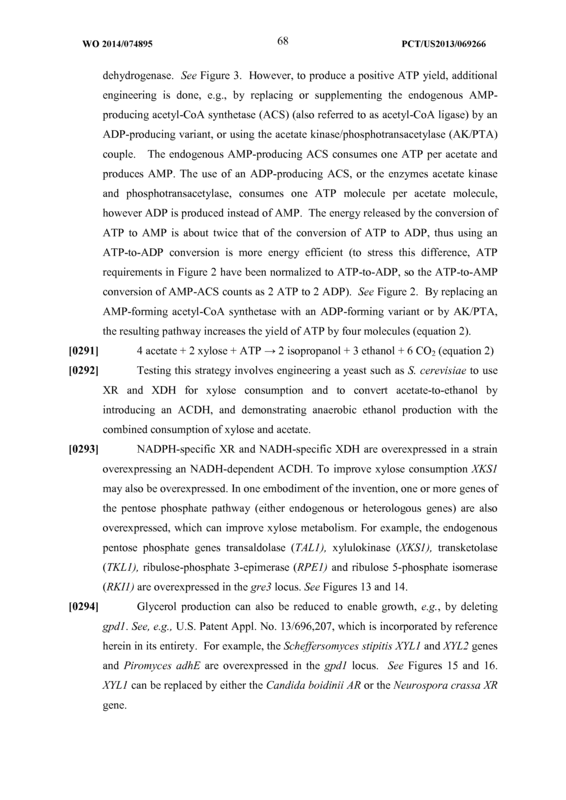 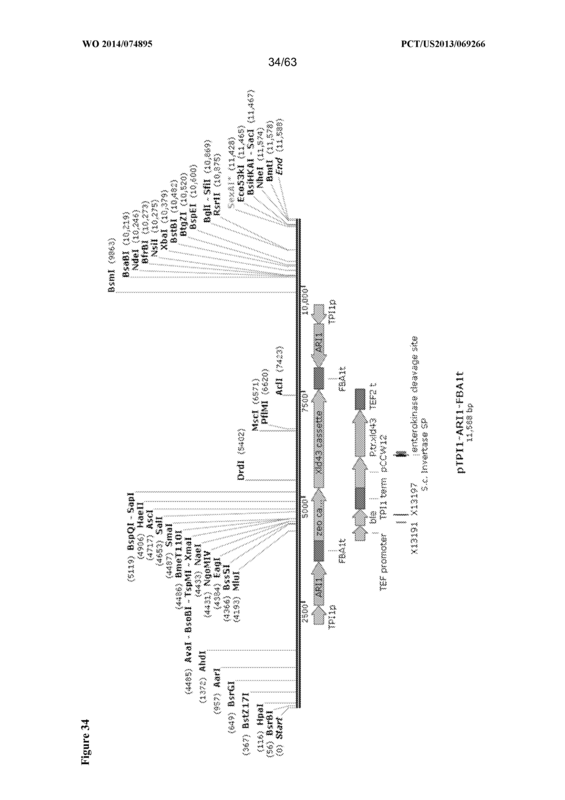 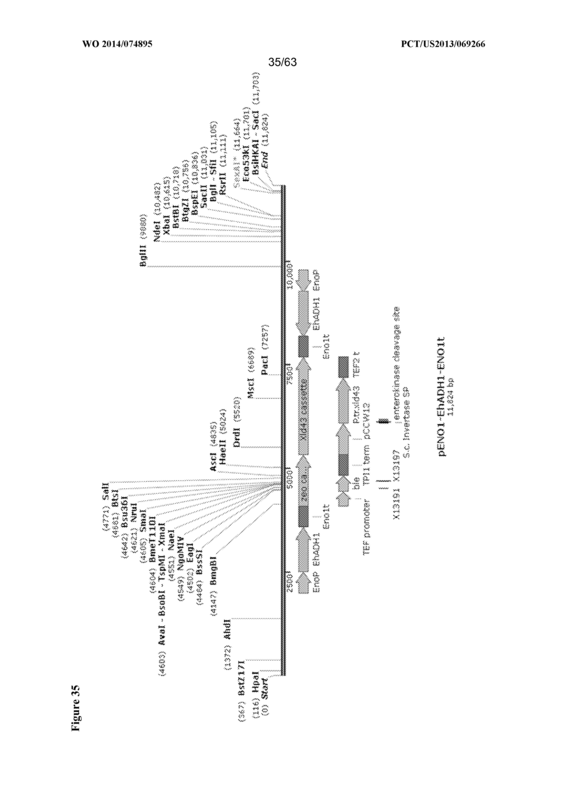 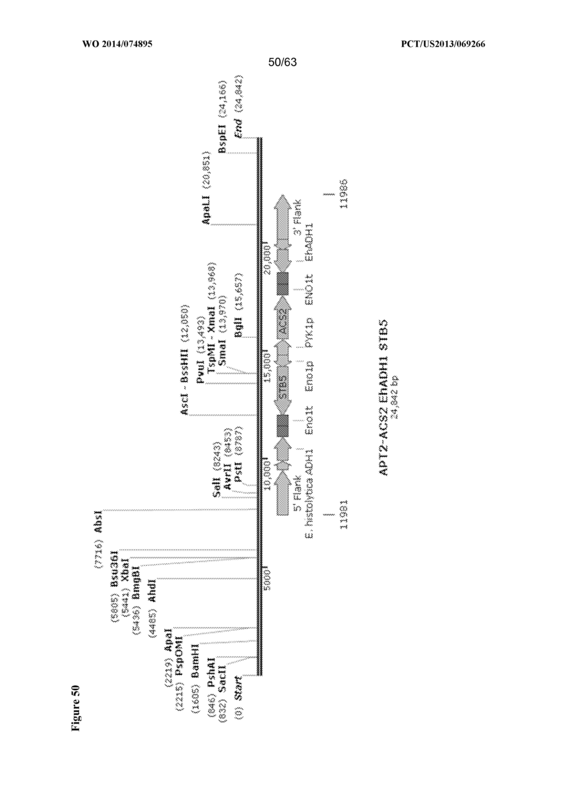 The recombinant microorganism of any one of claims 9 and 10, wherein said first and second engineered metabolic pathways result in ATP production. 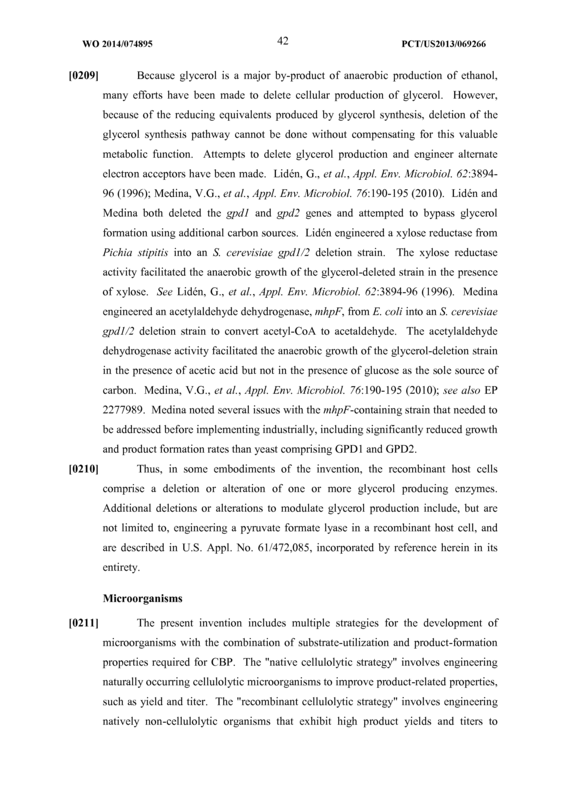 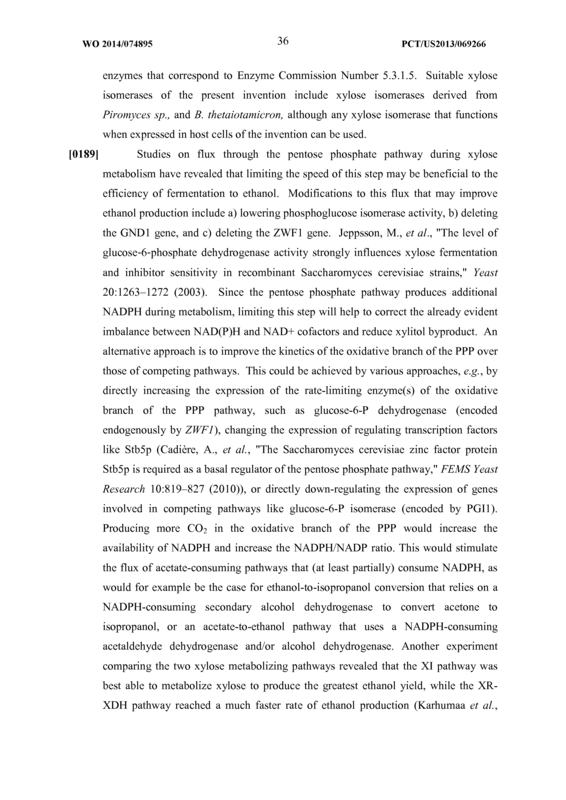 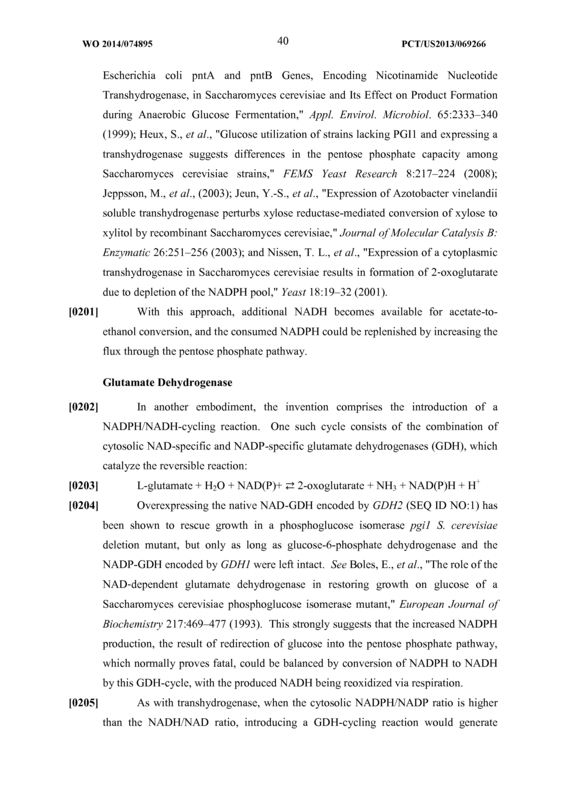 The recombinant microorganism of any one of claims 1-3, wherein said second engineered metabolic pathway comprises activation or upregulation of the native enzyme glucose-6-P dehydrogenase of the oxidative branch of the pentose phosphate pathway (PPP). 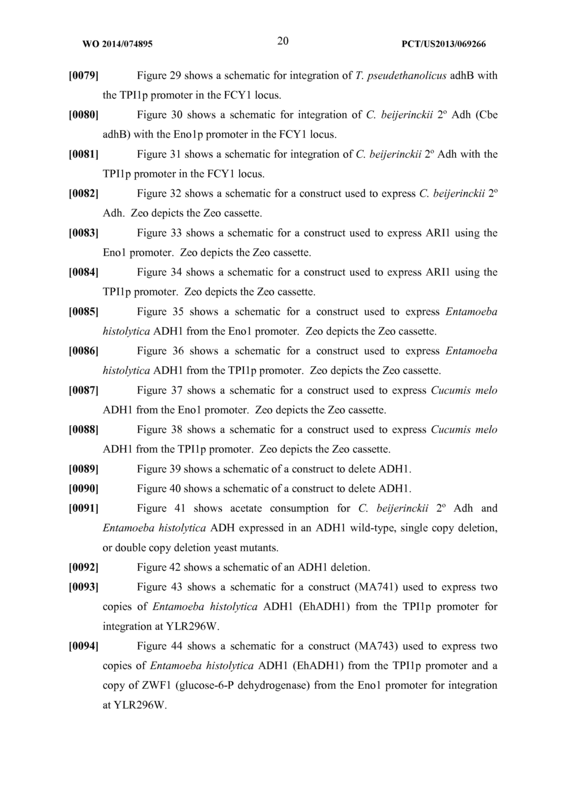 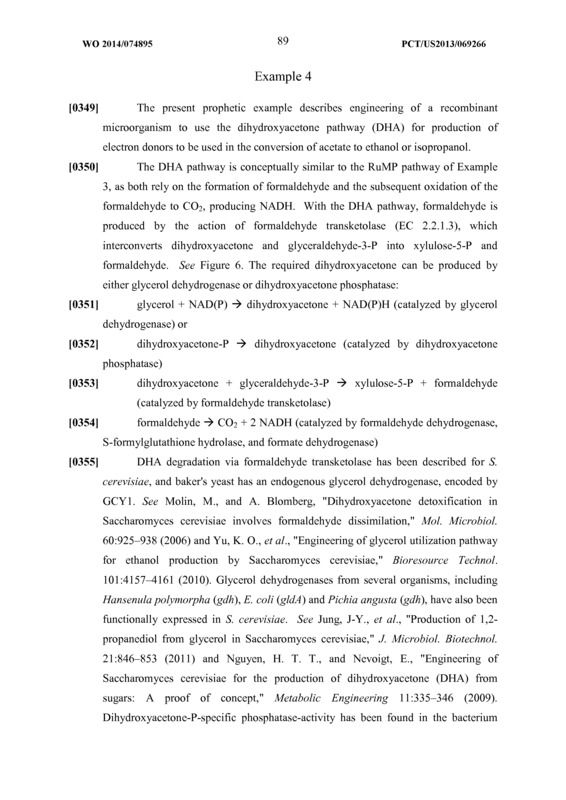 The recombinant microorganism of claim 12, wherein said native glucose-6-P dehydrogenase enzyme is from Saccharomyces cerevisiae, and optionally is encoded by a zwfl polynucleotide. 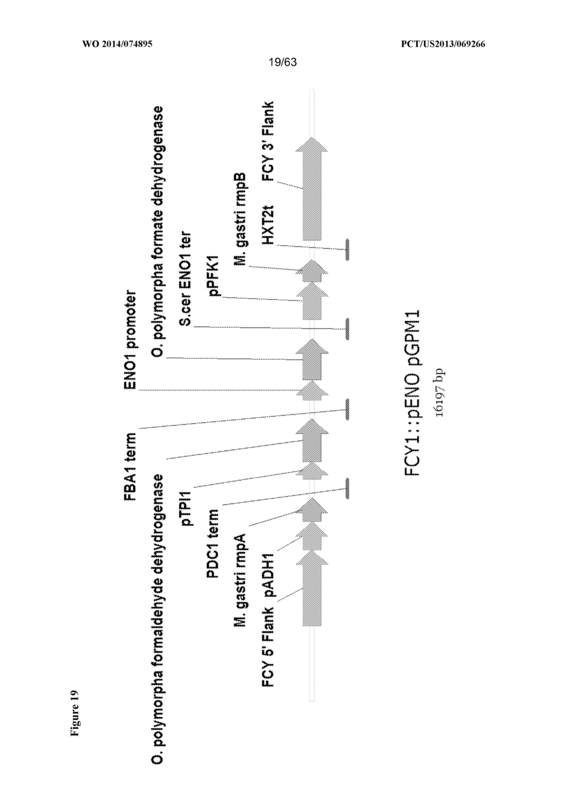 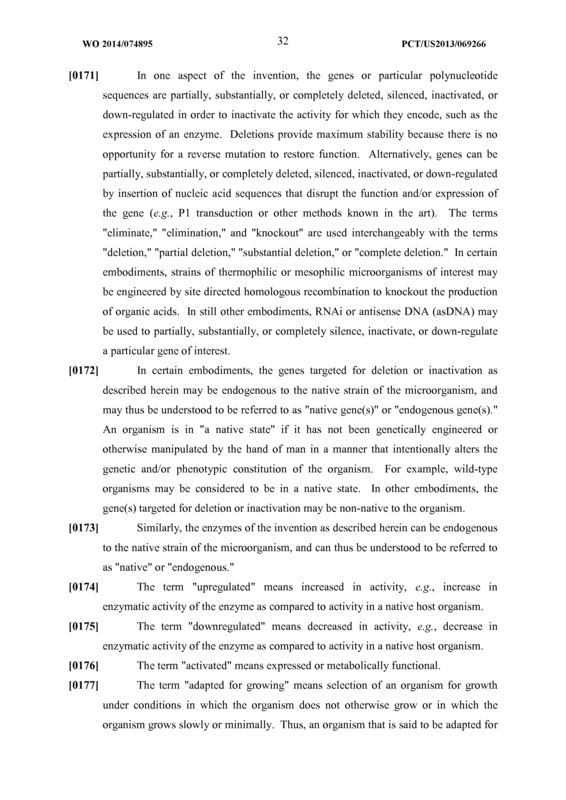 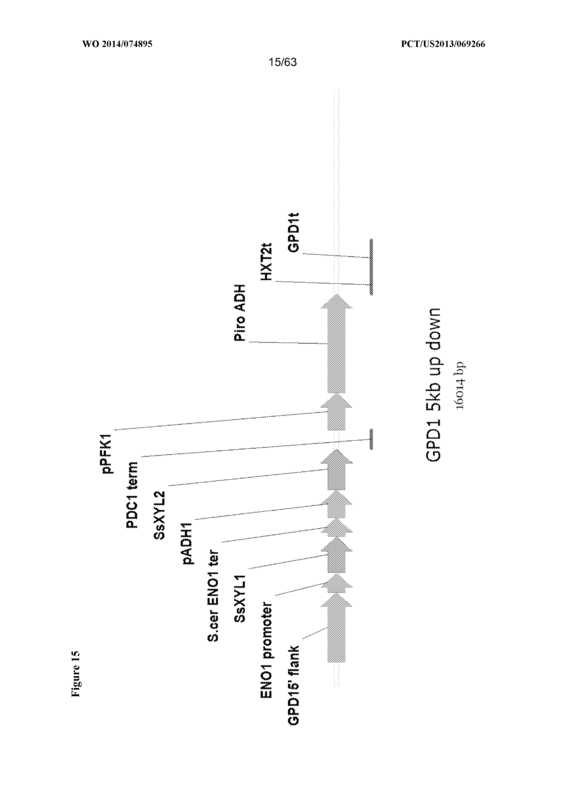 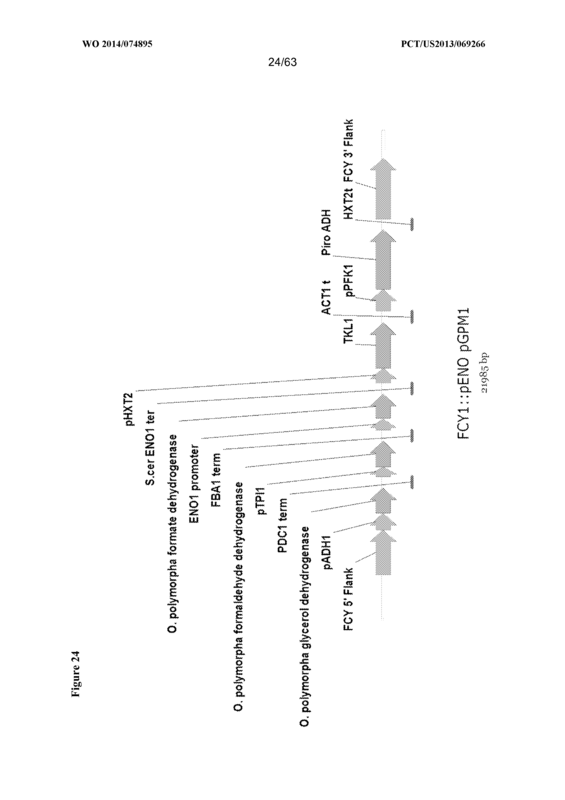 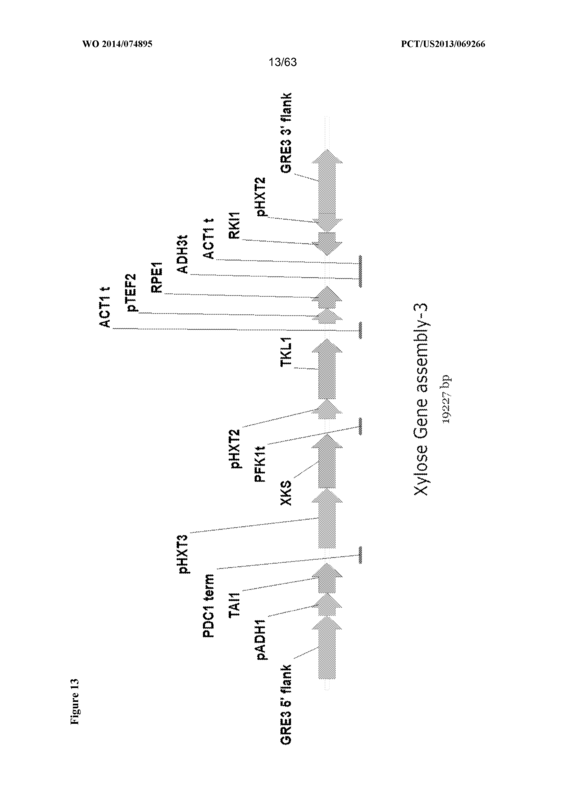 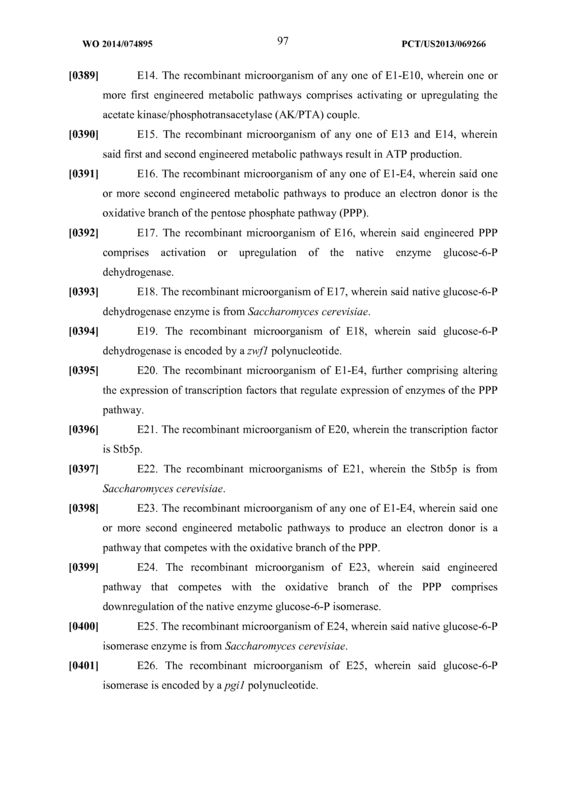 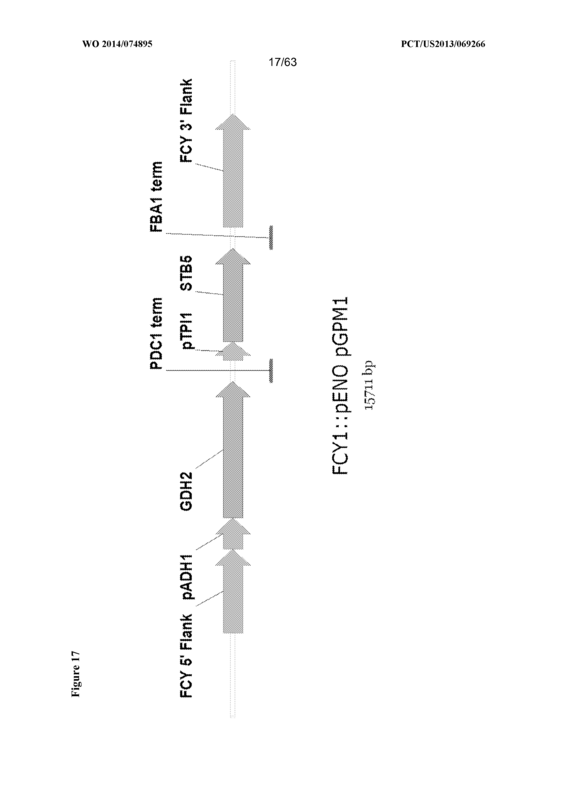 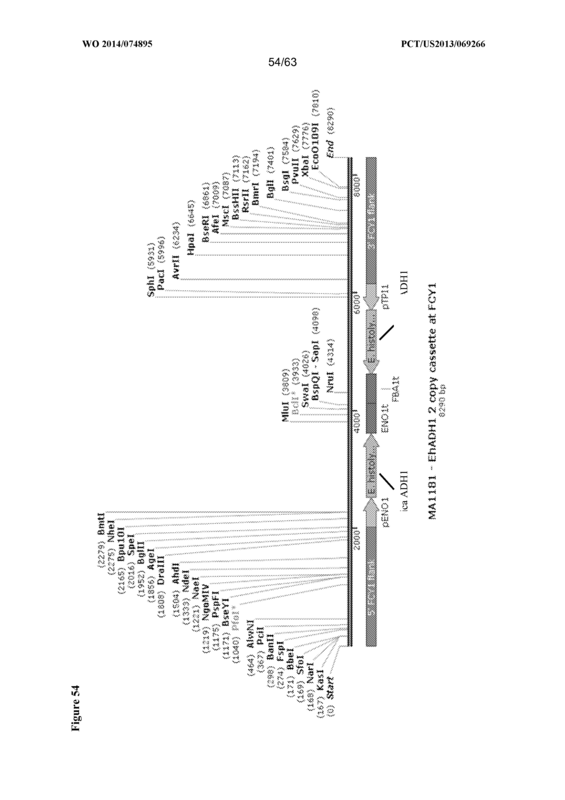 The recombinant microorganism of any one of claims 1-3, further comprising altering the expression of transcription factors that regulate expression of enzymes of the pentose phosphate pathway (PPP). 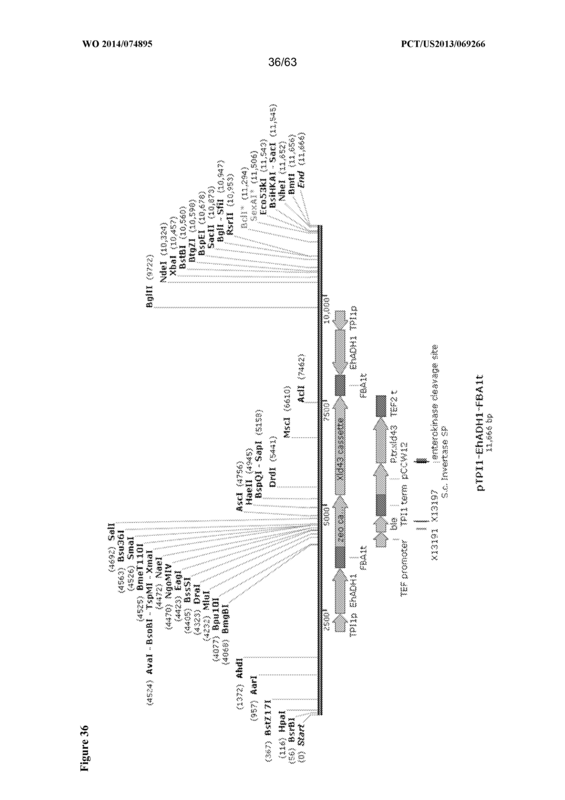 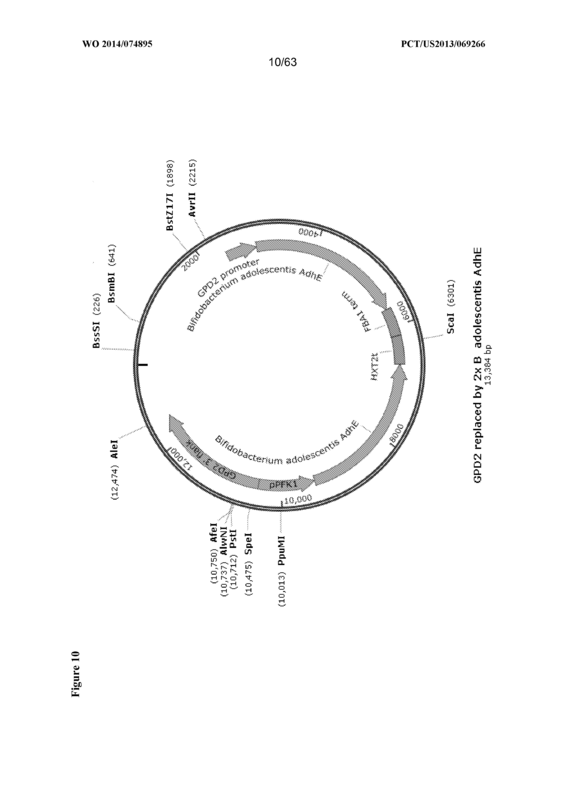 The recombinant microorganism of claim 14, wherein the transcription factor is Stb5p, and optionally is from Saccharomyces cerevisiae. 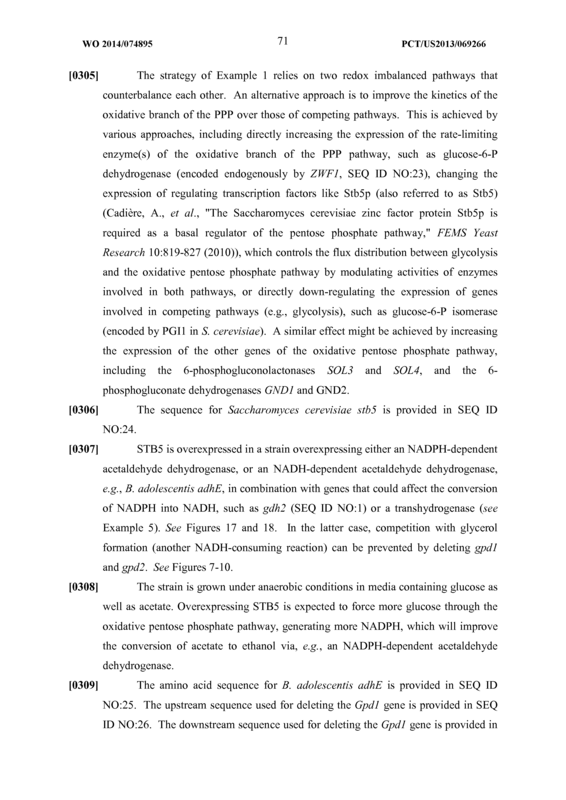 The recombinant microorganism of any one of claims 1-3, wherein said second engineered metabolic pathway comprises downregulation of the native enzyme glucose-6-P isomerase that competes with the oxidative branch of the PPP. 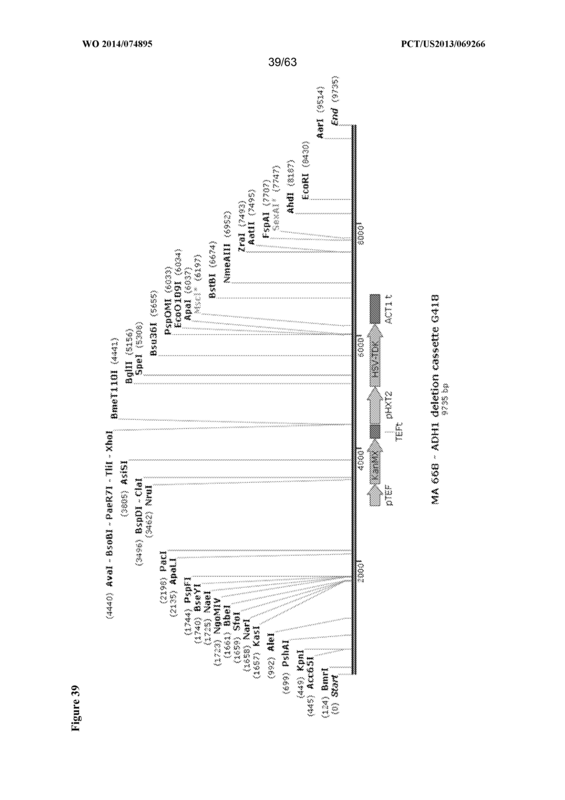 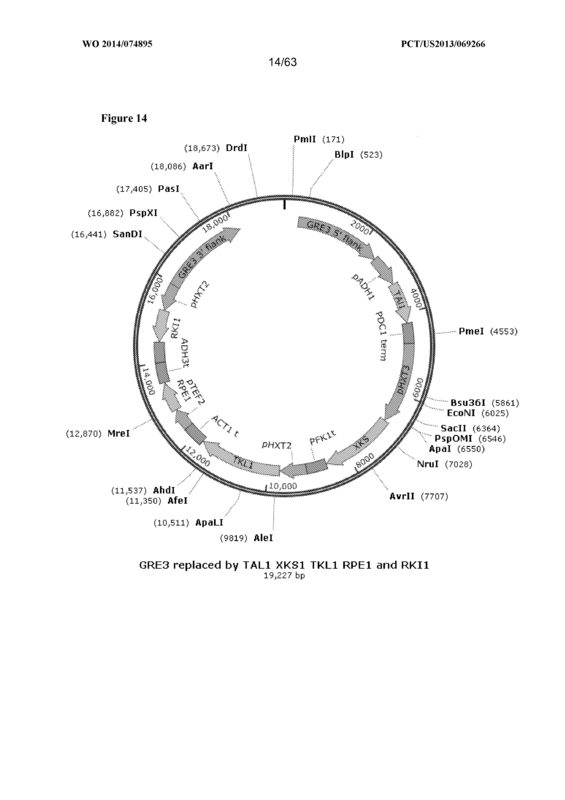 The recombinant microorganism of claim 16, wherein said native glucose-6-P isomerase enzyme is from Saccharomyces cerevisiae, and optionally is encoded by a pgil polynucleotide. 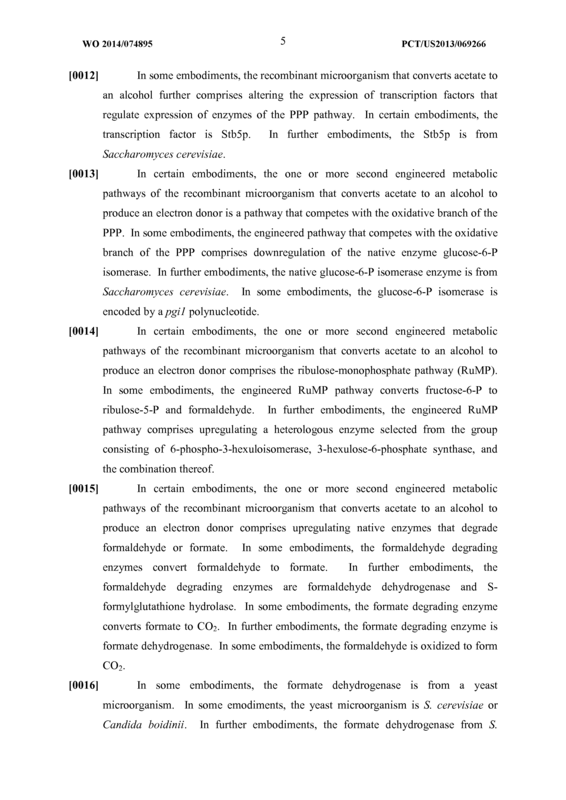 The recombinant microorganism of any one of claims 1-3, wherein said second engineered metabolic pathway to produce an electron donor comprises the ribulose- monophosphate pathway (RuMP) that converts fructose-6-P to ribulose-5-P and formaldehyde. 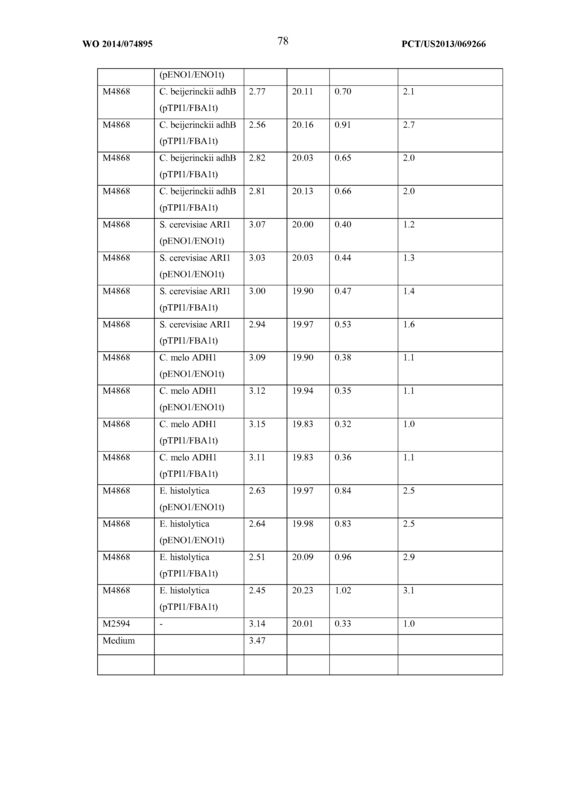 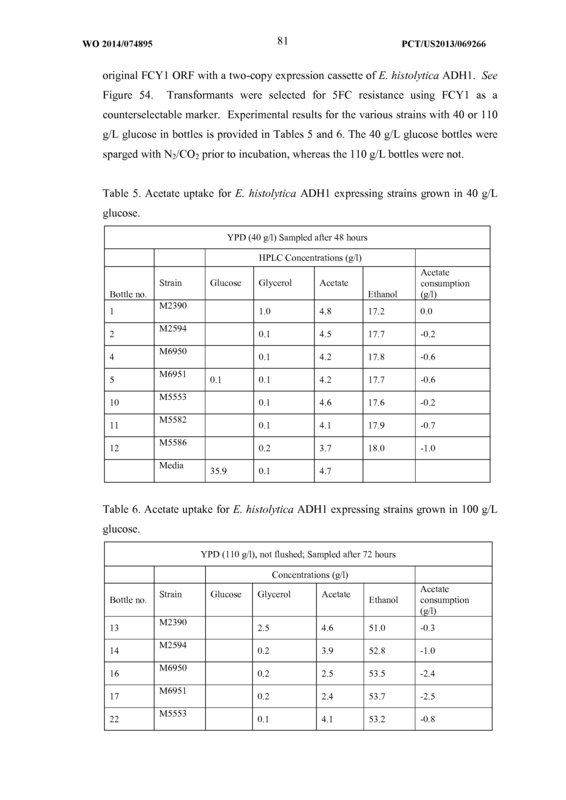 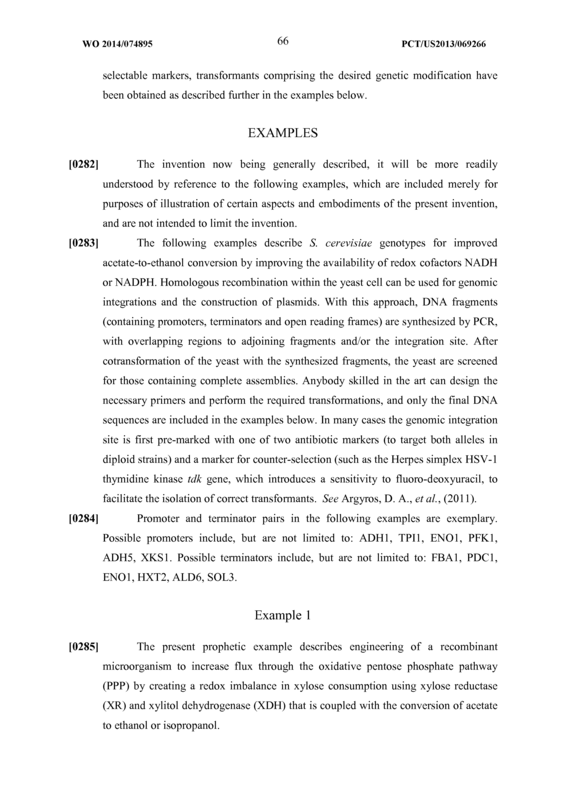 The recombinant microorganism of claim 18, wherein said RuMP pathway comprises upregulating a heterologous enzyme selected from the group consisting of 6-phospho- 3-hexuloisomerase, 3-hexulose-6-phosphate synthase, and the combination thereof. 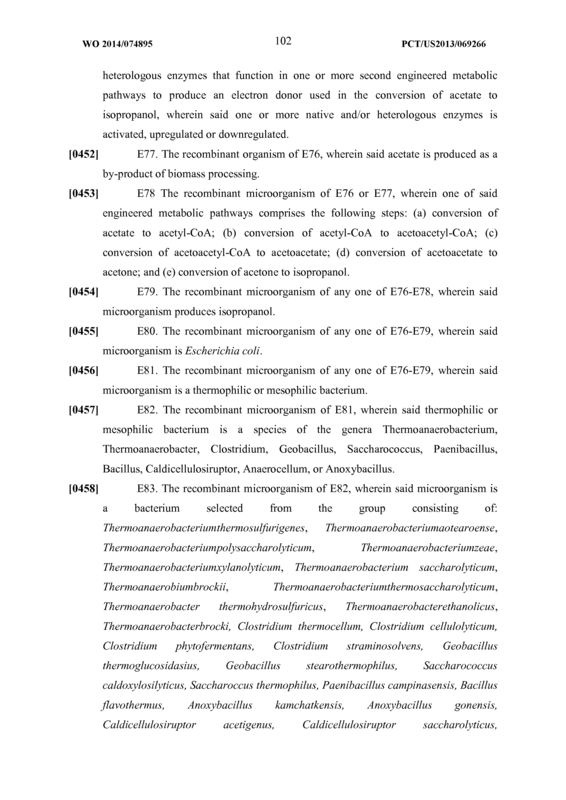 The recombinant microorganism of any one of claims 18 and 19, further comprising upregulating native enzymes that degrade formaldehyde or formate. 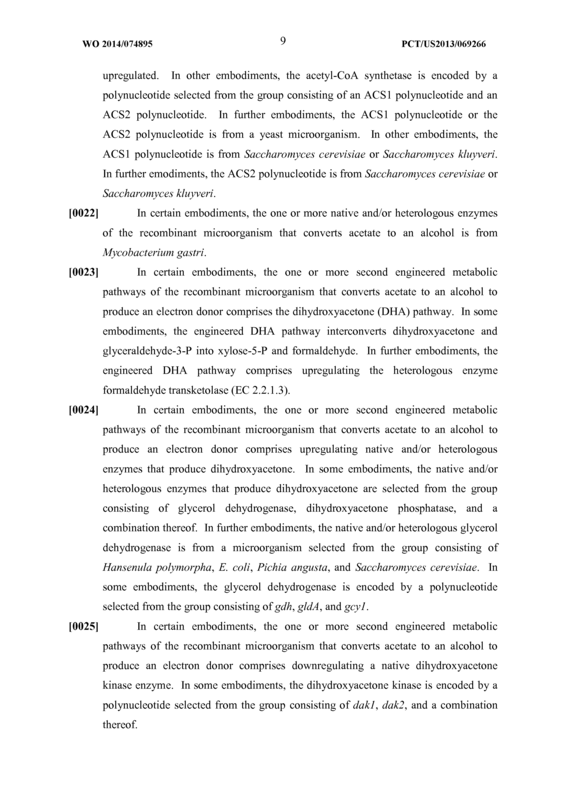 The recombinant microorganism of claim 20, wherein the formaldehyde degrading enzymes are formaldehyde dehydrogenase and S-formylglutathione hydrolase. 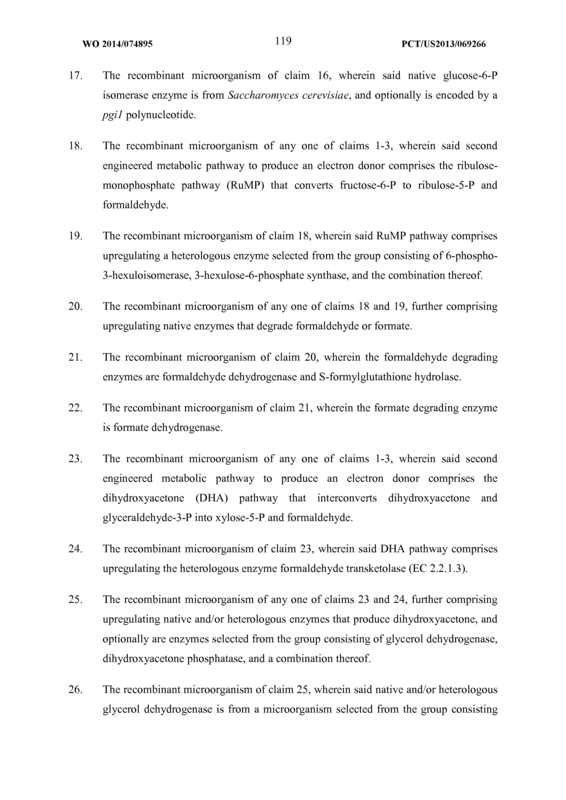 The recombinant microorganism of claim 21, wherein the formate degrading enzyme is formate dehydrogenase. 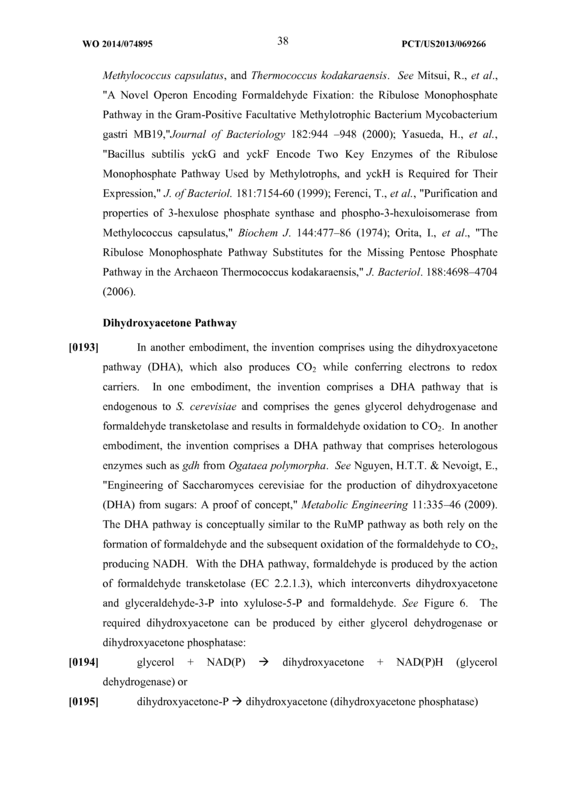 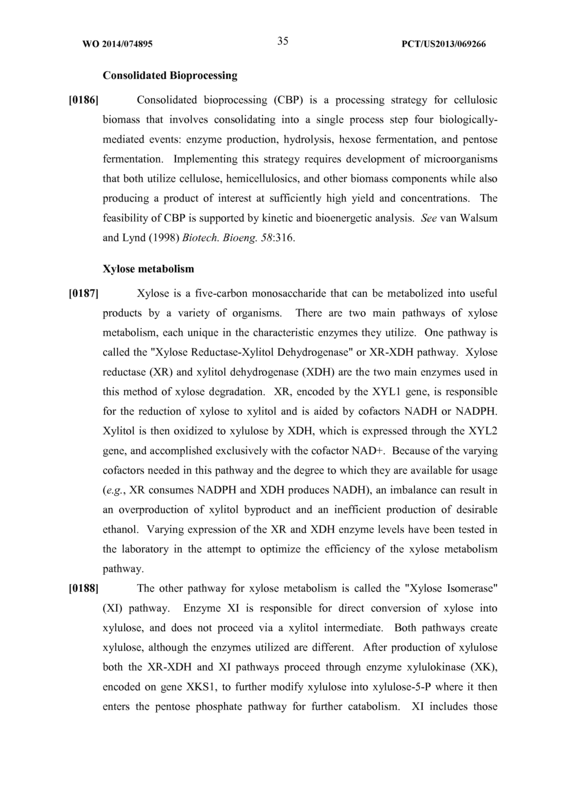 The recombinant microorganism of any one of claims 1-3, wherein said second engineered metabolic pathway to produce an electron donor comprises the dihydroxyacetone (DHA) pathway that interconverts dihydroxyacetone and glyceraldehyde-3-P into xylose-5-P and formaldehyde. 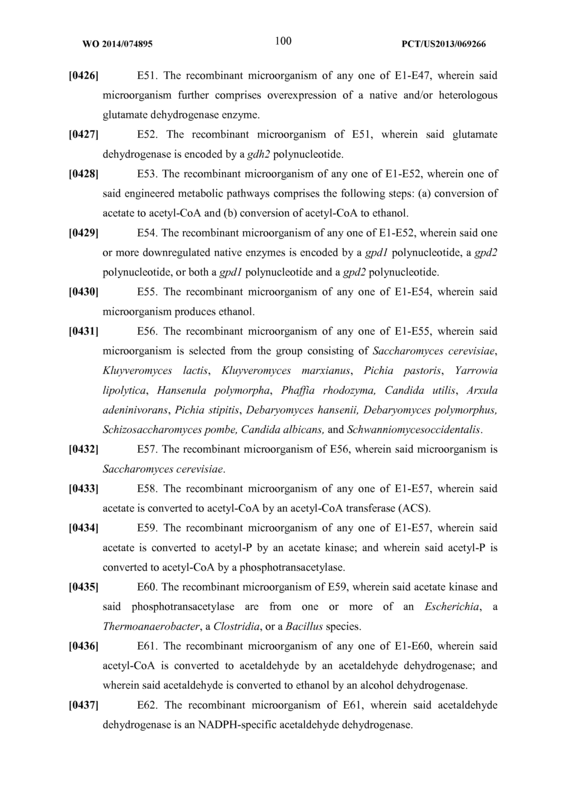 The recombinant microorganism of claim 23, wherein said DHA pathway comprises upregulating the heterologous enzyme formaldehyde transketolase (EC 2.2.1.3). 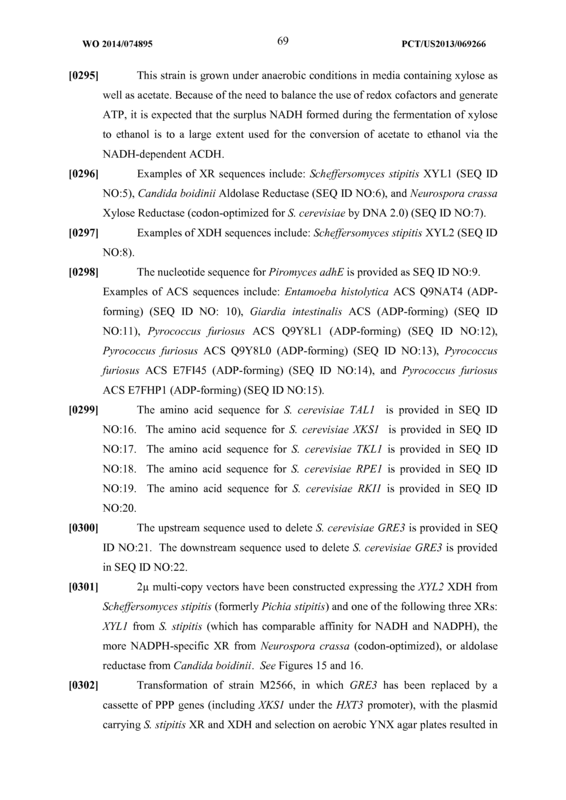 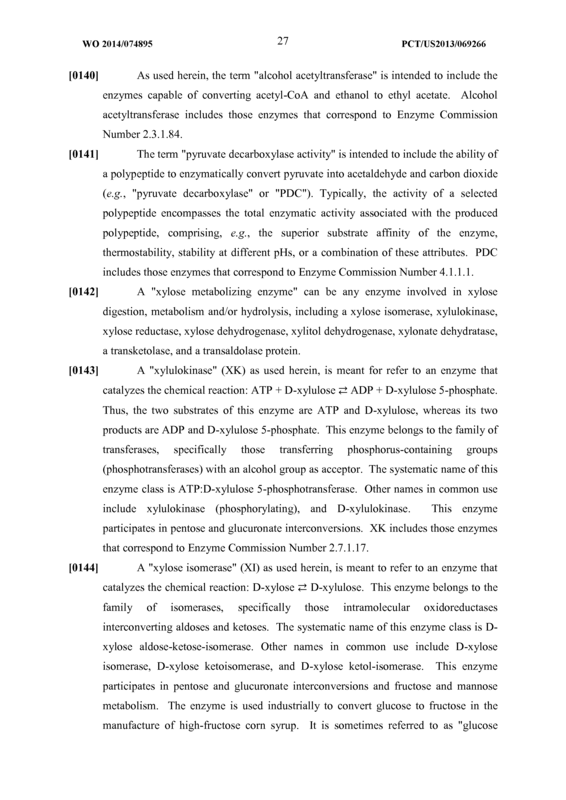 The recombinant microorganism of any one of claims 23 and 24, further comprising upregulating native and/or heterologous enzymes that produce dihydroxyacetone, and optionally are enzymes selected from the group consisting of glycerol dehydrogenase, dihydroxyacetone phosphatase, and a combination thereof. 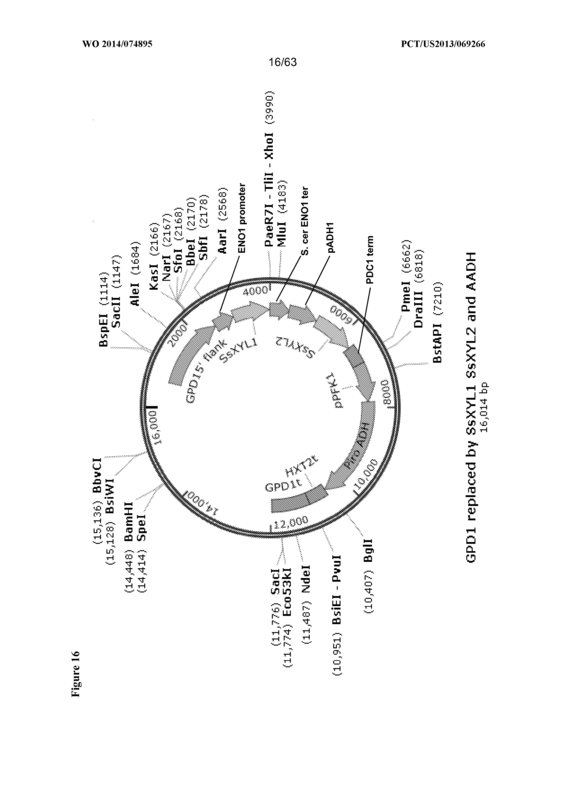 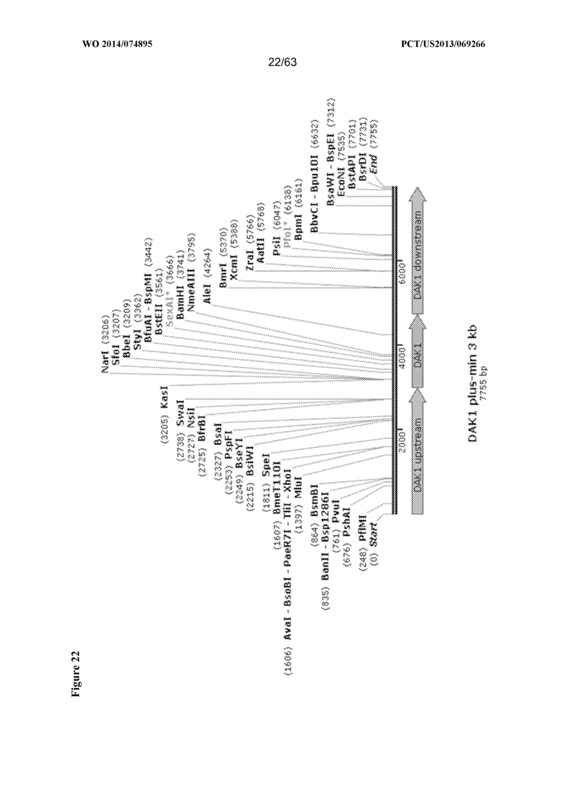 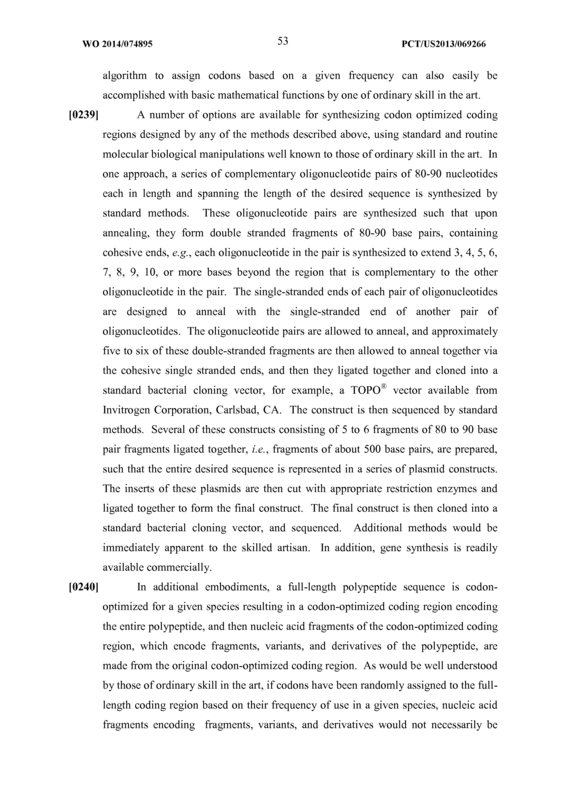 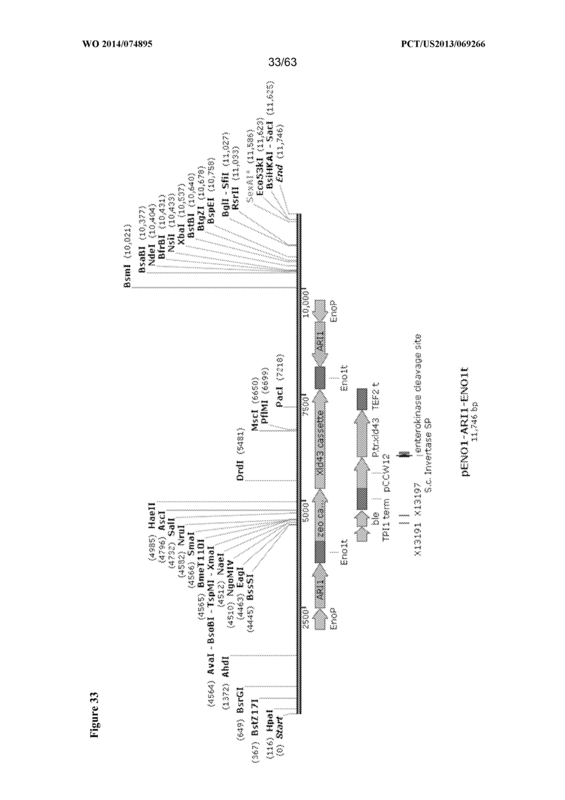 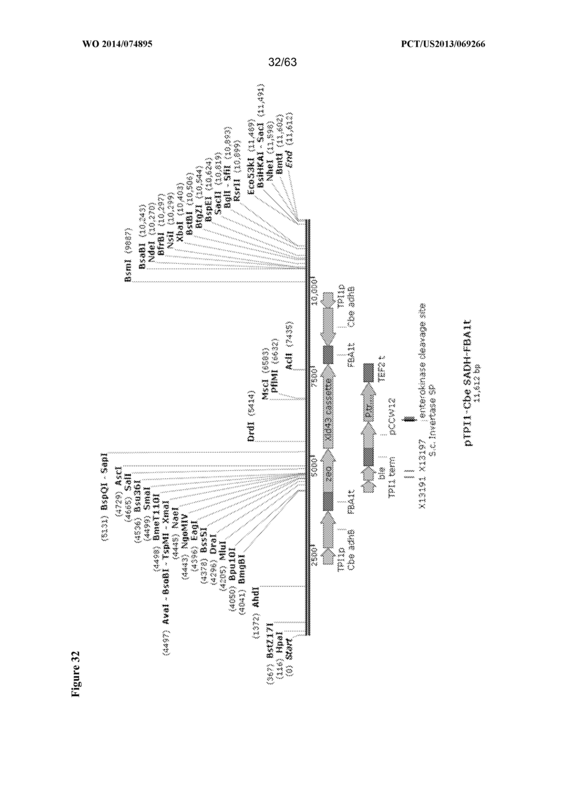 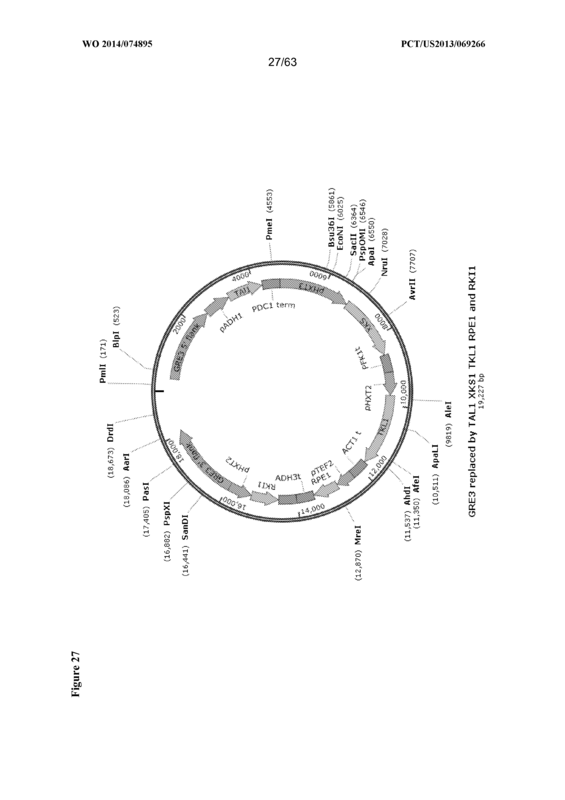 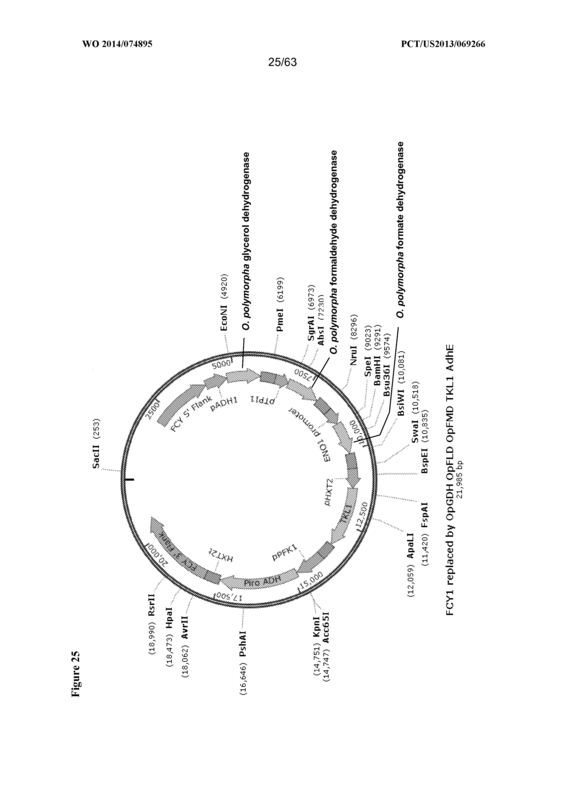 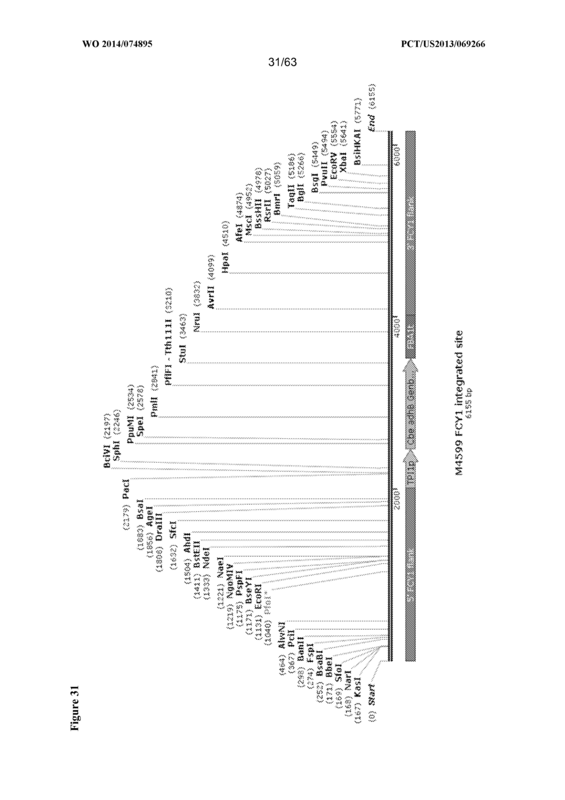 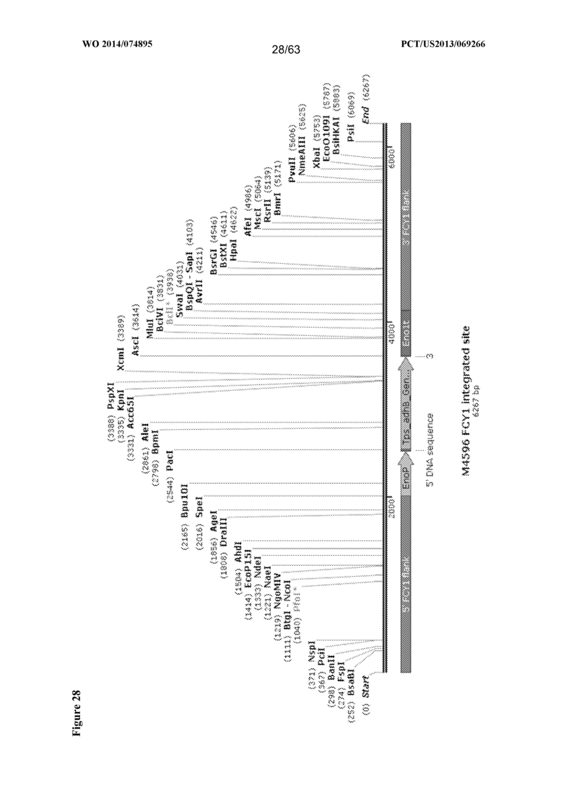 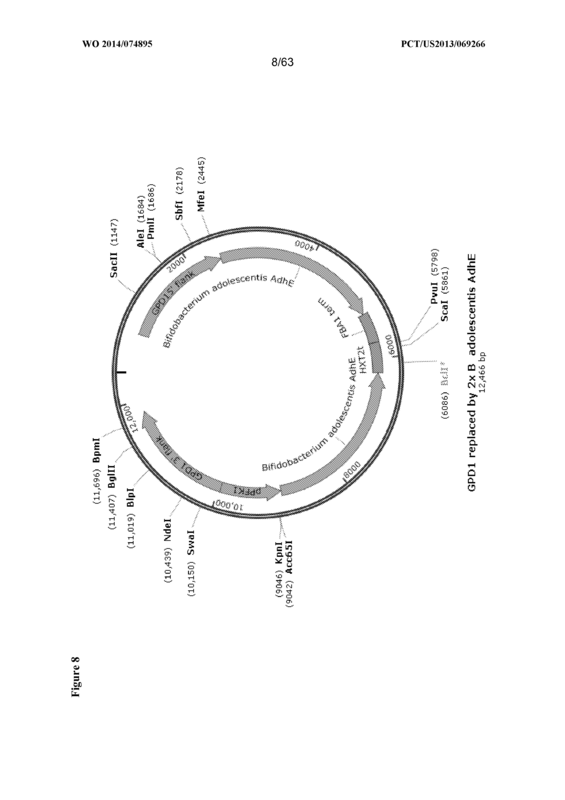 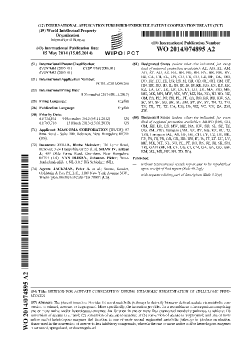 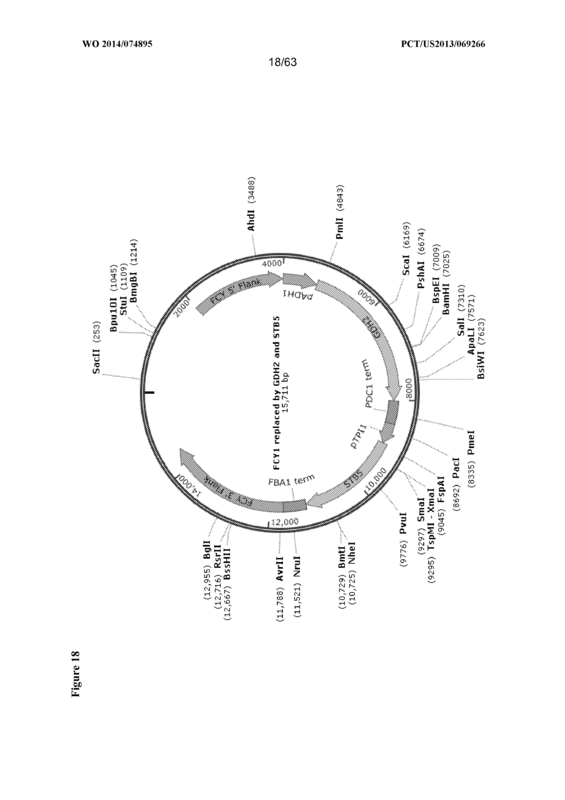 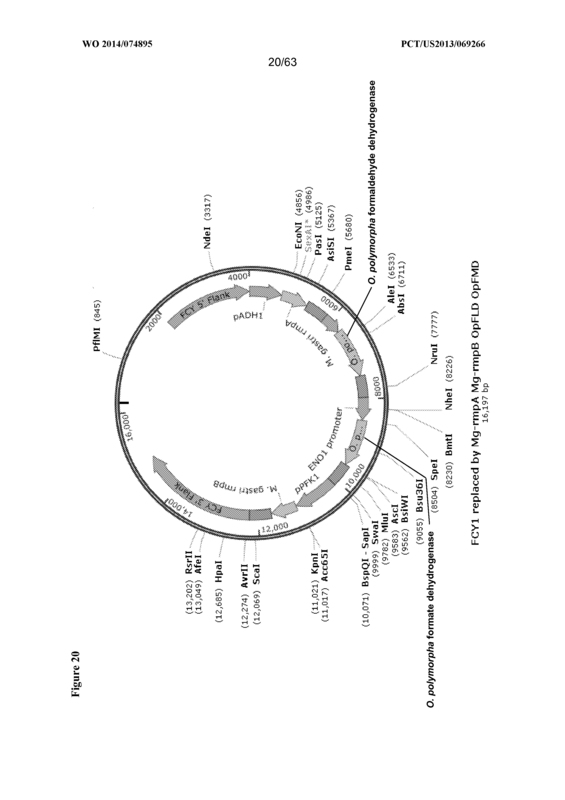 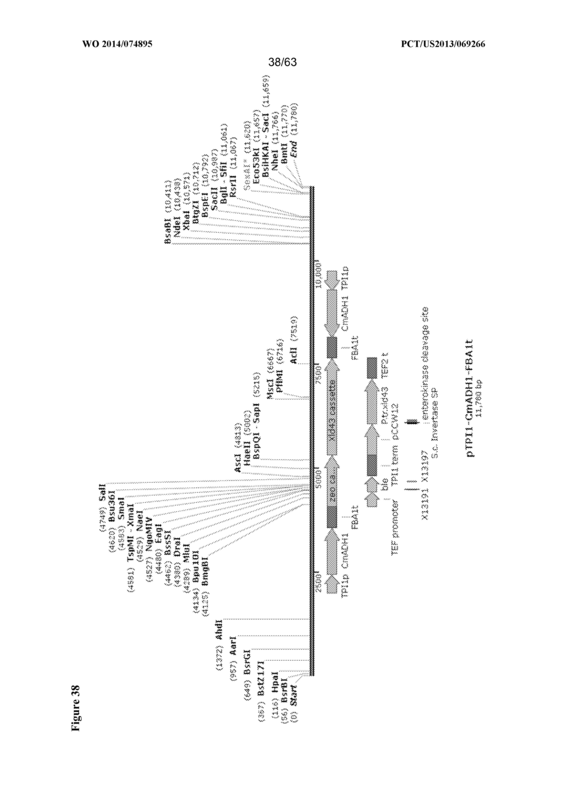 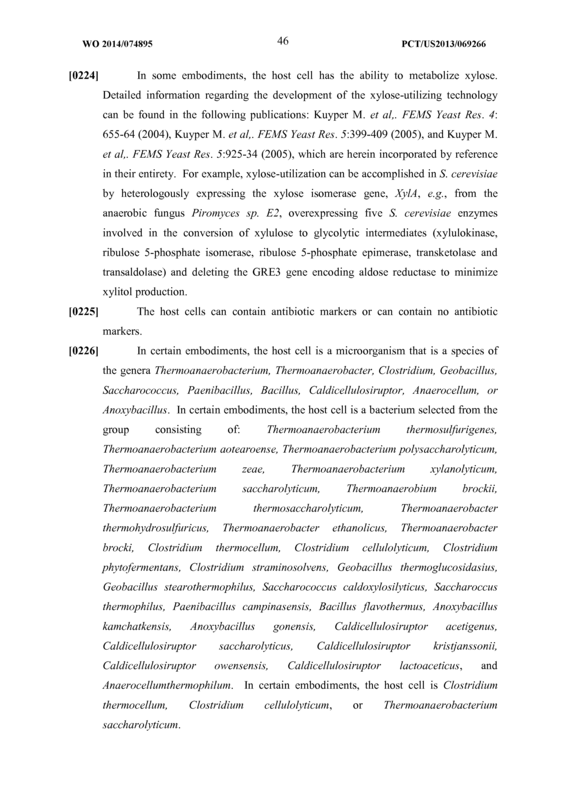 The recombinant microorganism of claim 25, wherein said native and/or heterologous glycerol dehydrogenase is from a microorganism selected from the group consisting of Hansenula polymorpha, E. coli, Pichia angusta, and Saccharomyces cerevisiae, and optionally are encoded by a polynucleotide selected from the group consisting of gdh, gldA, and gey I. 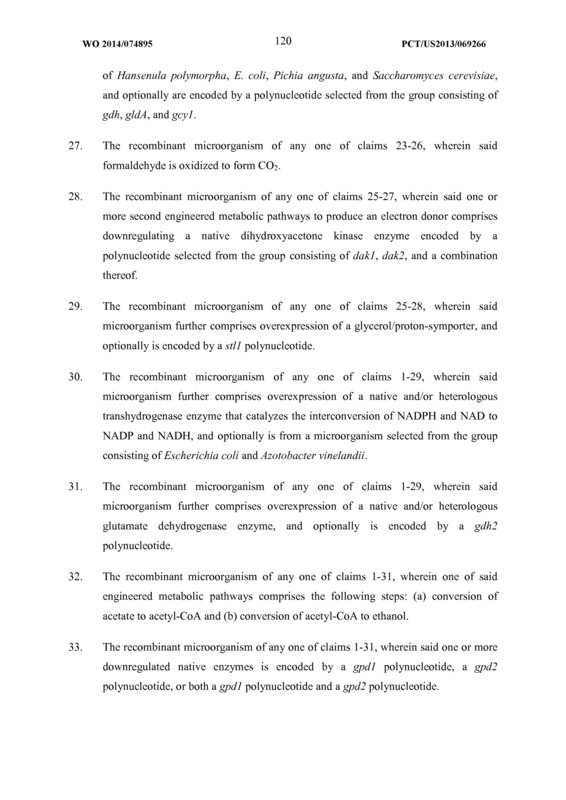 The recombinant microorganism of any one of claims 23-26, wherein said formaldehyde is oxidized to form C02. 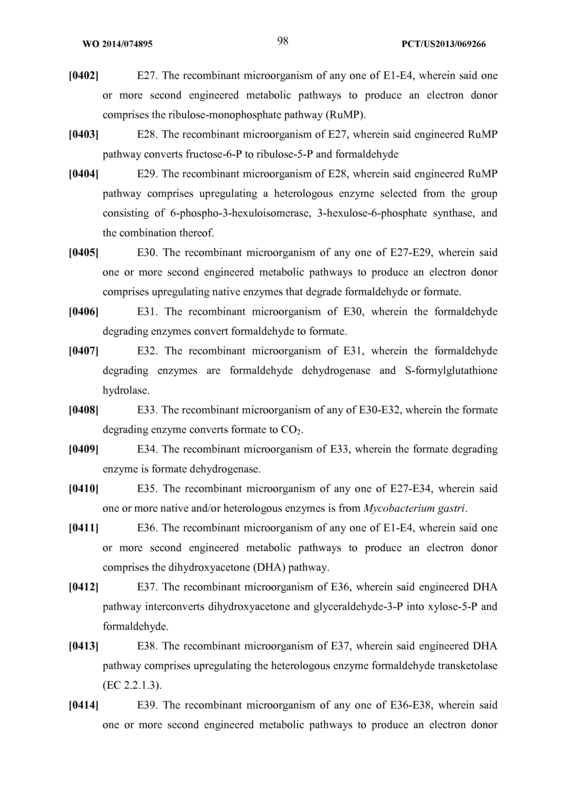 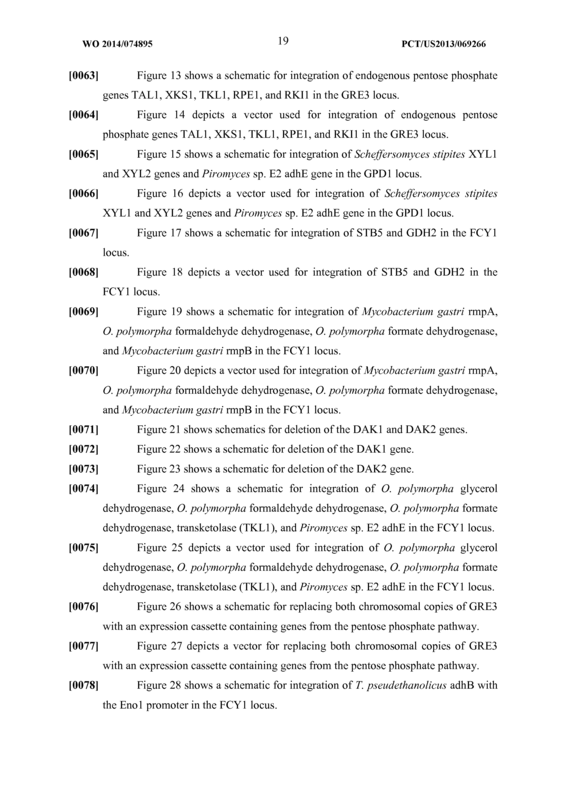 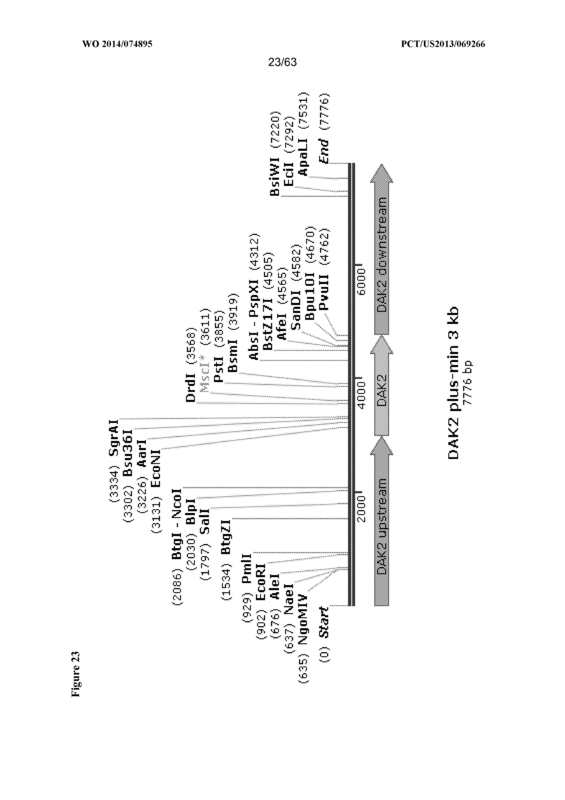 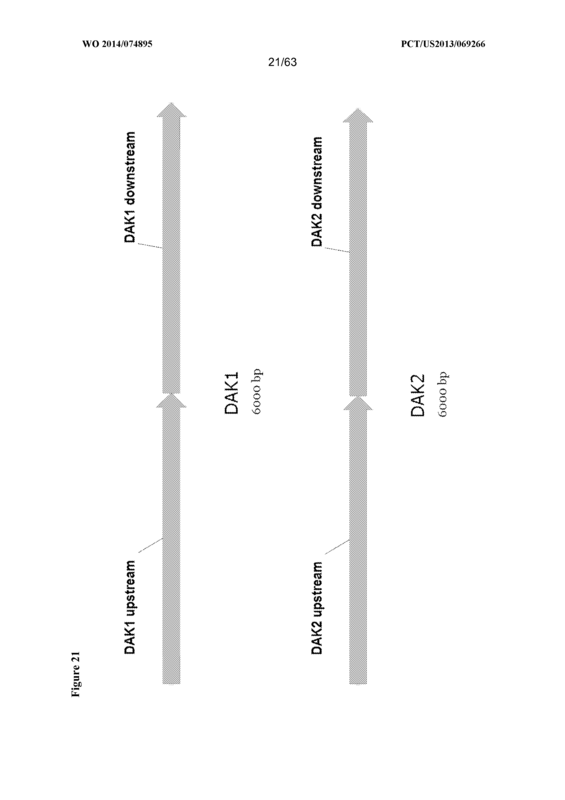 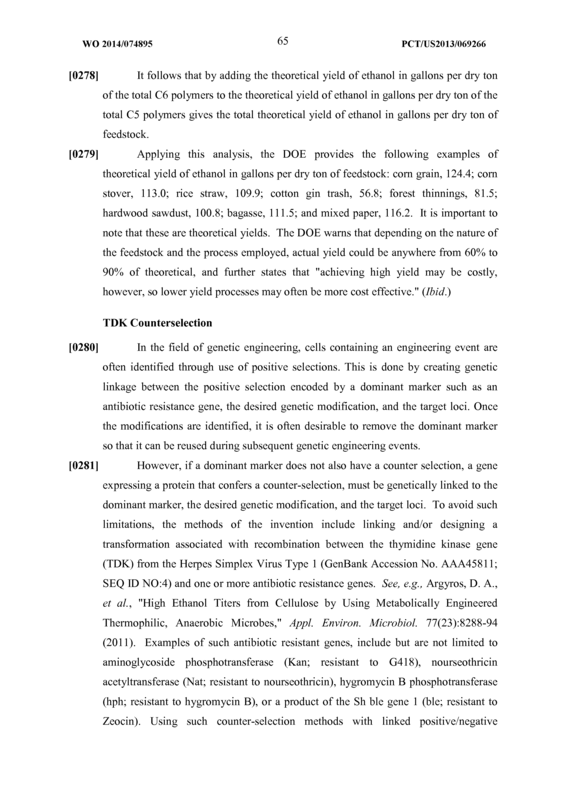 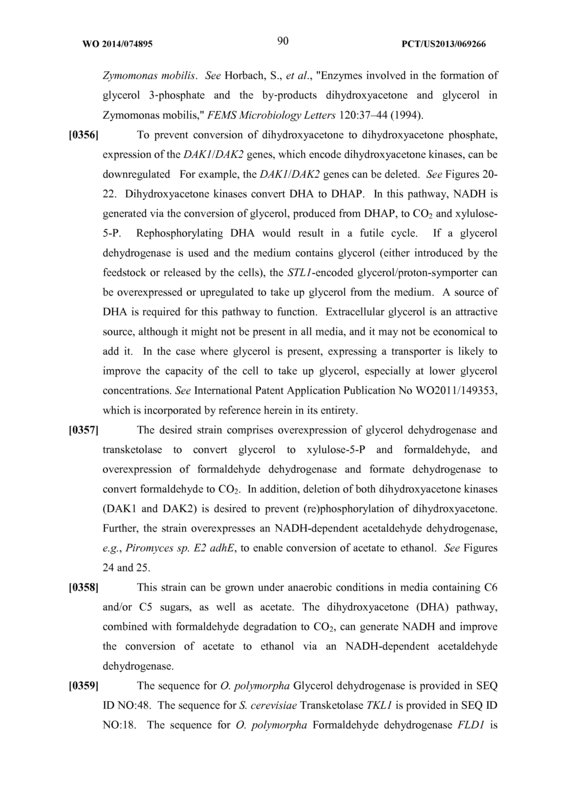 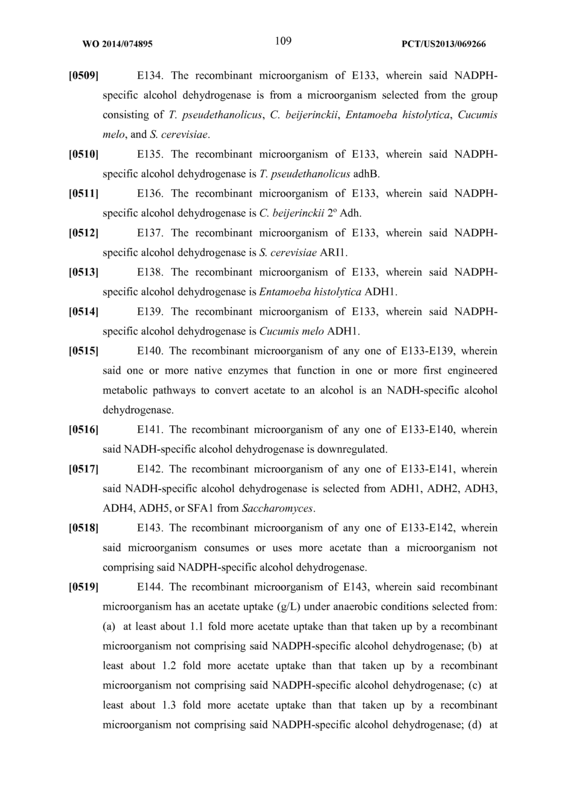 The recombinant microorganism of any one of claims 25-27, wherein said one or more second engineered metabolic pathways to produce an electron donor comprises downregulating a native dihydroxyacetone kinase enzyme encoded by a polynucleotide selected from the group consisting of dakl, dak2, and a combination thereof. 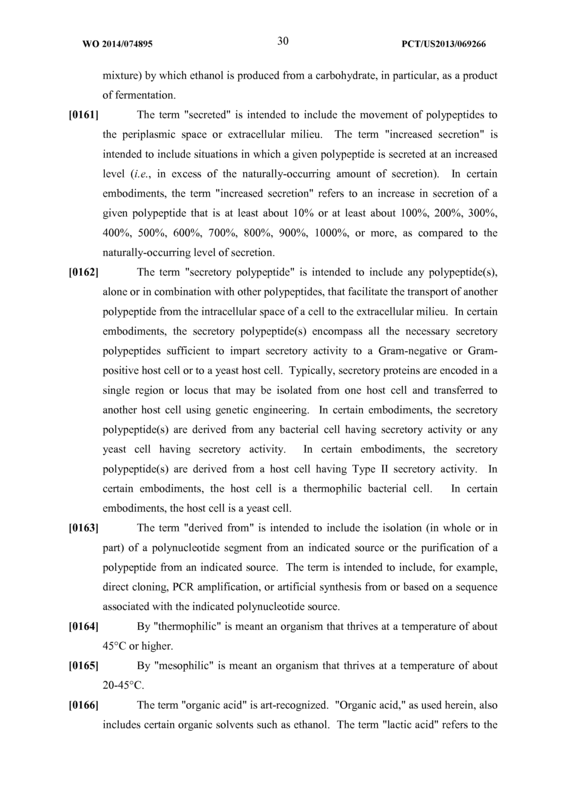 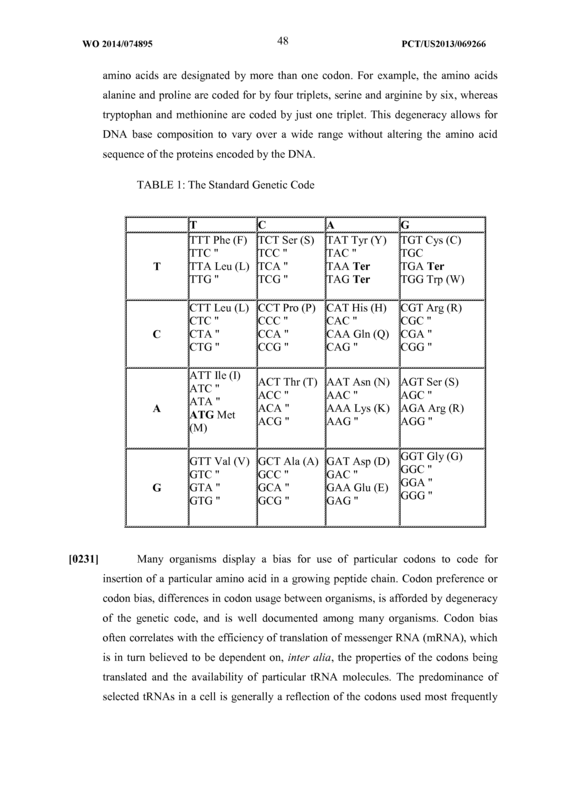 The recombinant microorganism of any one of claims 25-28, wherein said microorganism further comprises overexpression of a glycerol/proton-symporter, and optionally is encoded by a stll polynucleotide. 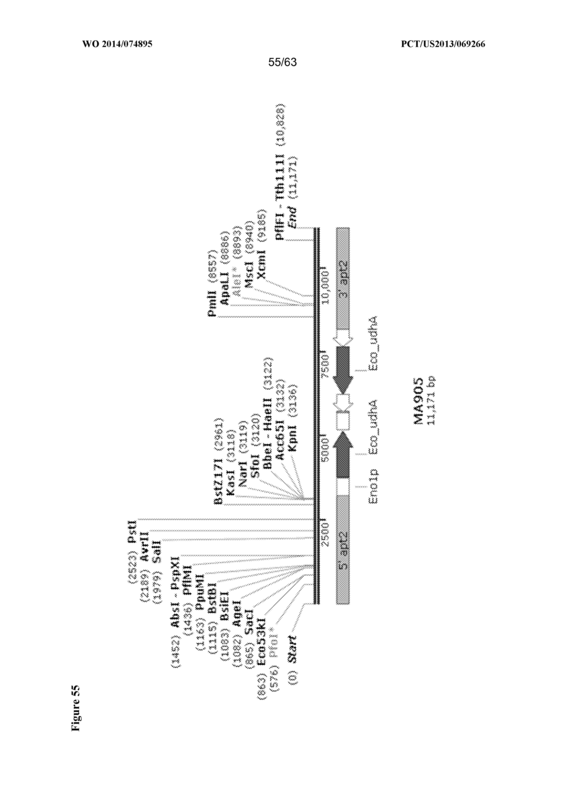 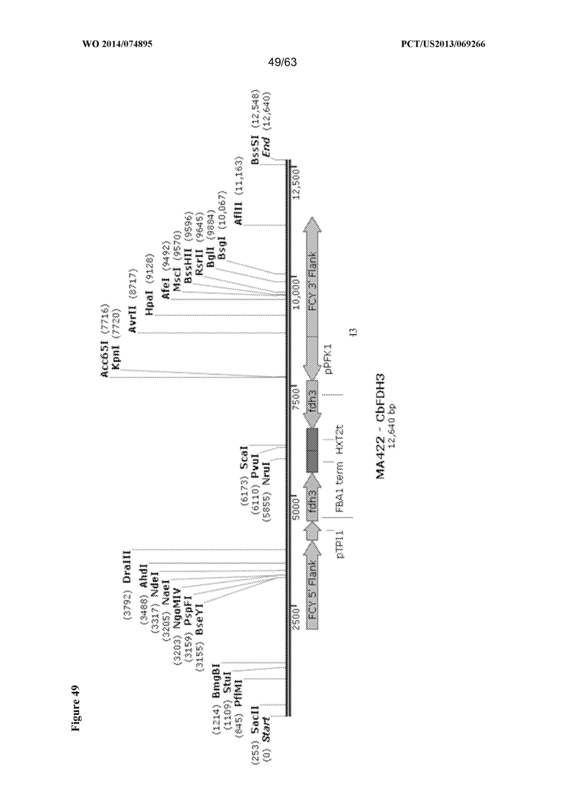 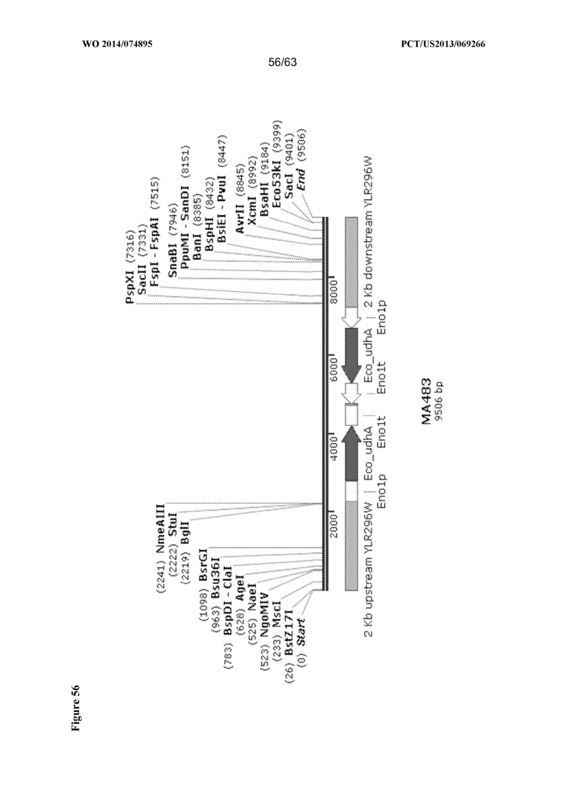 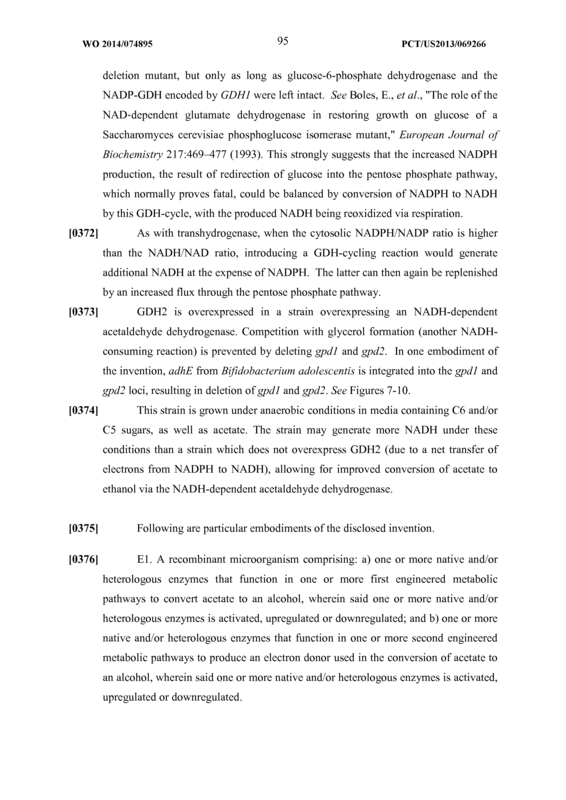 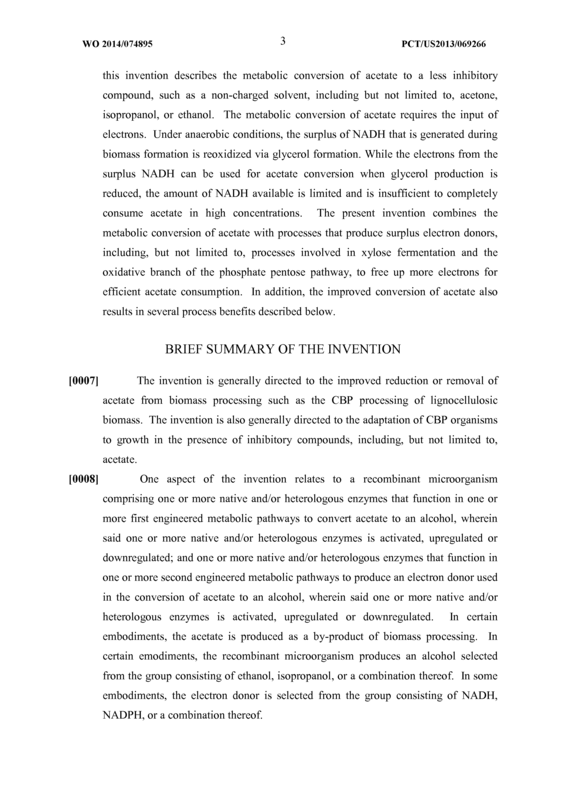 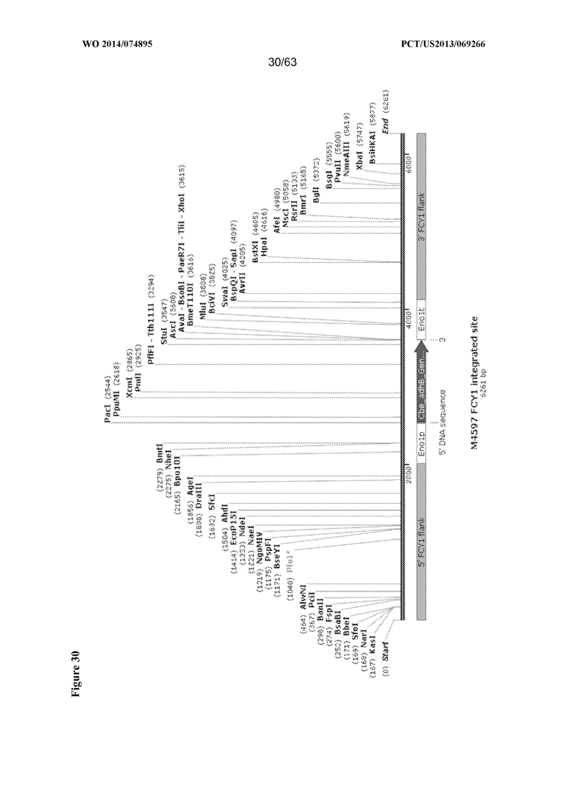 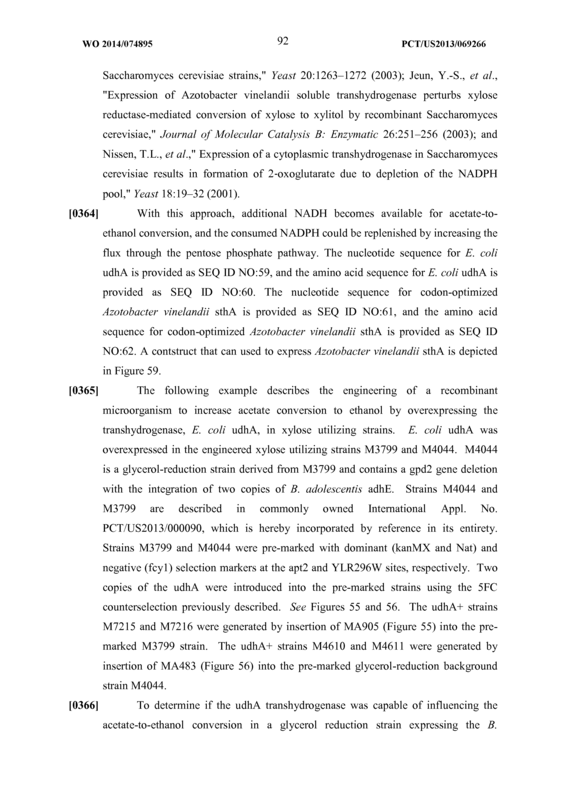 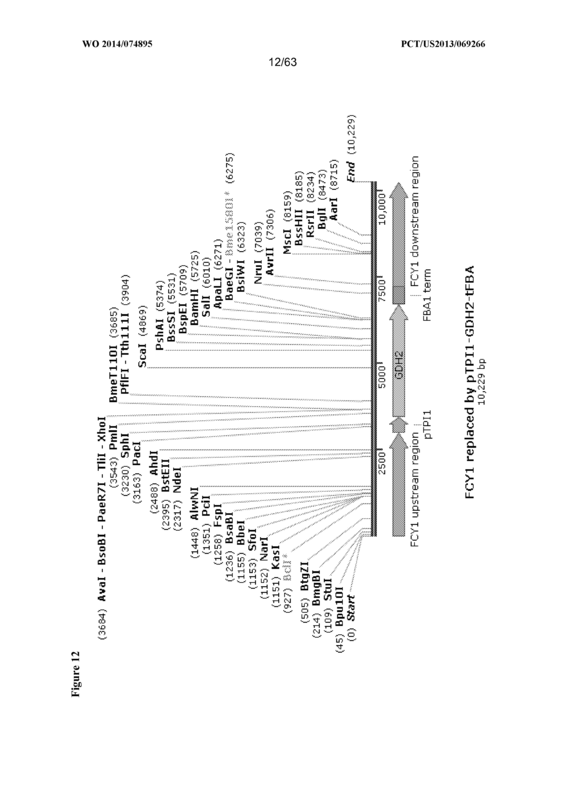 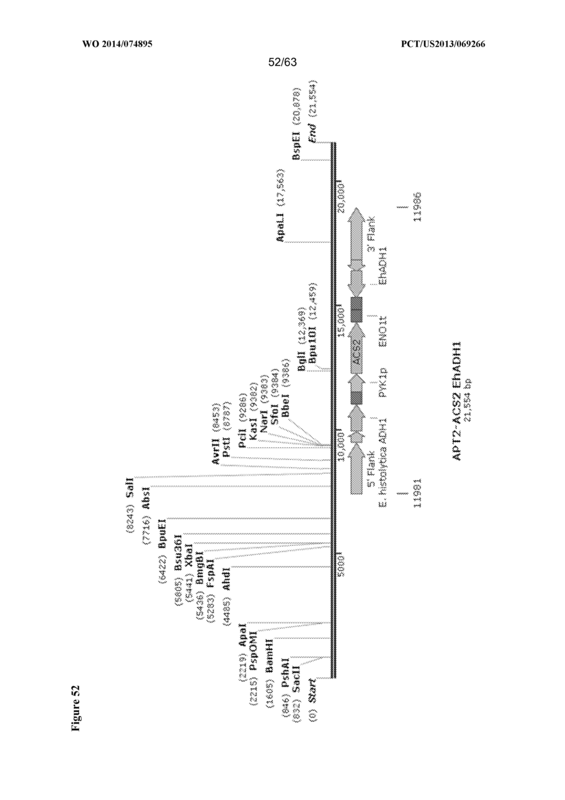 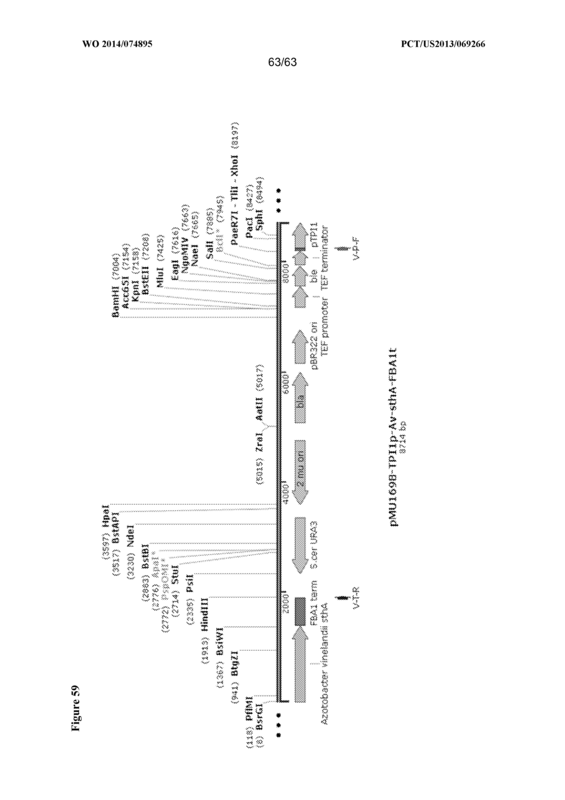 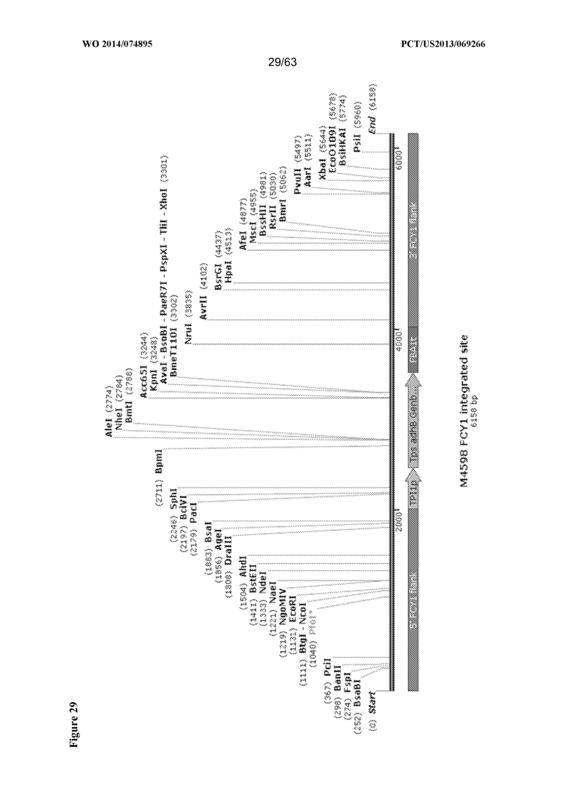 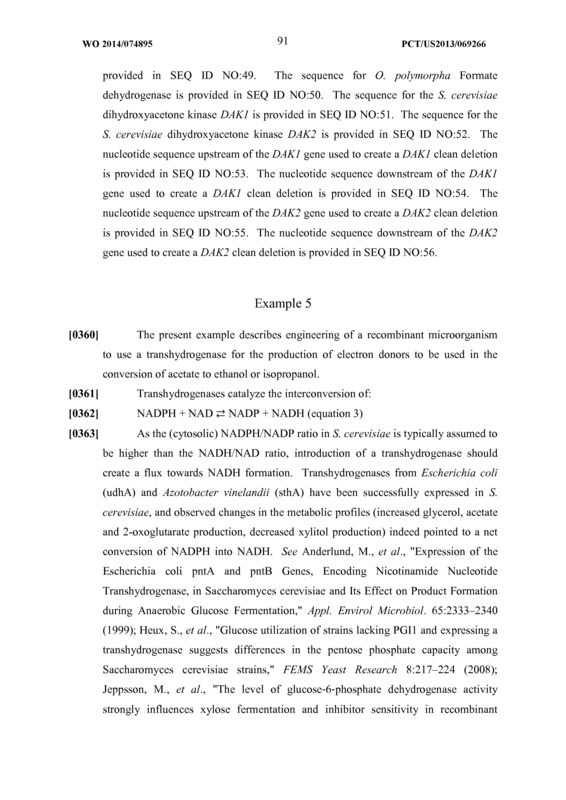 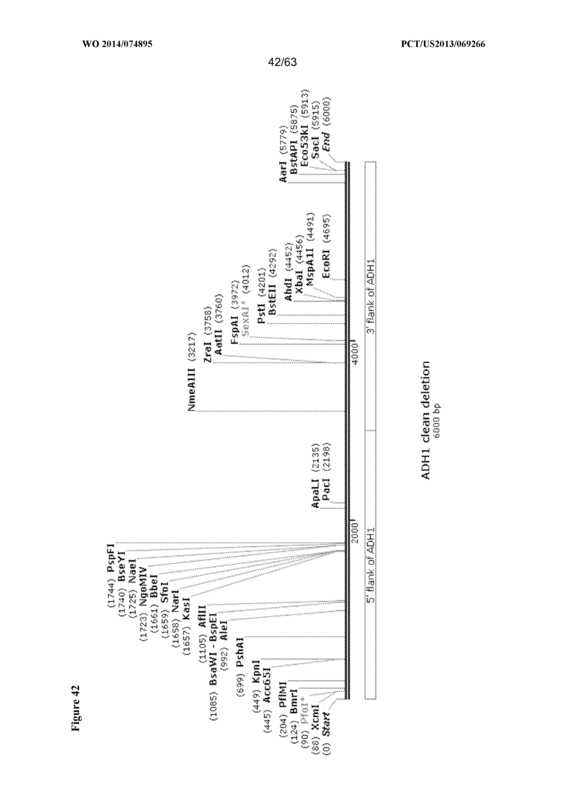 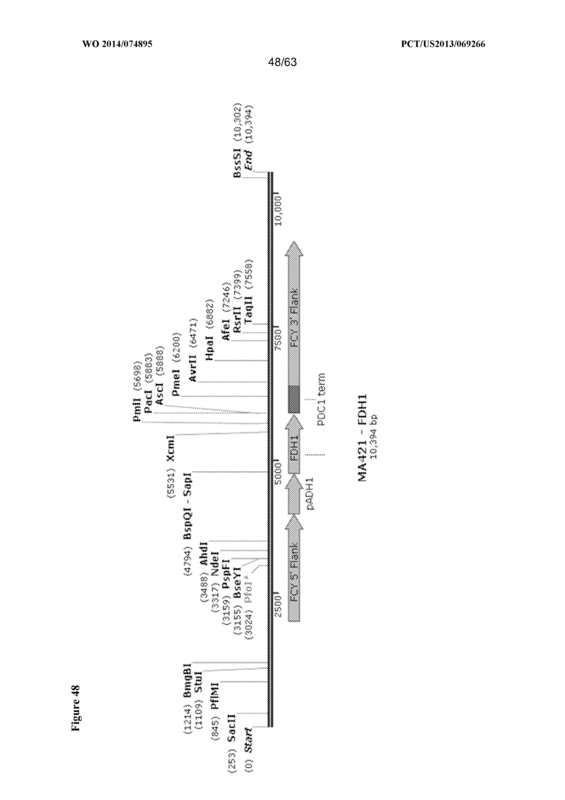 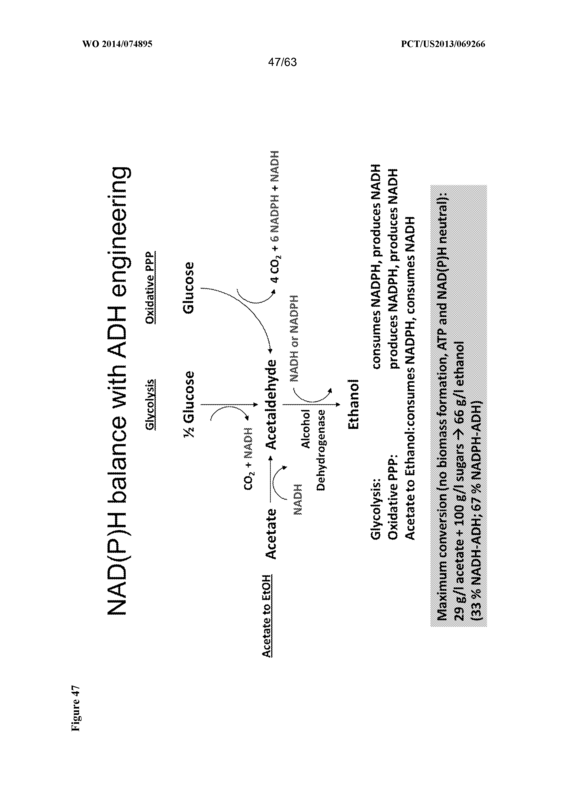 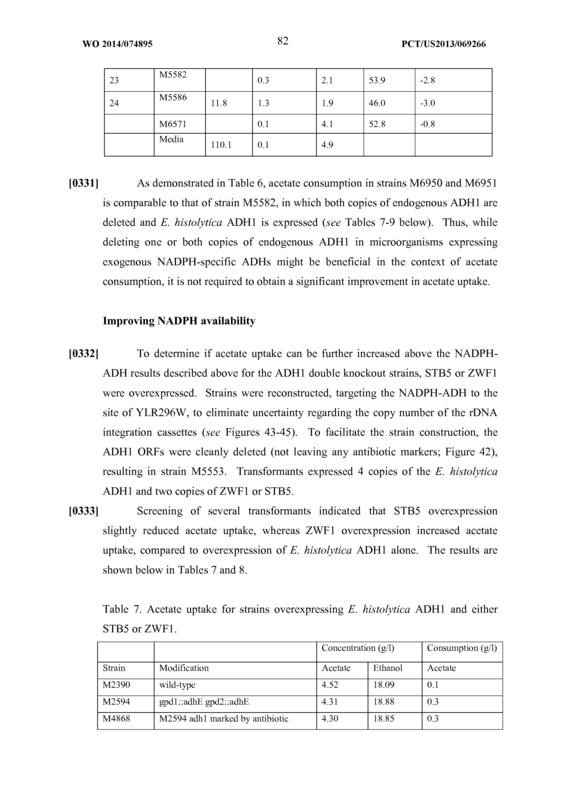 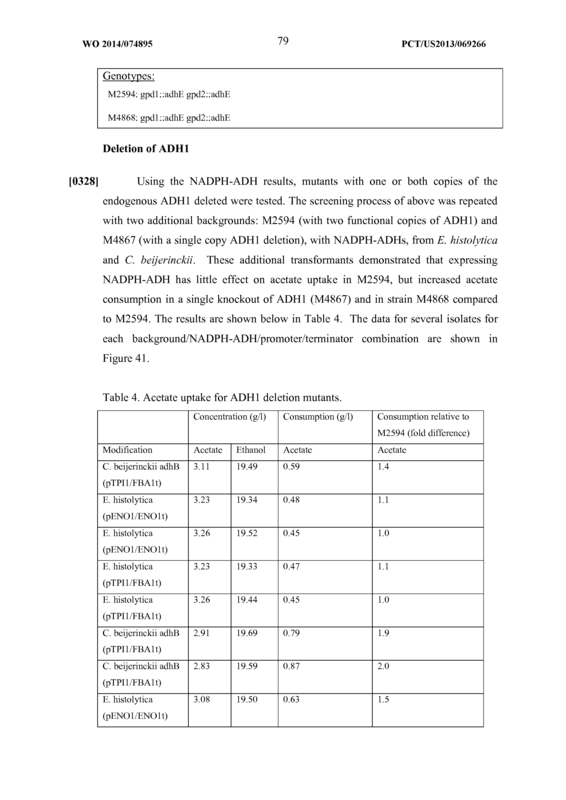 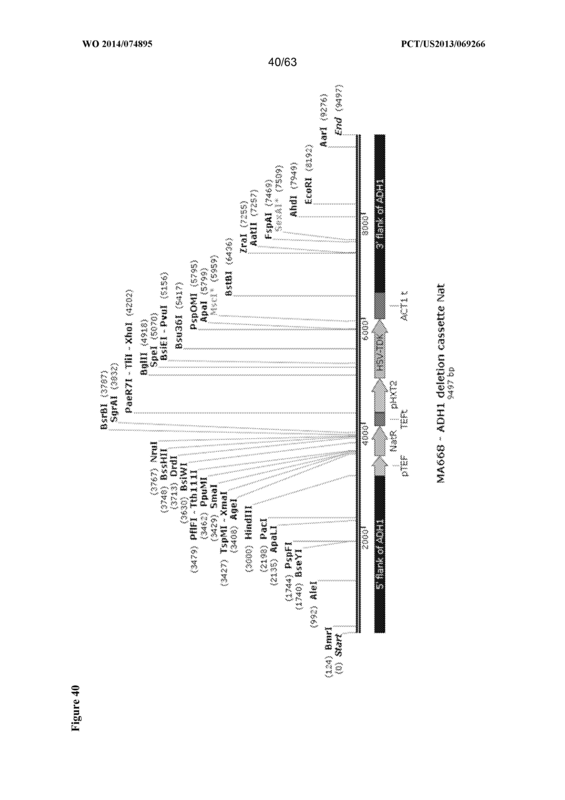 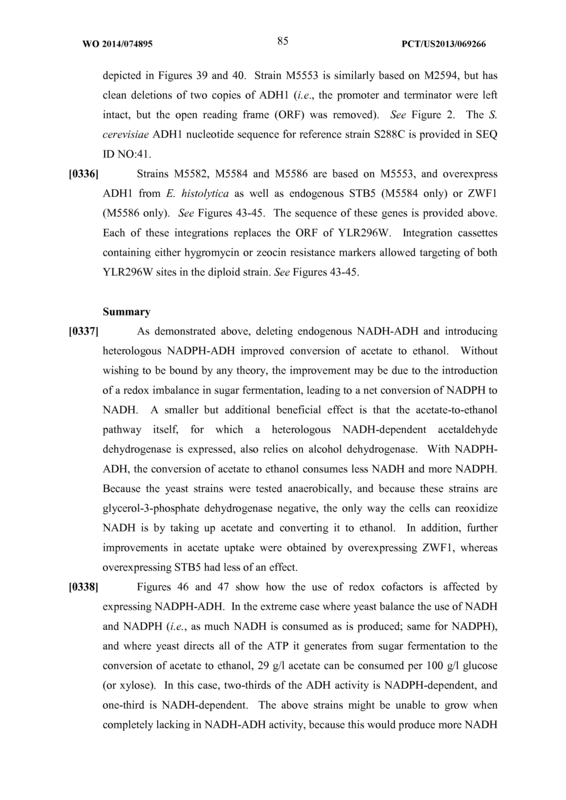 The recombinant microorganism of any one of claims 1-29, wherein said microorganism further comprises overexpression of a native and/or heterologous transhydrogenase enzyme that catalyzes the interconversion of NADPH and NAD to NADP and NADH, and optionally is from a microorganism selected from the group consisting of Escherichia coli and Azotobacter vinelandii. 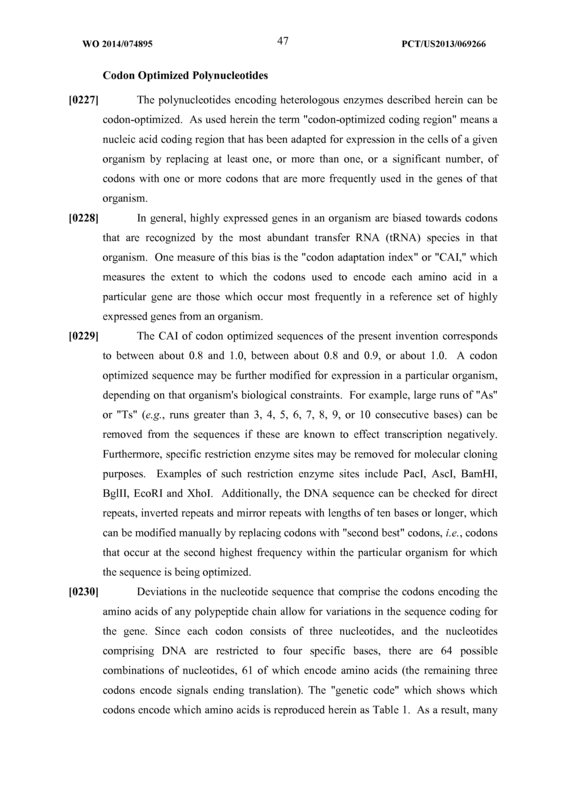 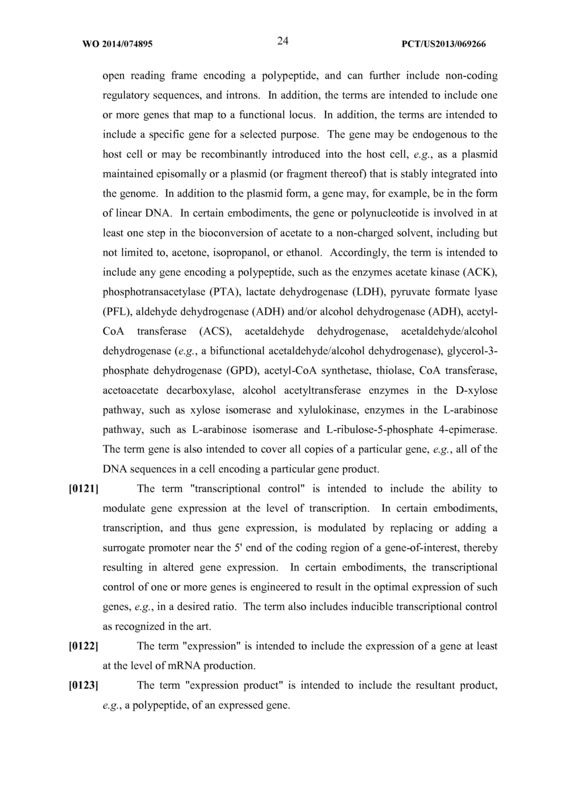 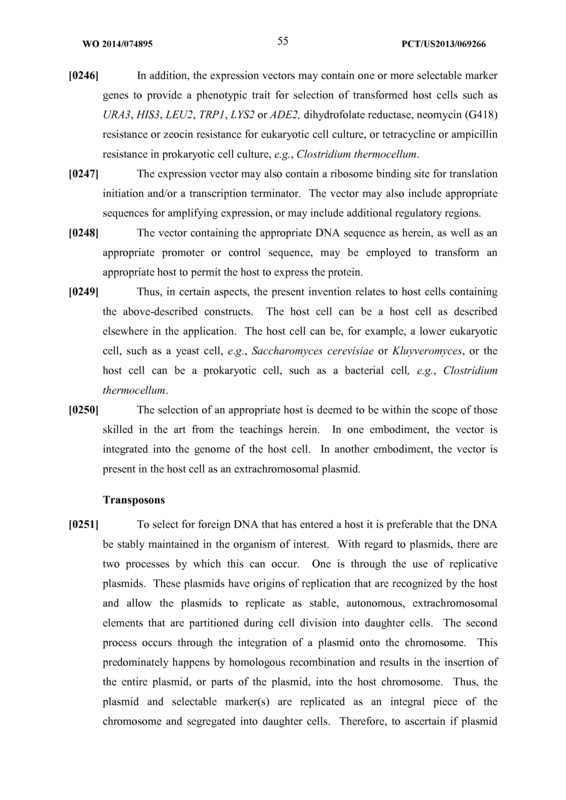 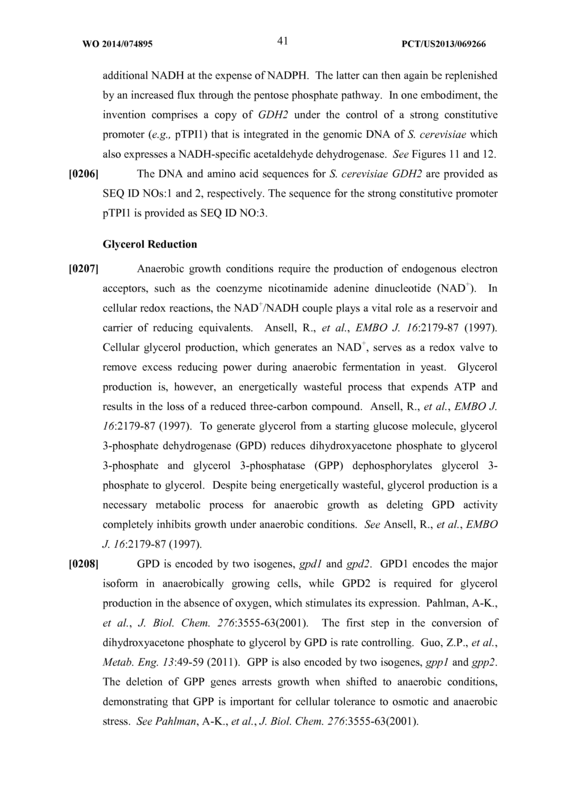 The recombinant microorganism of any one of claims 1-29, wherein said microorganism further comprises overexpression of a native and/or heterologous glutamate dehydrogenase enzyme, and optionally is encoded by a gdh2 polynucleotide. 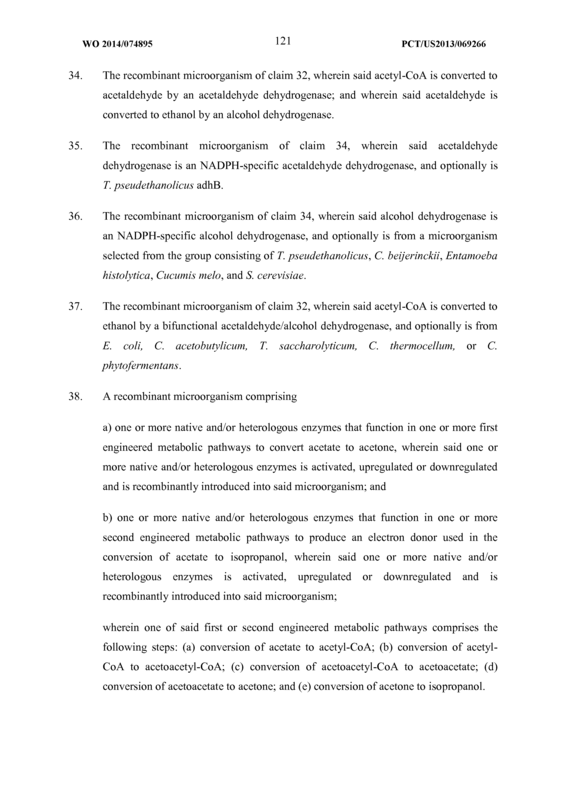 The recombinant microorganism of any one of claims 1-31, wherein one of said engineered metabolic pathways comprises the following steps: (a) conversion of acetate to acetyl-CoA and (b) conversion of acetyl-CoA to ethanol. 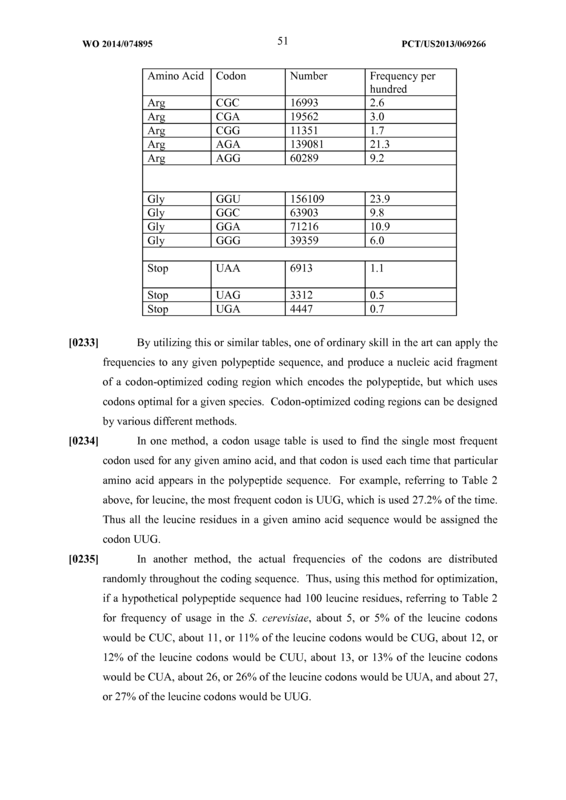 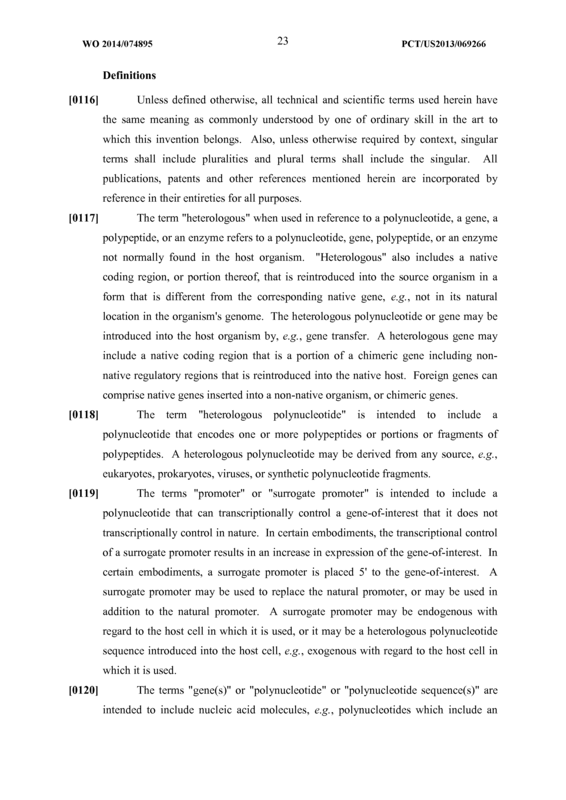 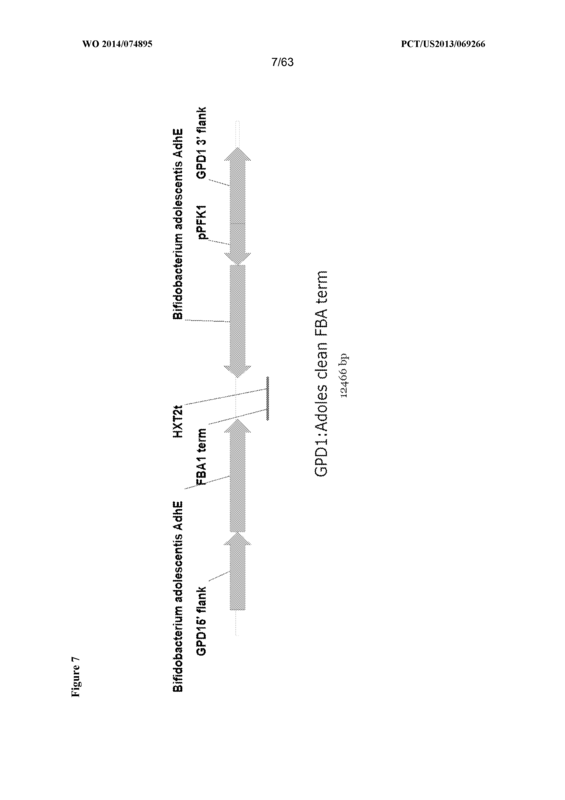 The recombinant microorganism of any one of claims 1-31, wherein said one or more downregulated native enzymes is encoded by a gpdl polynucleotide, a gpd2 polynucleotide, or both a gpdl polynucleotide and a gpd2 polynucleotide. 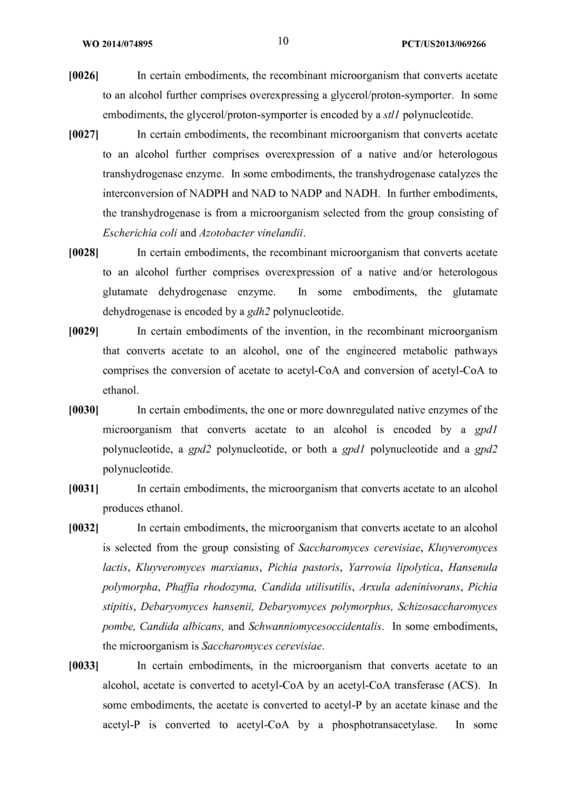 The recombinant microorganism of claim 32, wherein said acetyl-CoA is converted to acetaldehyde by an acetaldehyde dehydrogenase; and wherein said acetaldehyde is converted to ethanol by an alcohol dehydrogenase. 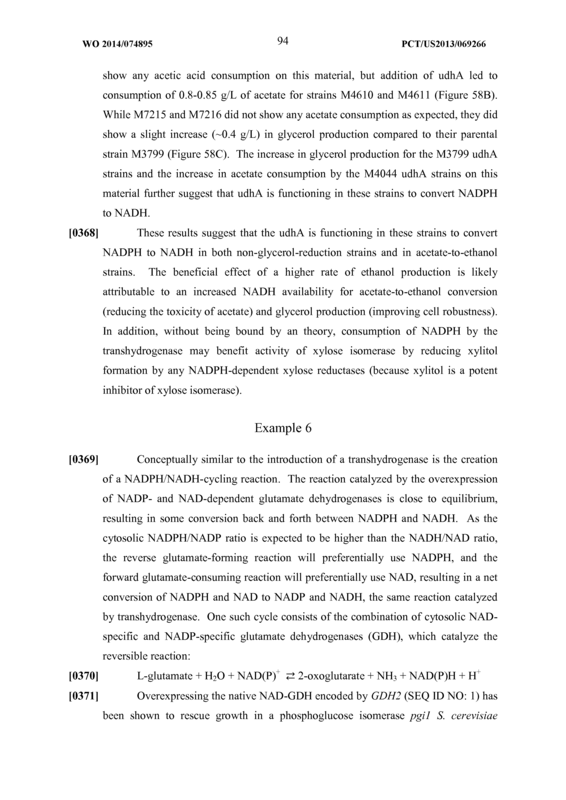 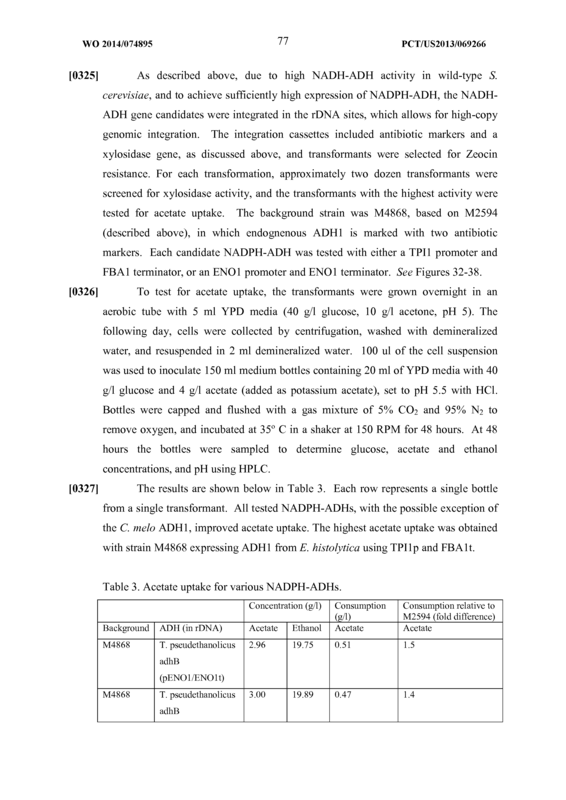 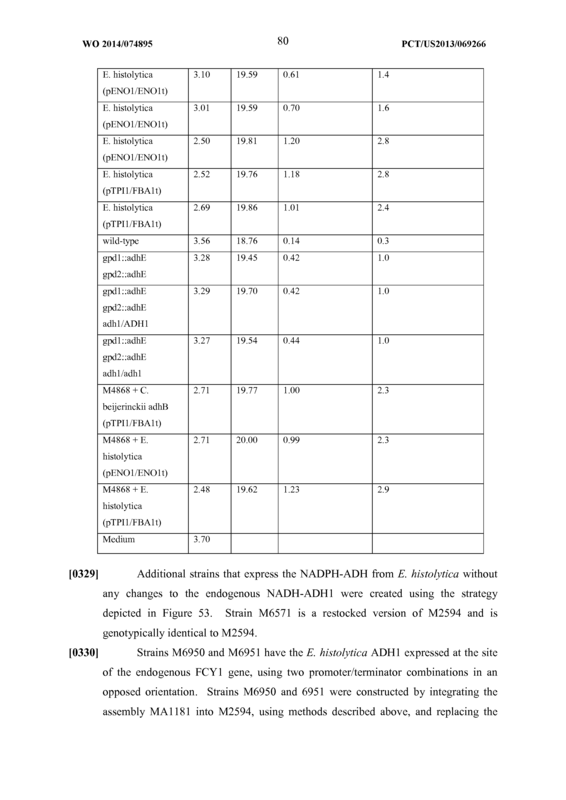 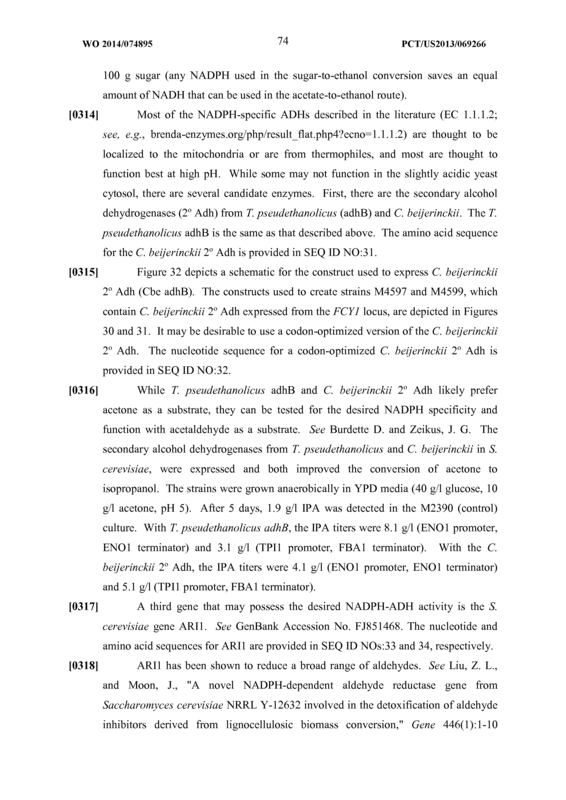 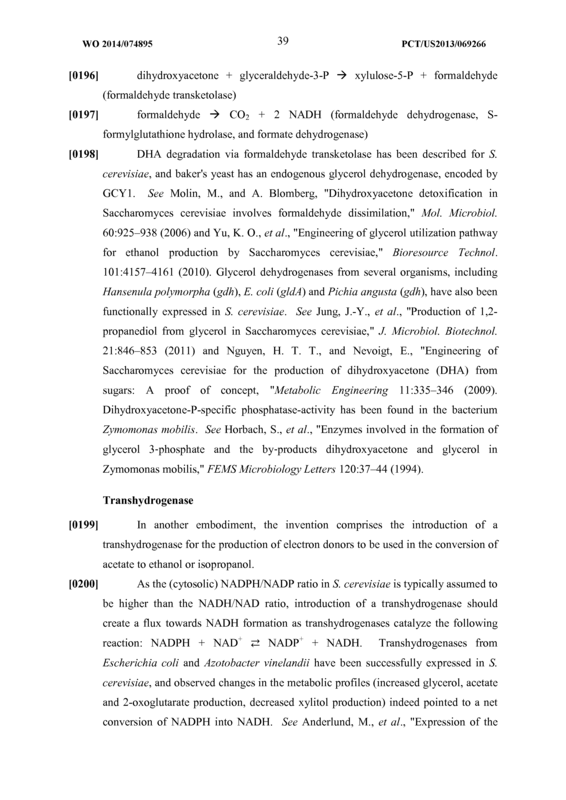 The recombinant microorganism of claim 34, wherein said acetaldehyde dehydrogenase is an NADPH-specific acetaldehyde dehydrogenase, and optionally is T. pseudethanolicus adhB. 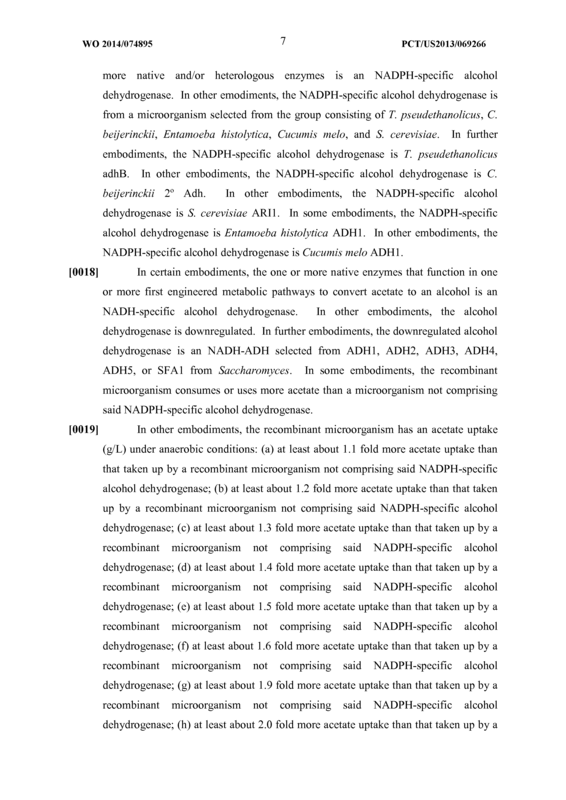 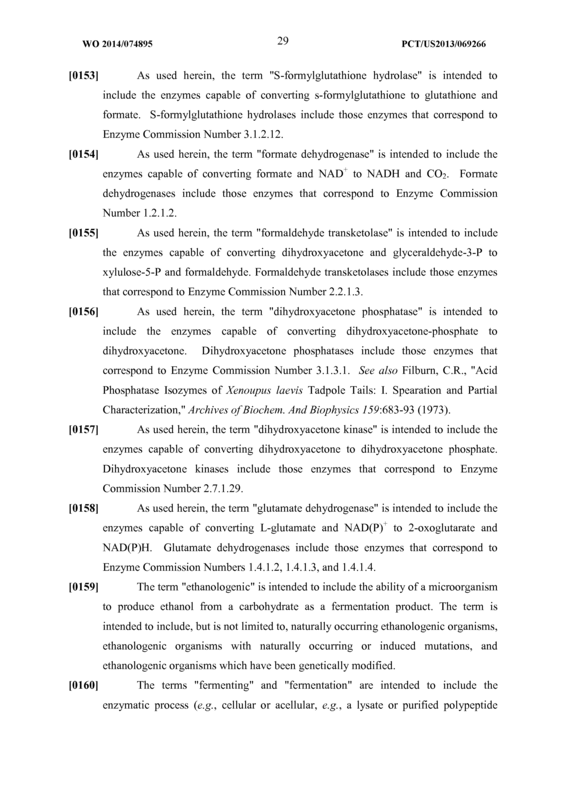 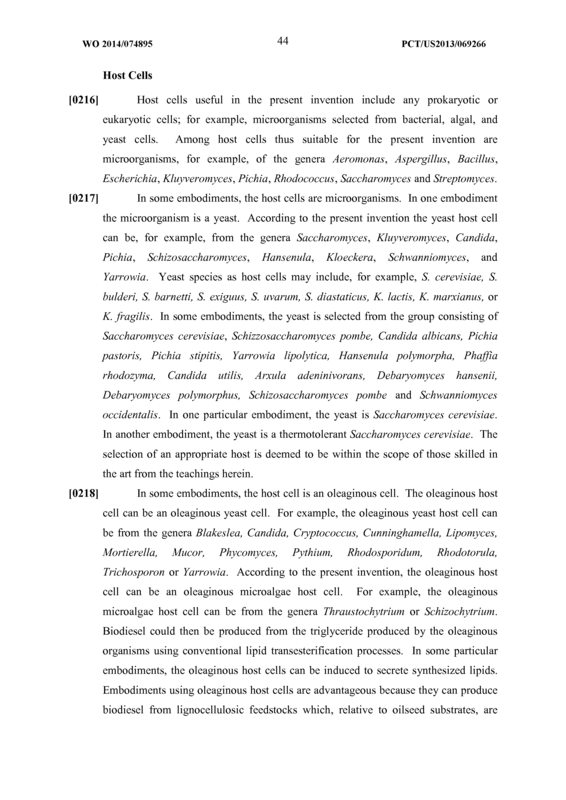 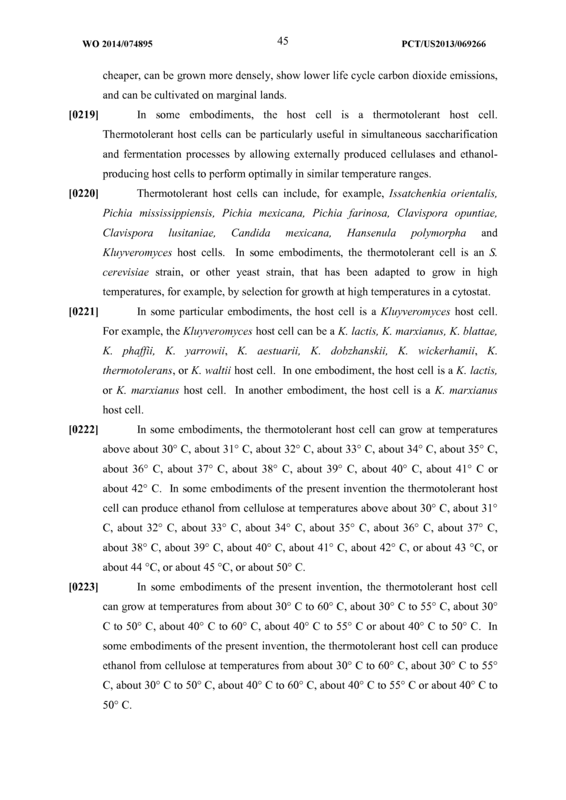 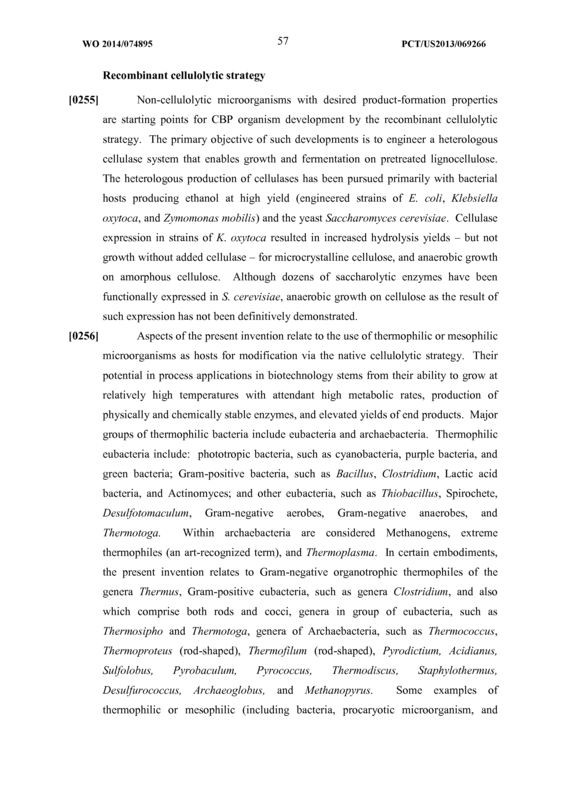 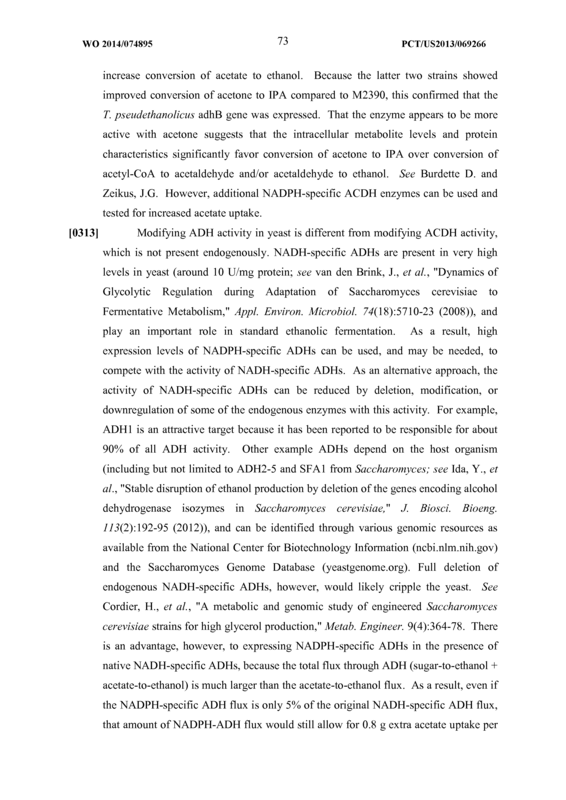 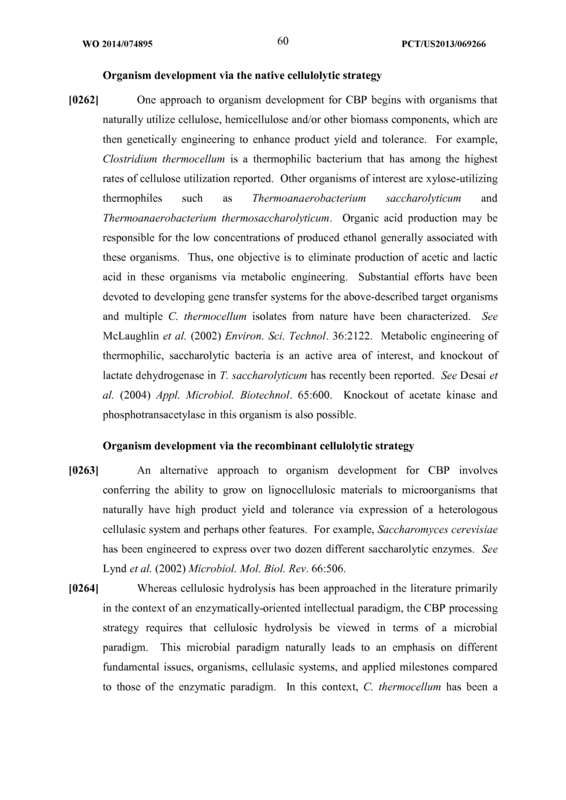 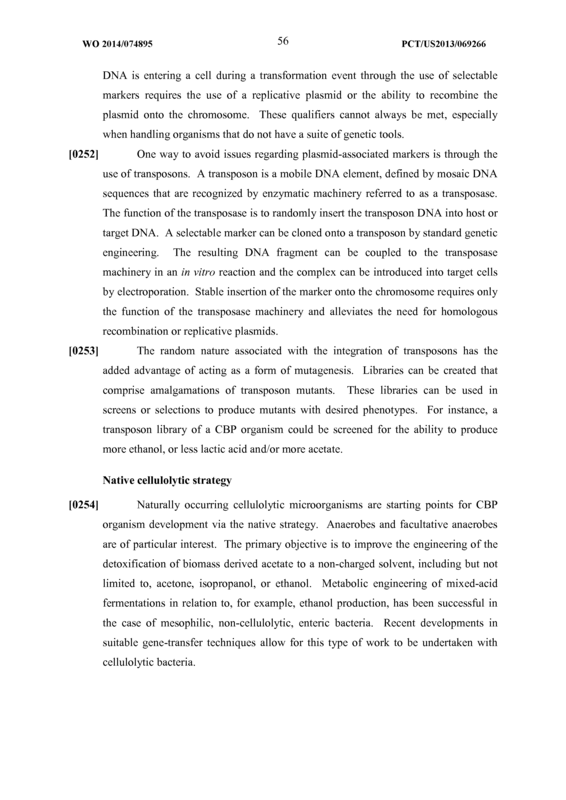 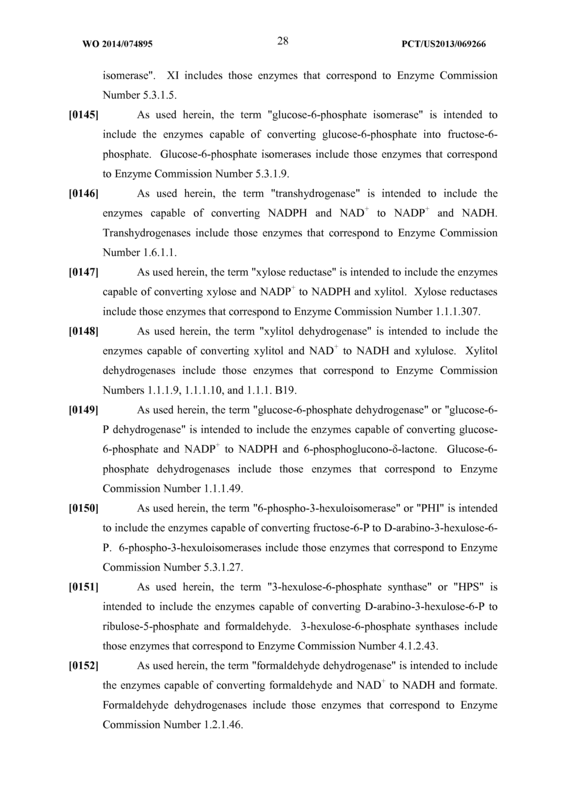 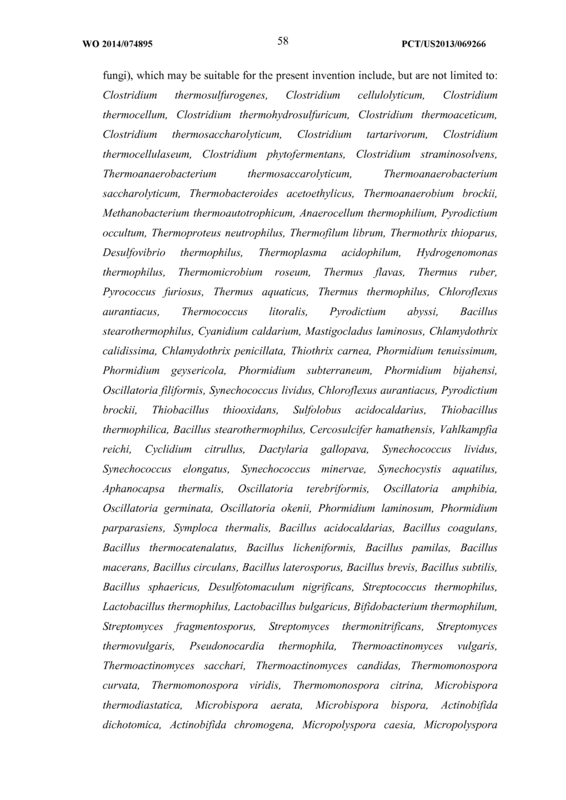 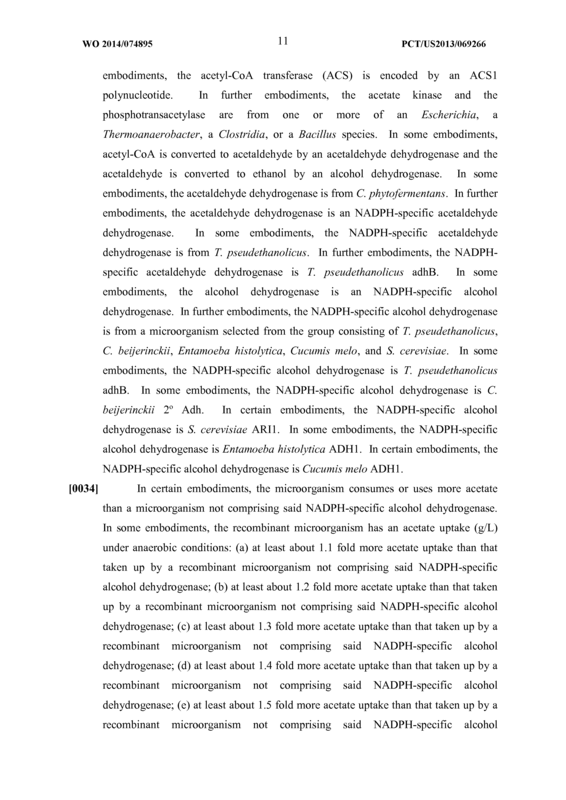 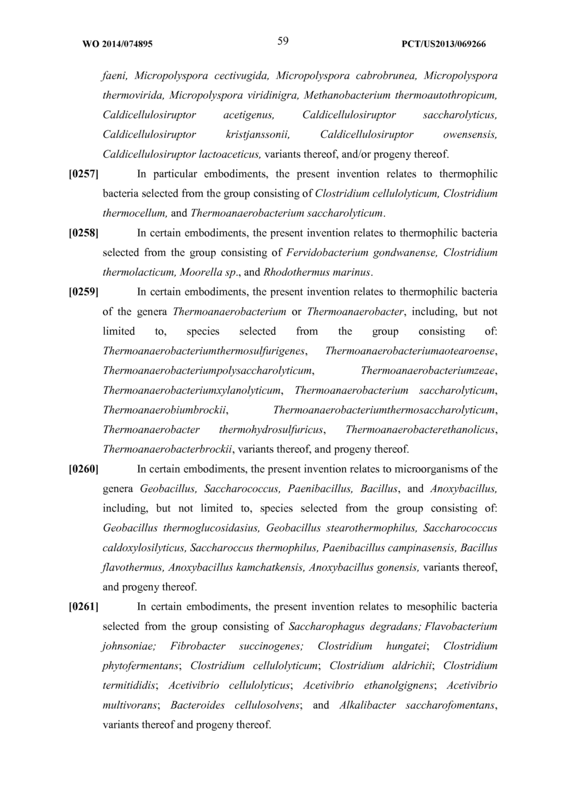 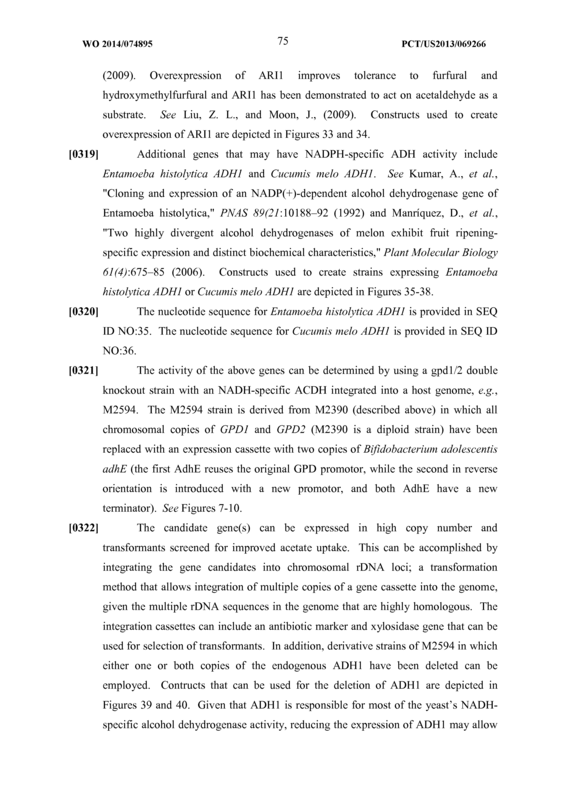 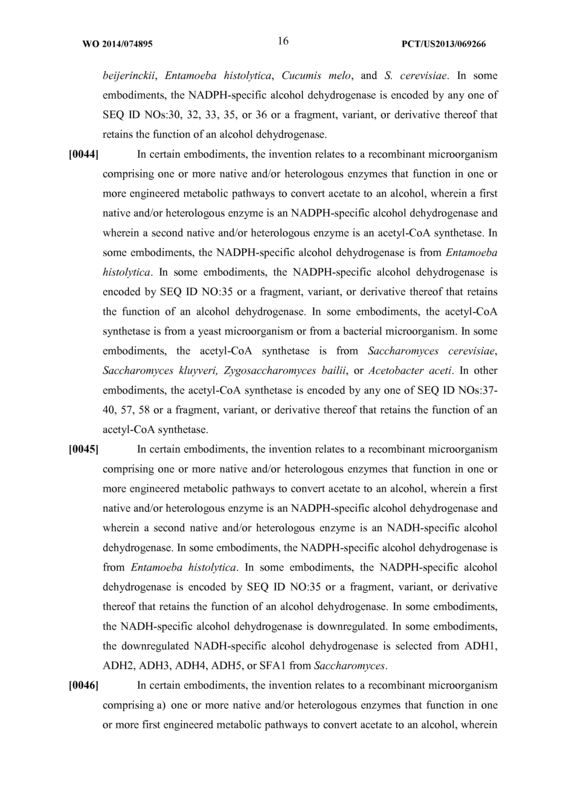 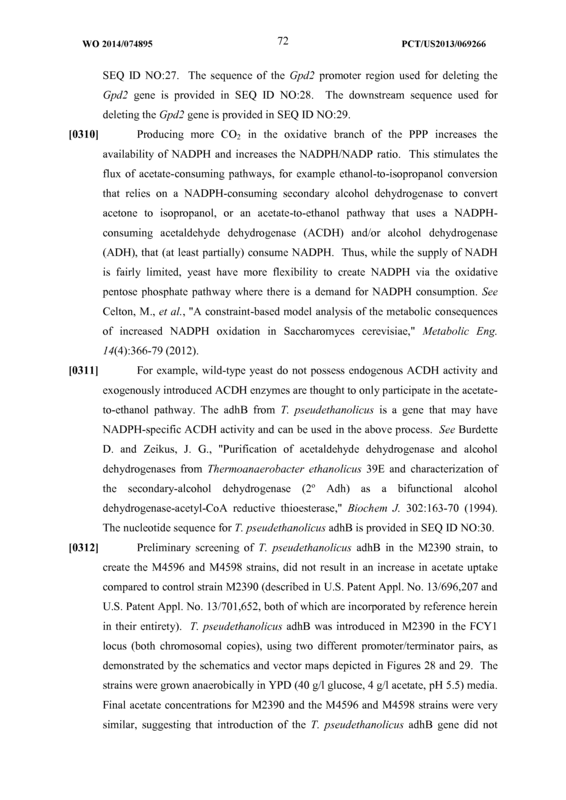 The recombinant microorganism of claim 34, wherein said alcohol dehydrogenase is an NADPH-specific alcohol dehydrogenase, and optionally is from a microorganism selected from the group consisting of T. pseudethanolicus, C. beijerinckii, Entamoeba histolytica, Cucumis melo, and S. cerevisiae. 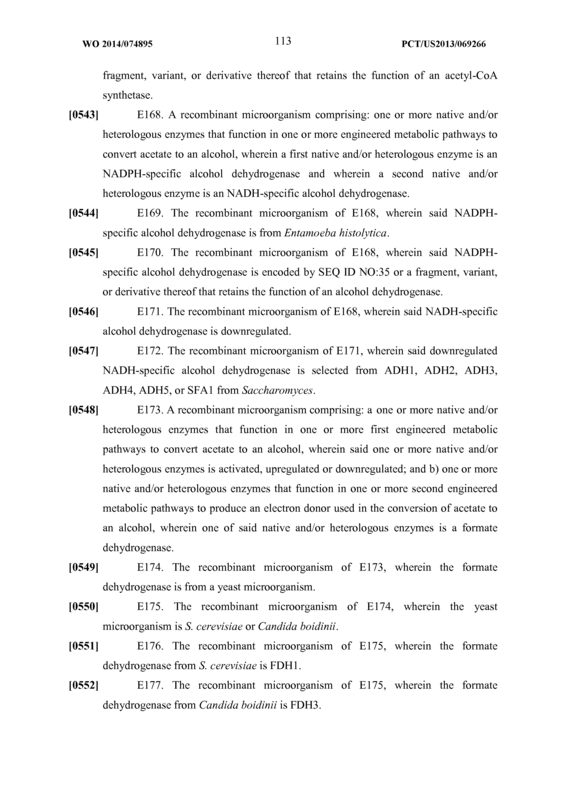 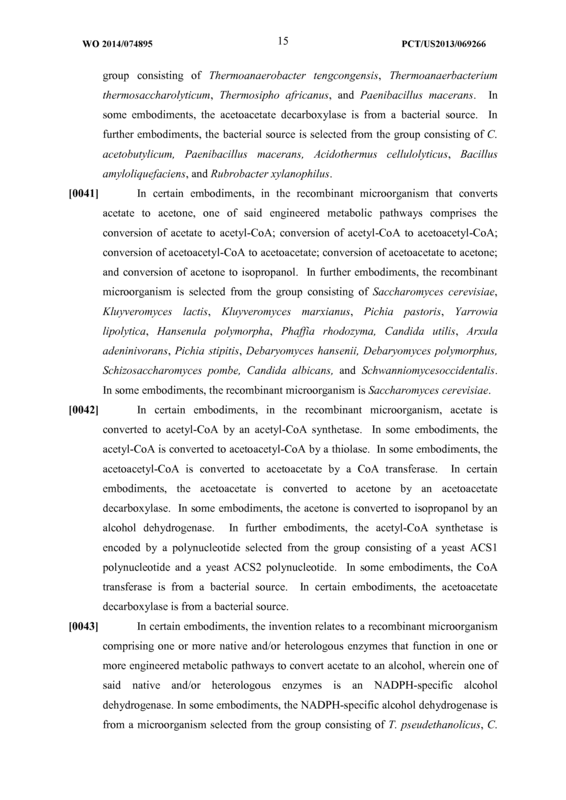 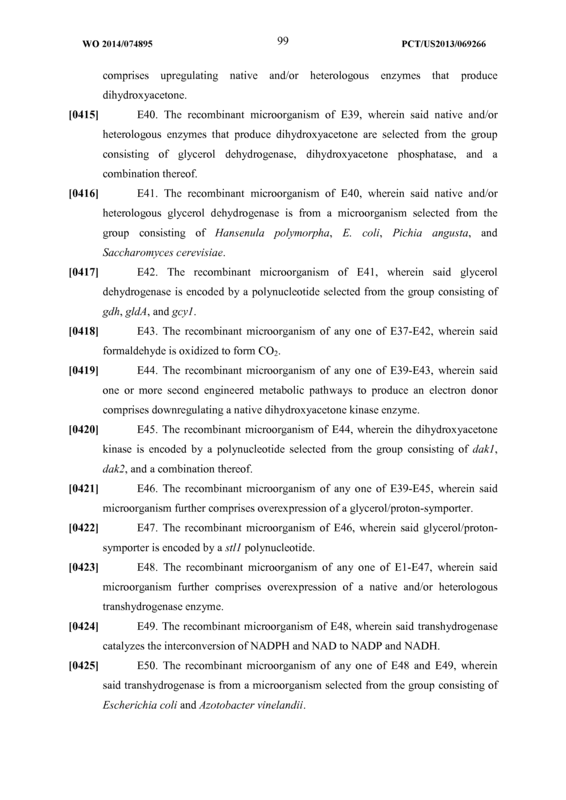 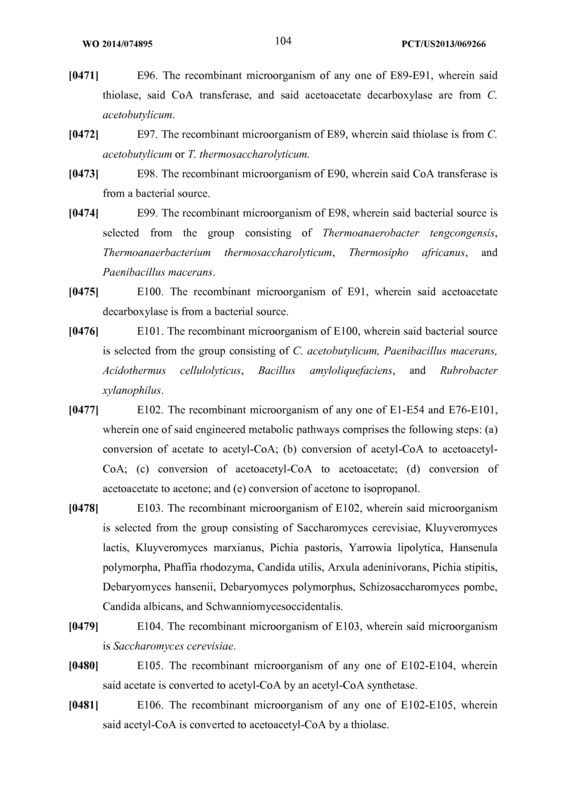 The recombinant microorganism of claim 32, wherein said acetyl-CoA is converted to ethanol by a bifunctional acetaldehyde/alcohol dehydrogenase, and optionally is from E. coli, C. acetobutylicum, T. saccharolyticum, C. thermocellum, or C. phytofermentans . 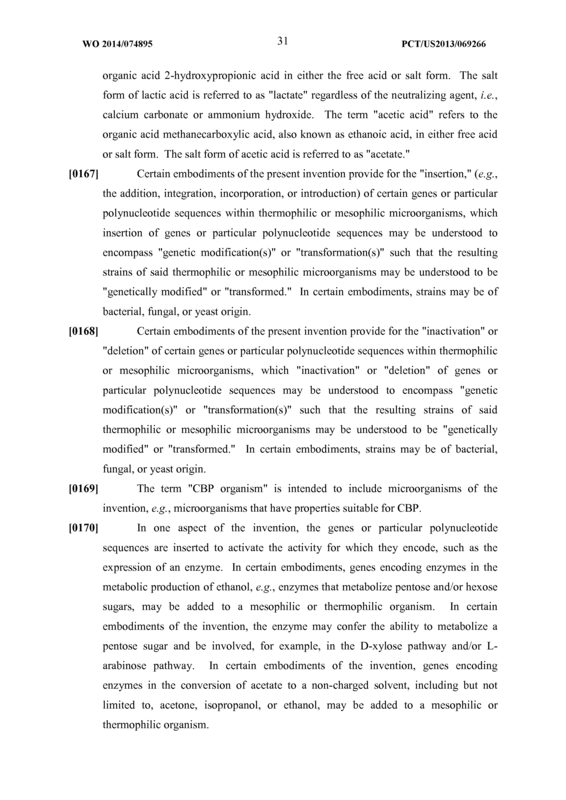 A recombinant microorganism comprising a) one or more native and/or heterologous enzymes that function in one or more first engineered metabolic pathways to convert acetate to acetone, wherein said one or more native and/or heterologous enzymes is activated, upregulated or downregulated and is recombinantly introduced into said microorganism; and b) one or more native and/or heterologous enzymes that function in one or more second engineered metabolic pathways to produce an electron donor used in the conversion of acetate to isopropanol, wherein said one or more native and/or heterologous enzymes is activated, upregulated or downregulated and is recombinantly introduced into said microorganism; wherein one of said first or second engineered metabolic pathways comprises the following steps: (a) conversion of acetate to acetyl-CoA; (b) conversion of acetyl - CoA to acetoacetyl-CoA; (c) conversion of acetoacetyl-CoA to acetoacetate; (d) conversion of acetoacetate to acetone; and (e) conversion of acetone to isopropanol. 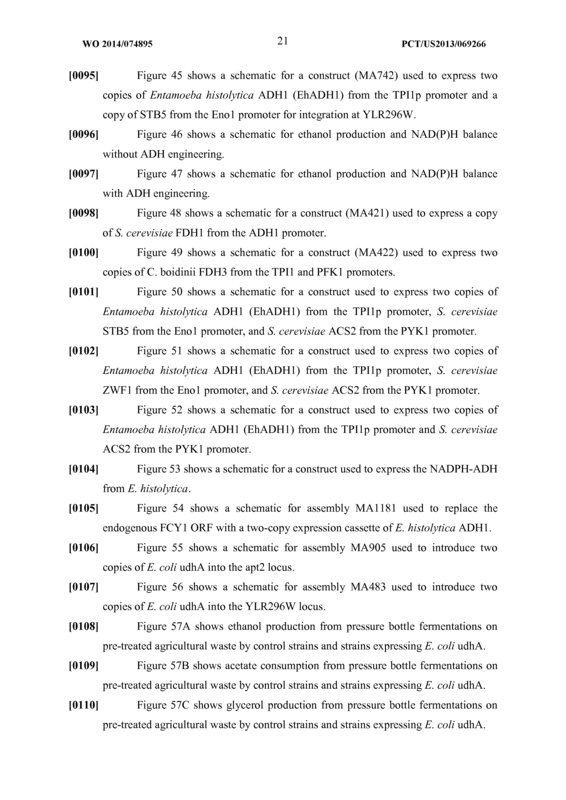 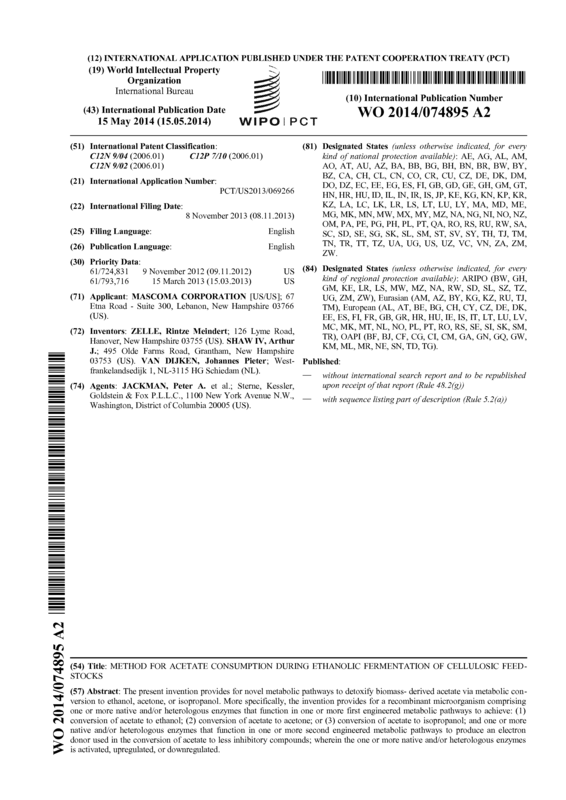 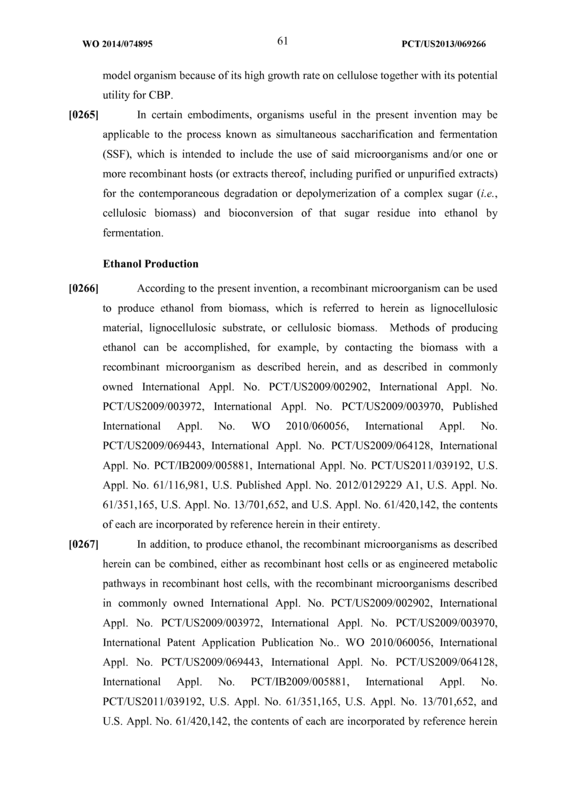 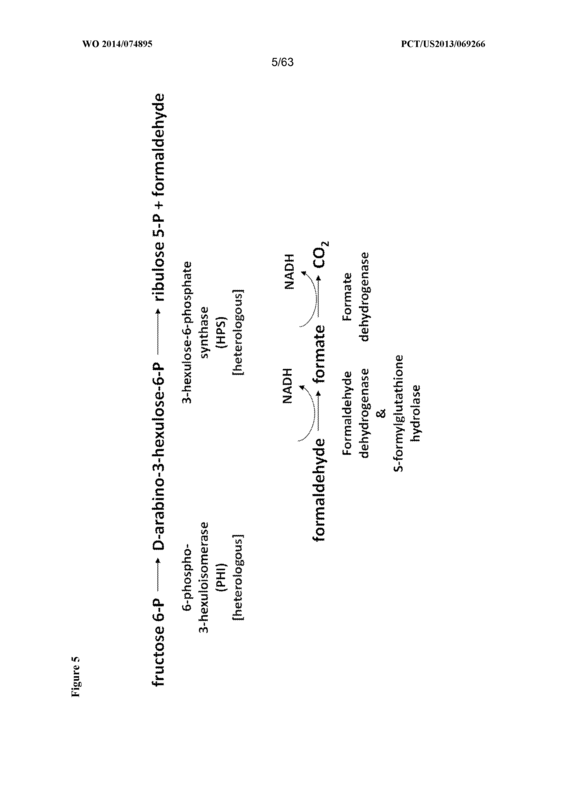 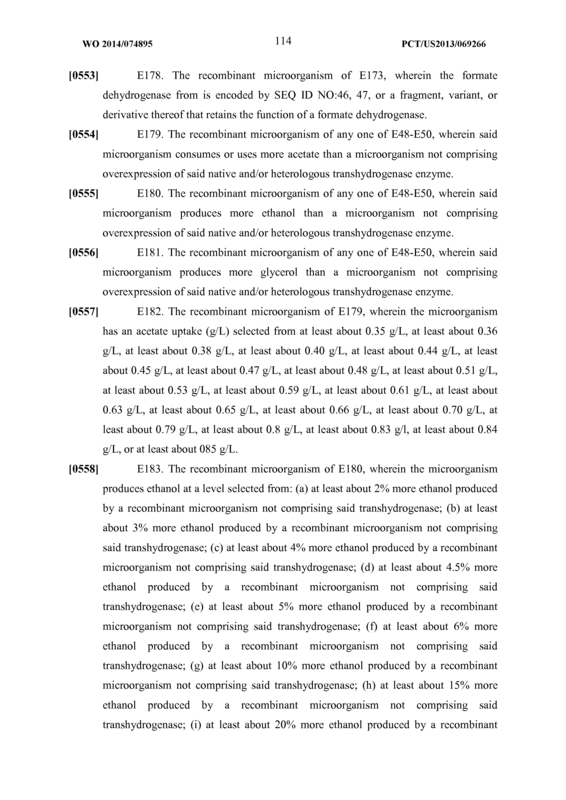 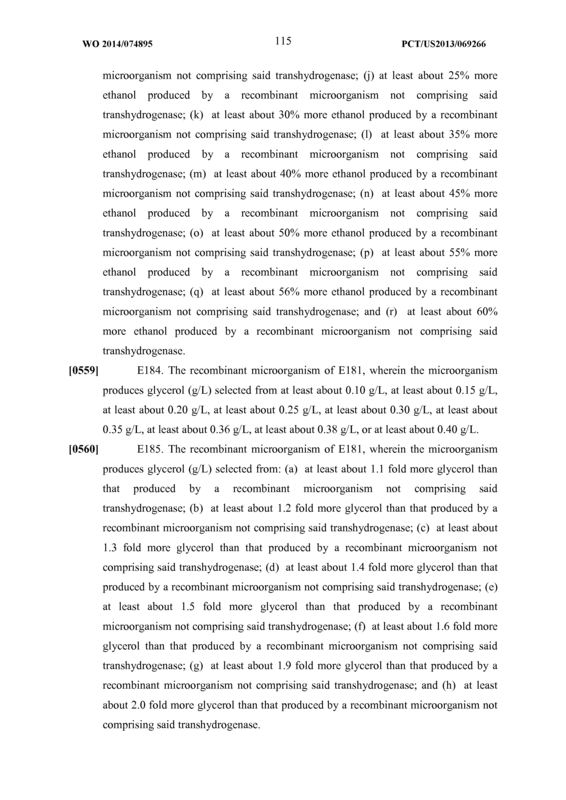 A process for converting biomass to ethanol, acetone, or isopropanol comprising contacting biomass with a recombinant microorganism according to any one of claims 1-38. 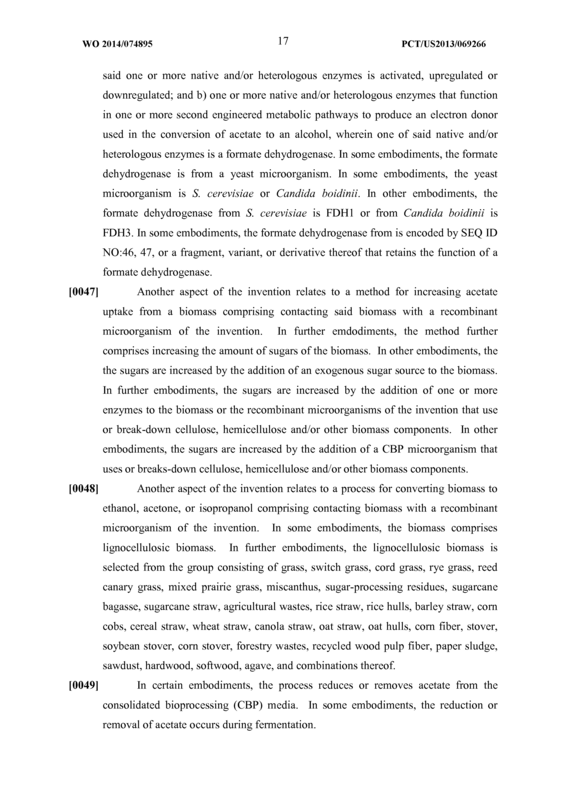 The process of claim 39, wherein said biomass comprises lignocellulosic biomass, and optionally is selected from the group consisting of grass, switch grass, cord grass, rye grass, reed canary grass, mixed prairie grass, miscanthus, sugar-processing residues, sugarcane bagasse, sugarcane straw, agricultural wastes, rice straw, rice hulls, barley straw, corn cobs, cereal straw, wheat straw, canola straw, oat straw, oat hulls, corn fiber, stover, soybean stover, corn stover, forestry wastes, recycled wood pulp fiber, paper sludge, sawdust, hardwood, softwood, agave, and combinations thereof. 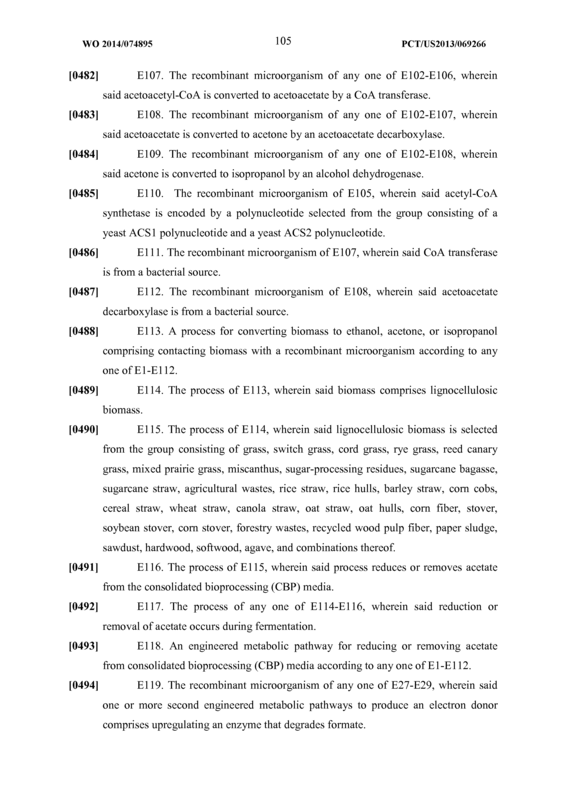 The process of claim 40, wherein said process reduces or removes acetate from the consolidated bioprocessing (CBP) media. 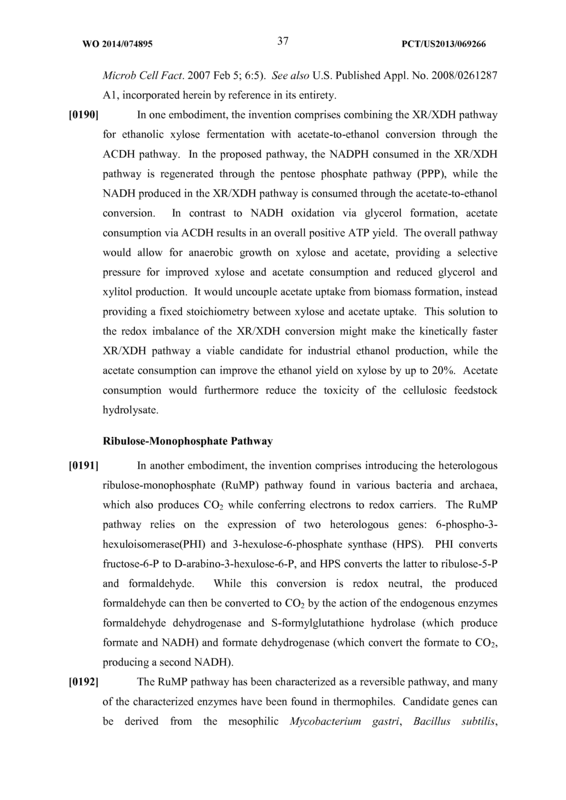 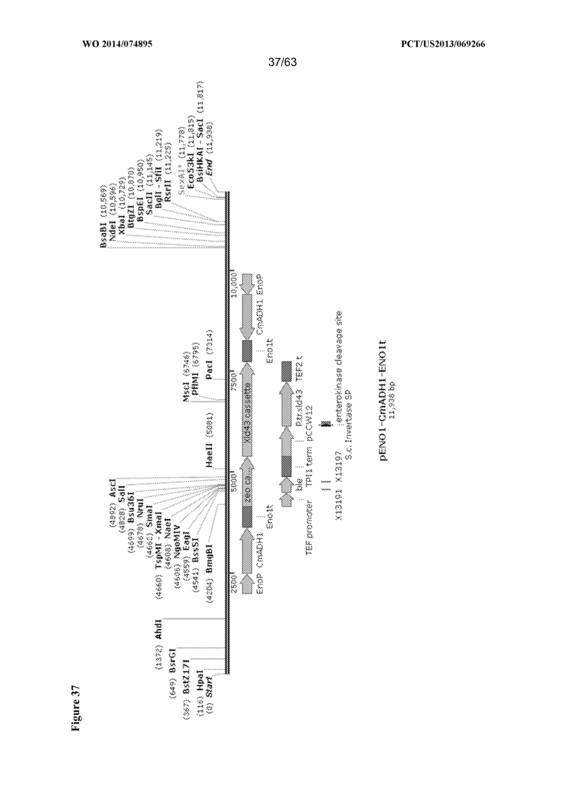 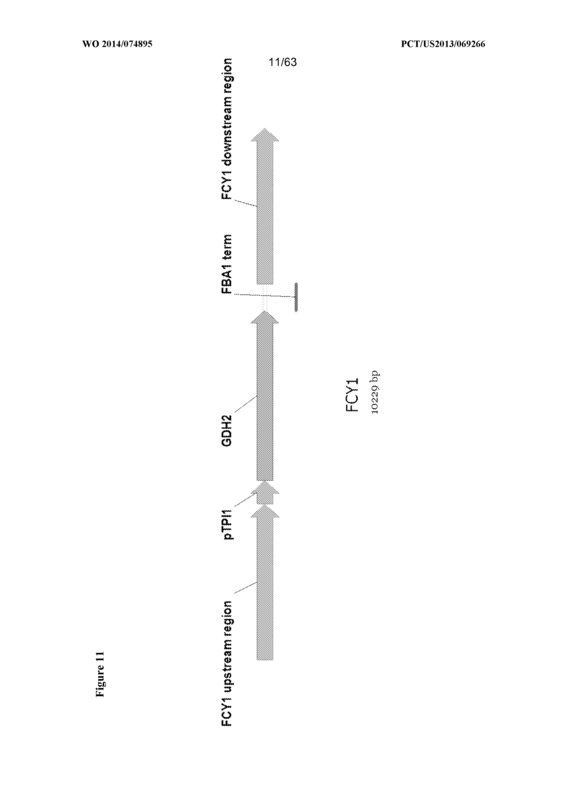 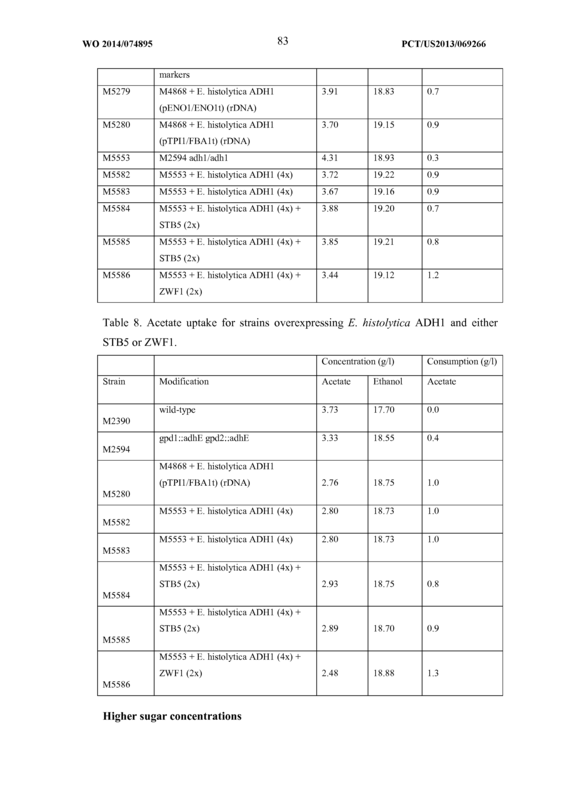 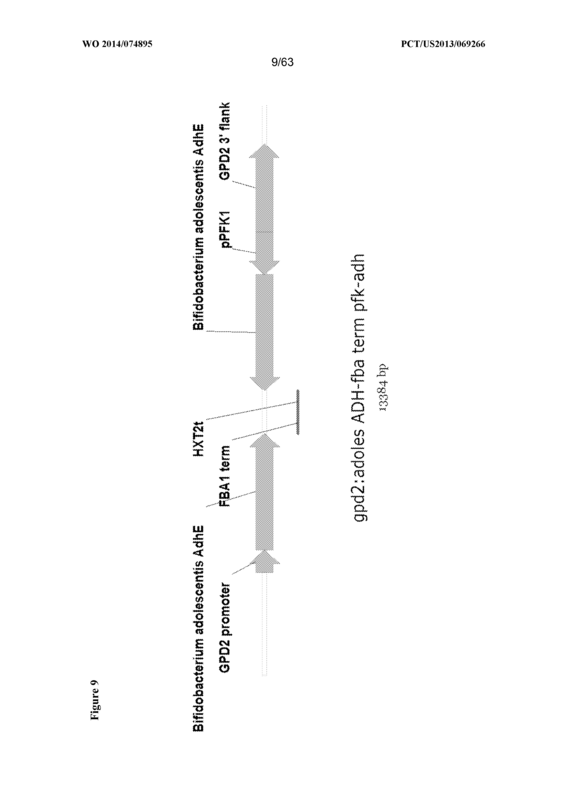 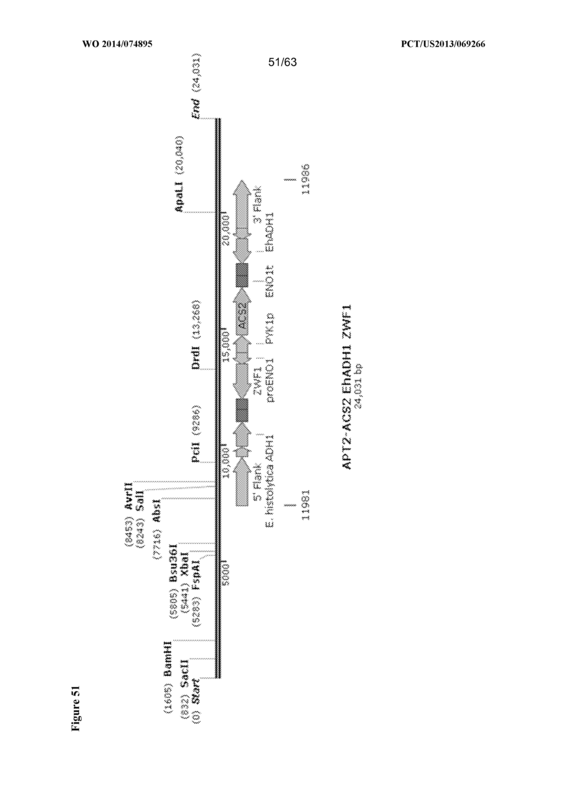 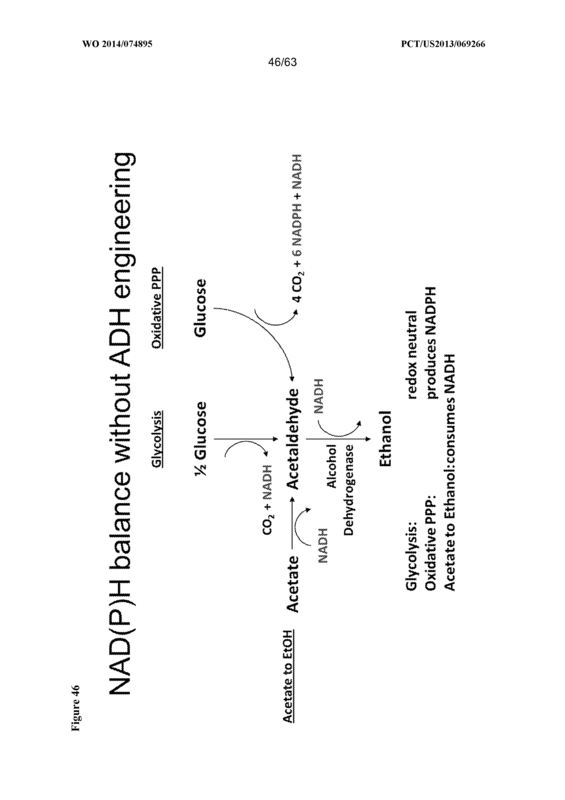 An engineered metabolic pathway for reducing or removing acetate from consolidated bioprocessing (CBP) media according to any one of claims 1-38. 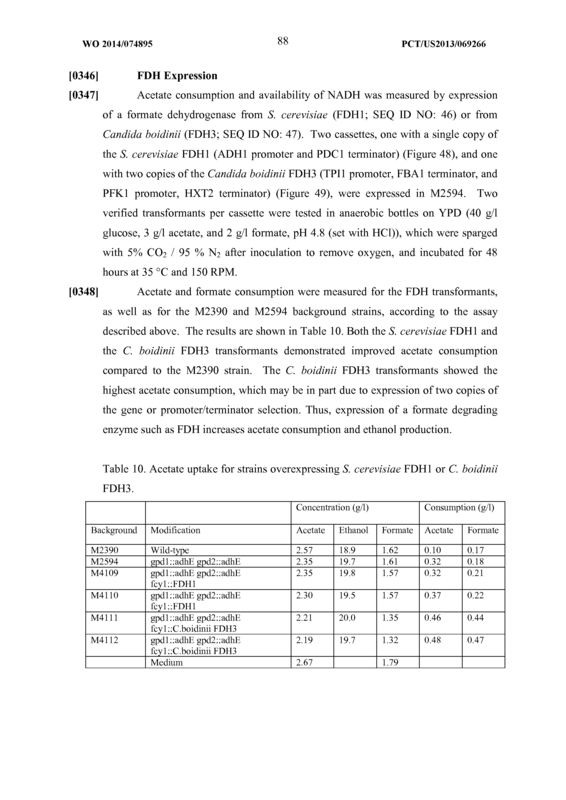 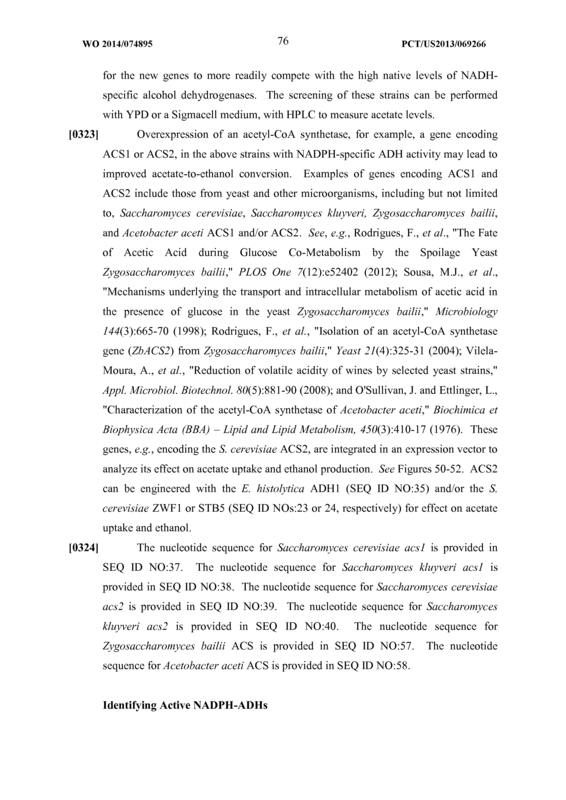 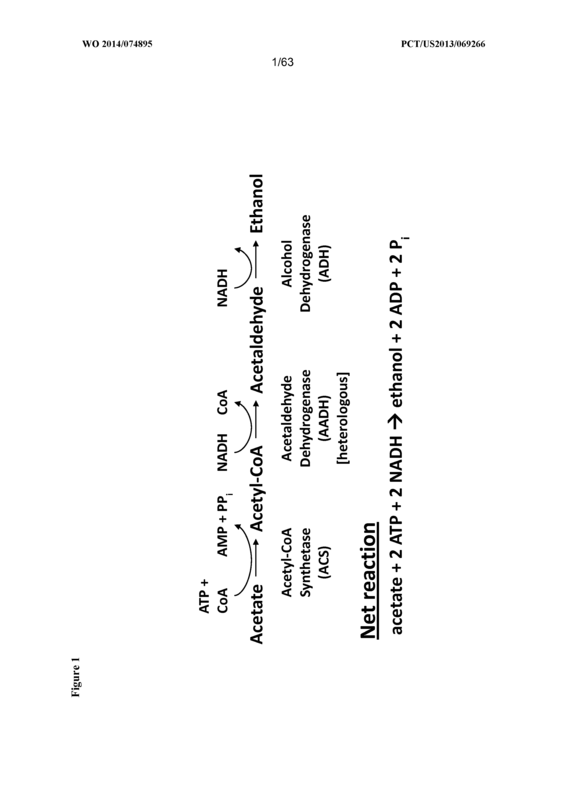 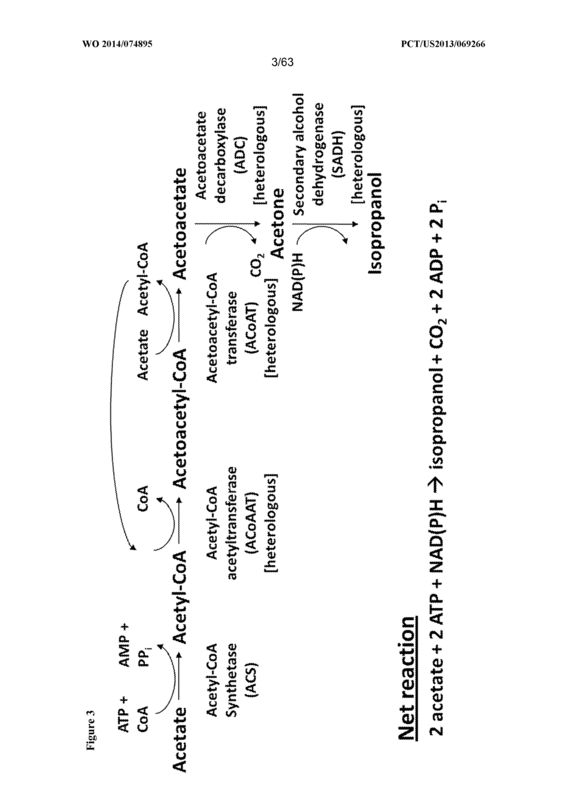 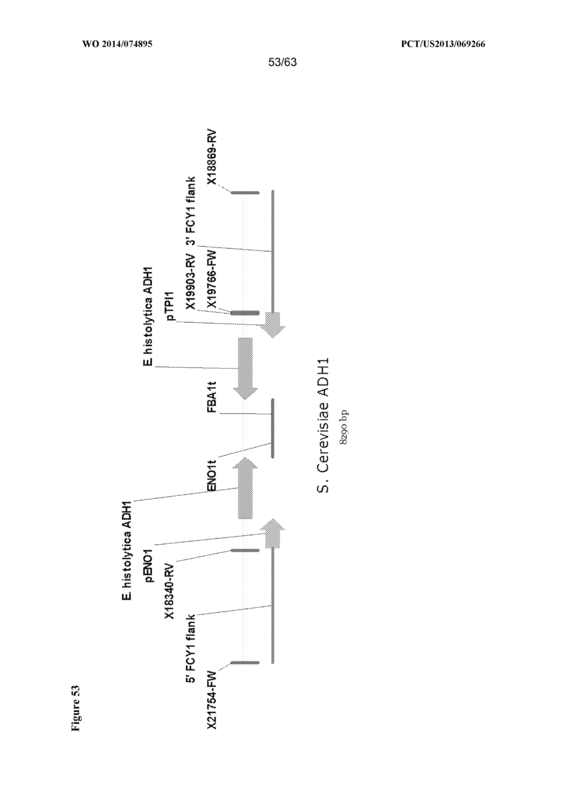 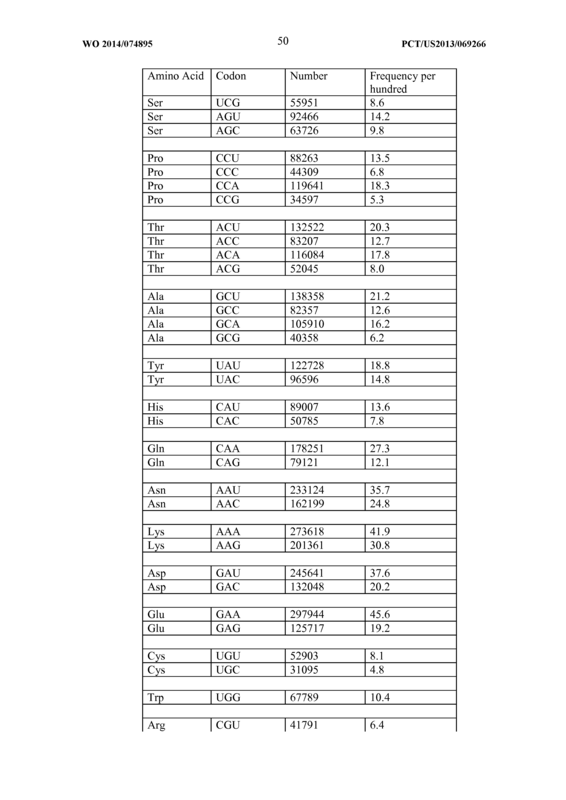 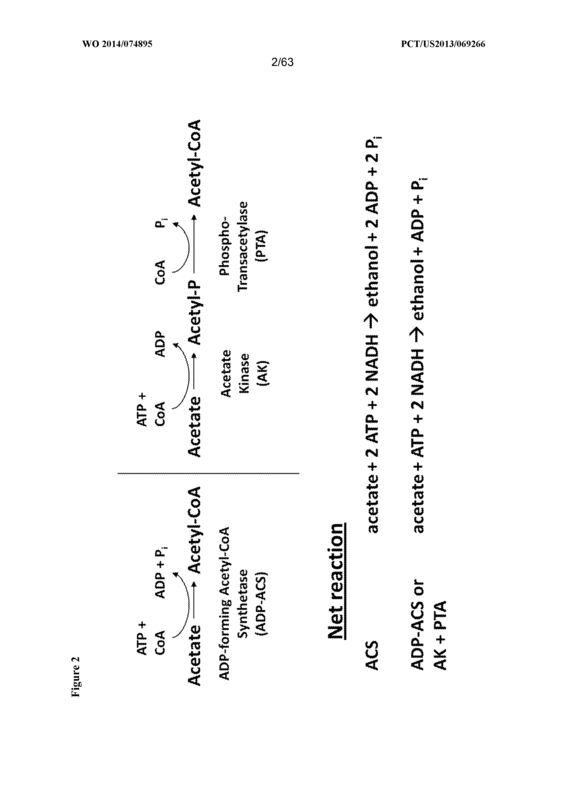 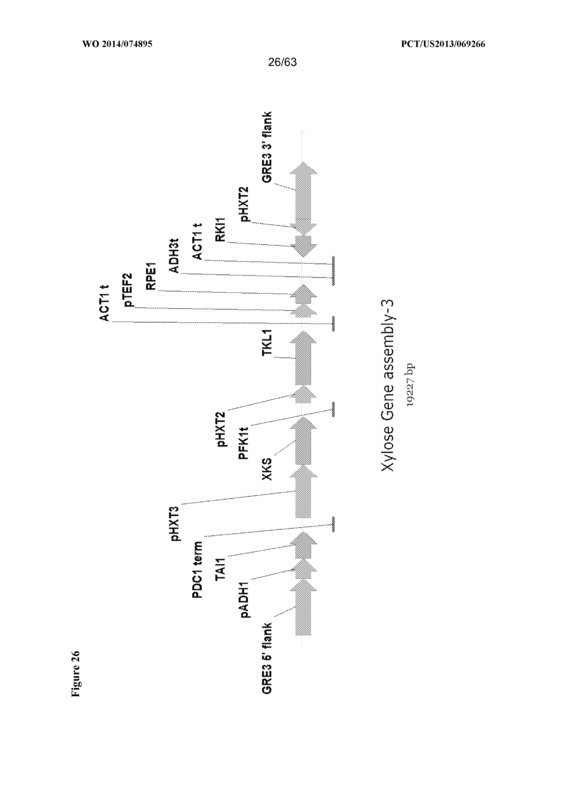 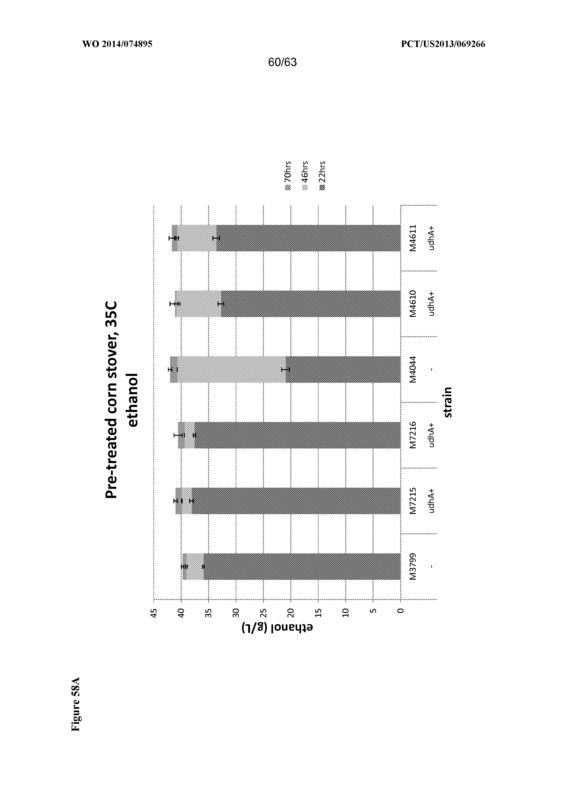 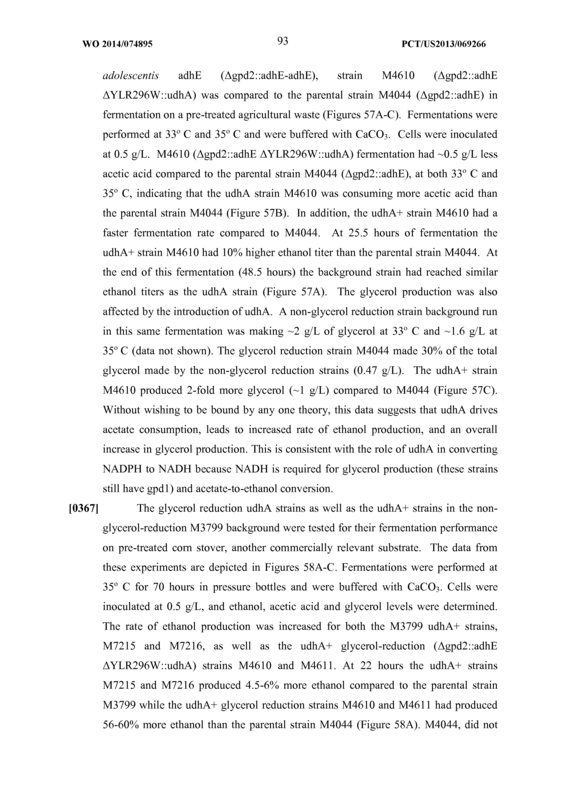 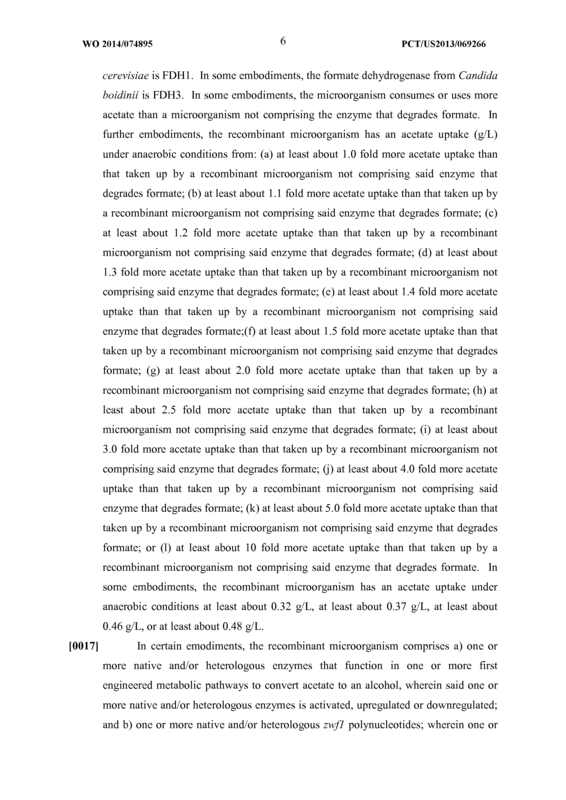 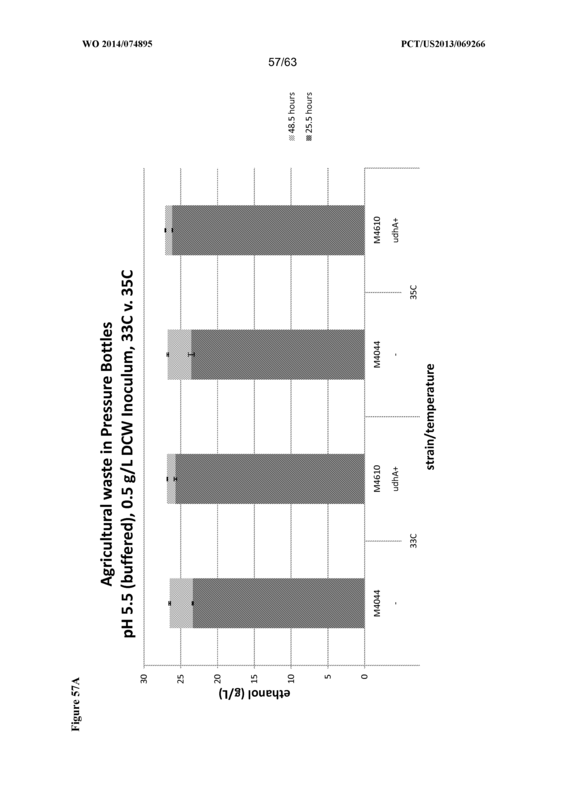 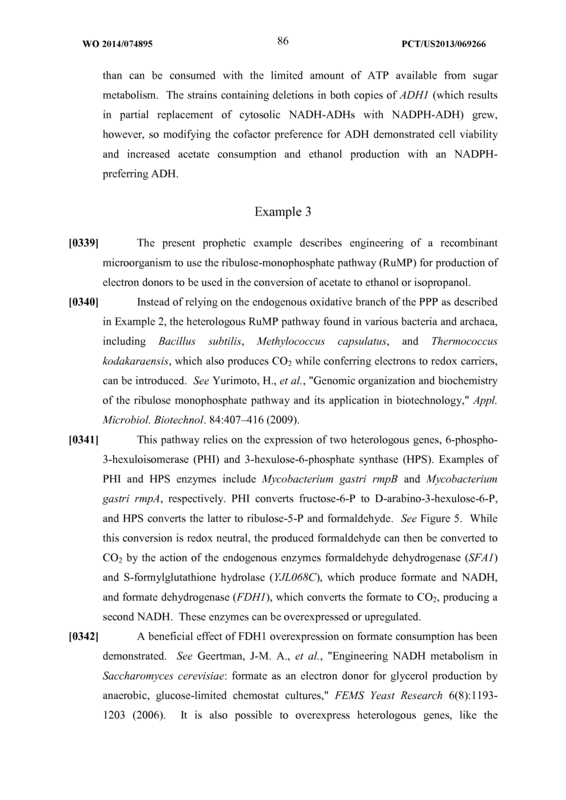 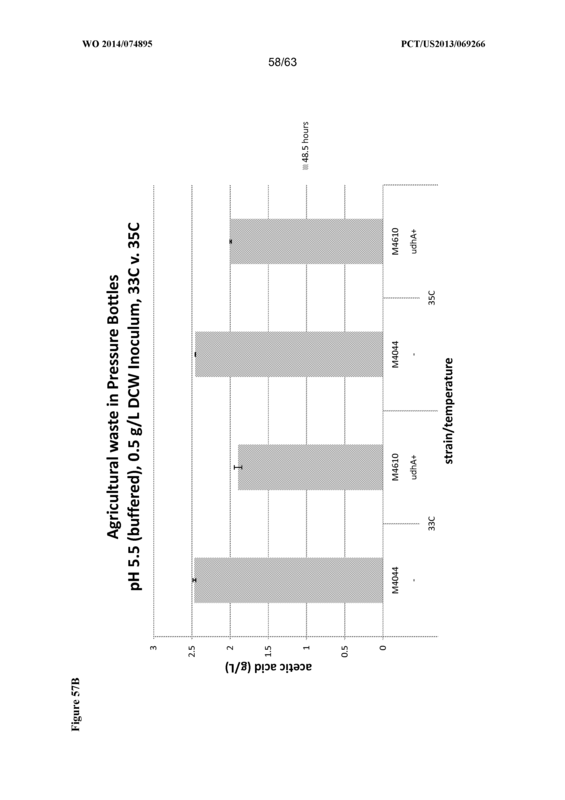 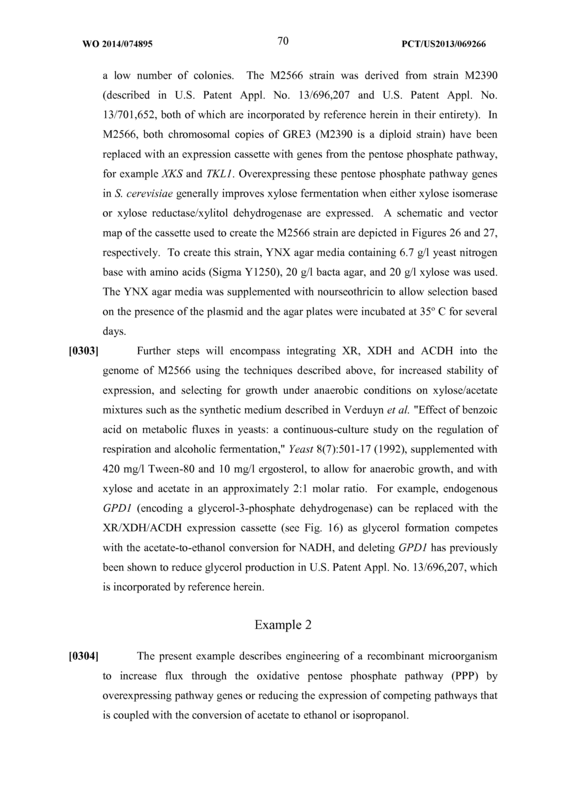 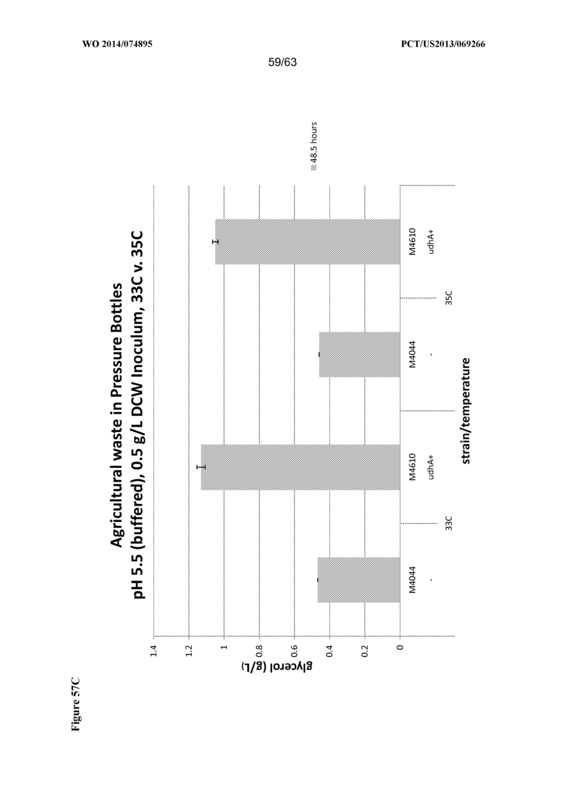 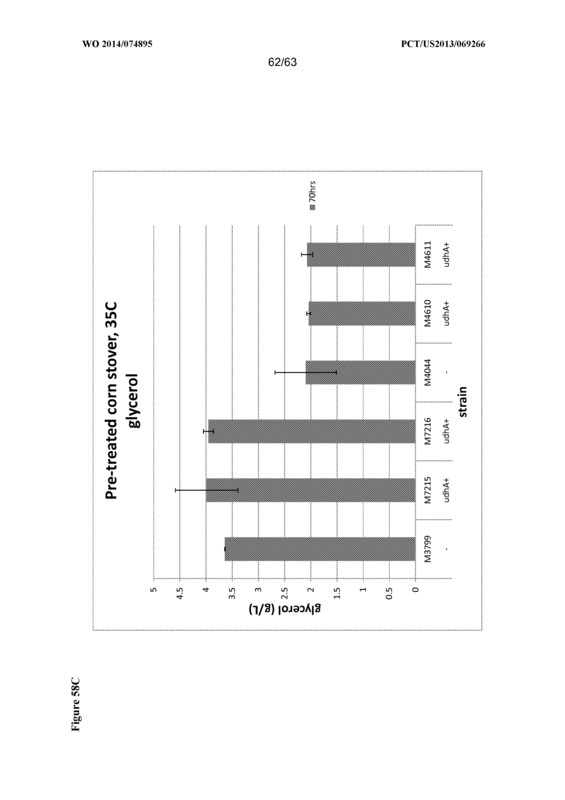 A method for increasing acetate uptake from a biomass comprising contacting said biomass with a recombinant microorganism according to claim 36. 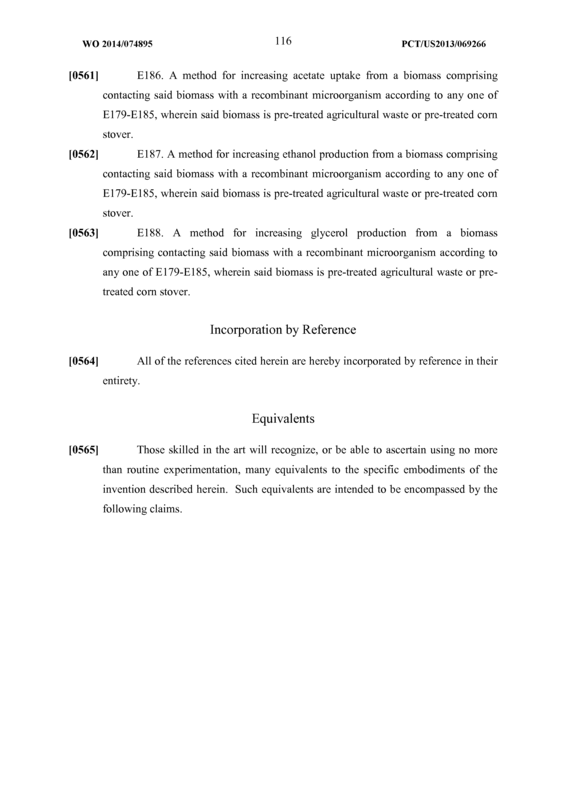 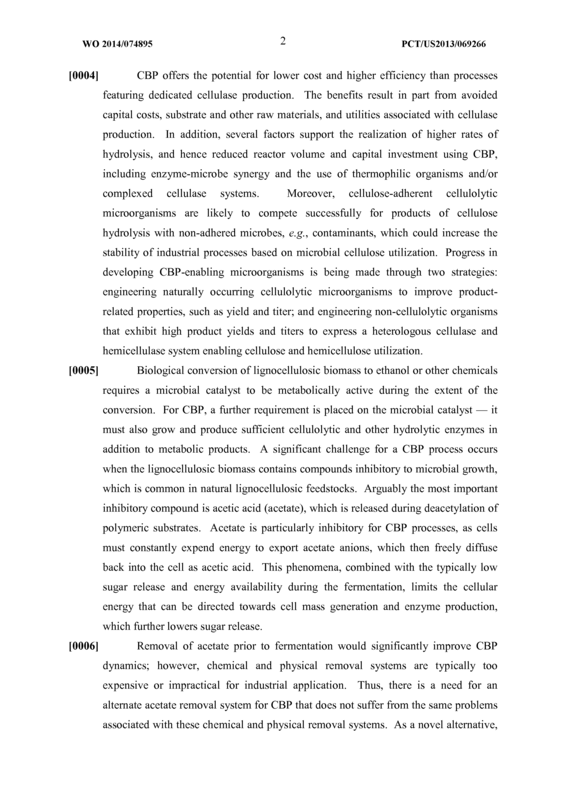 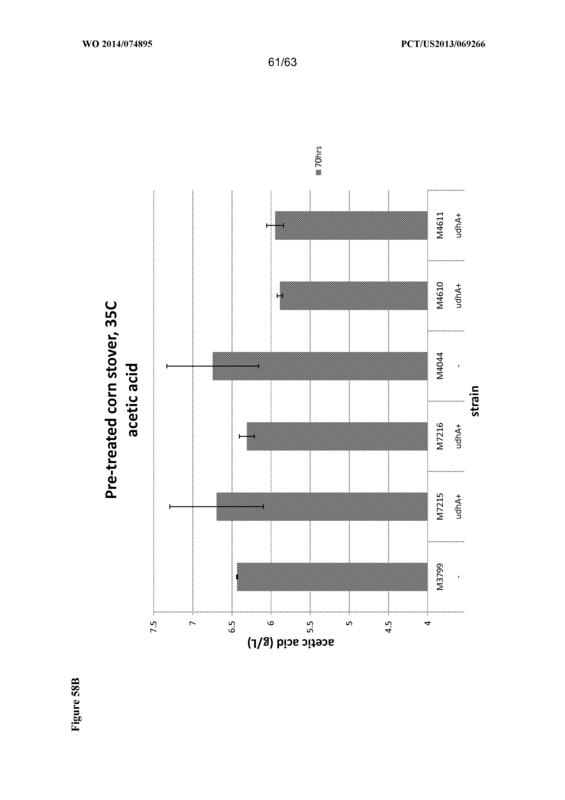 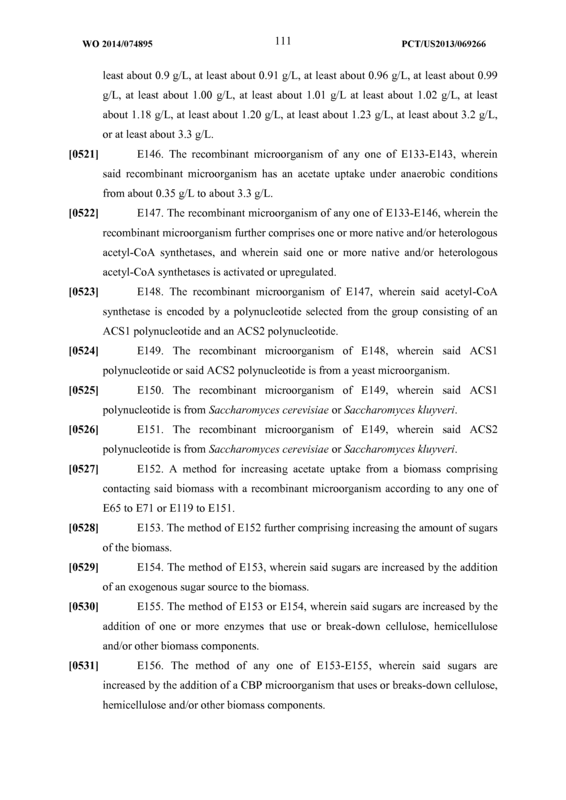 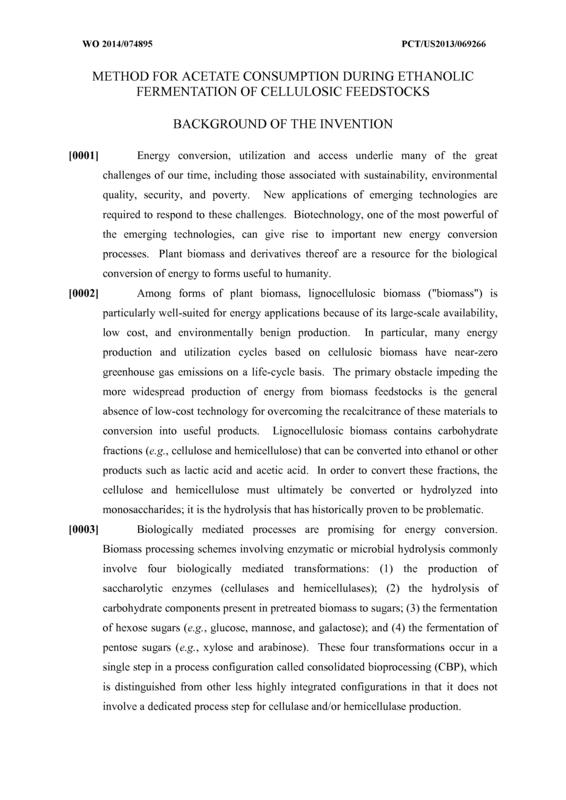 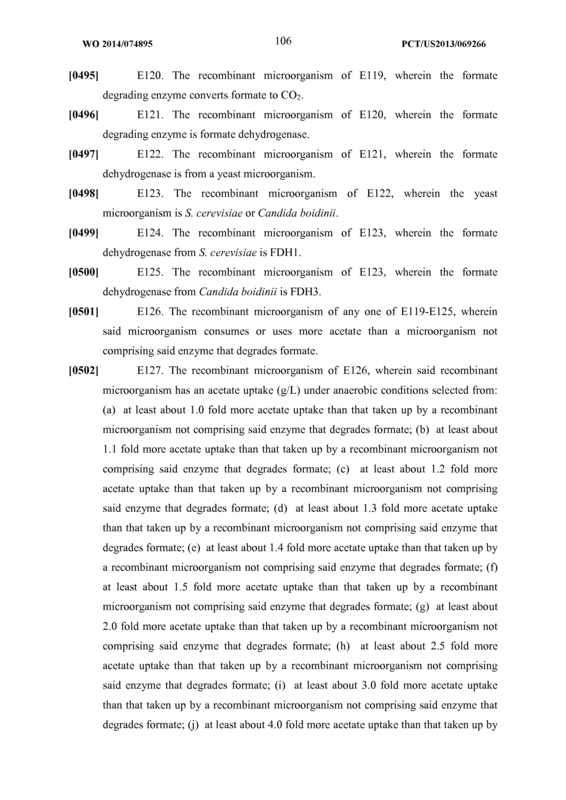 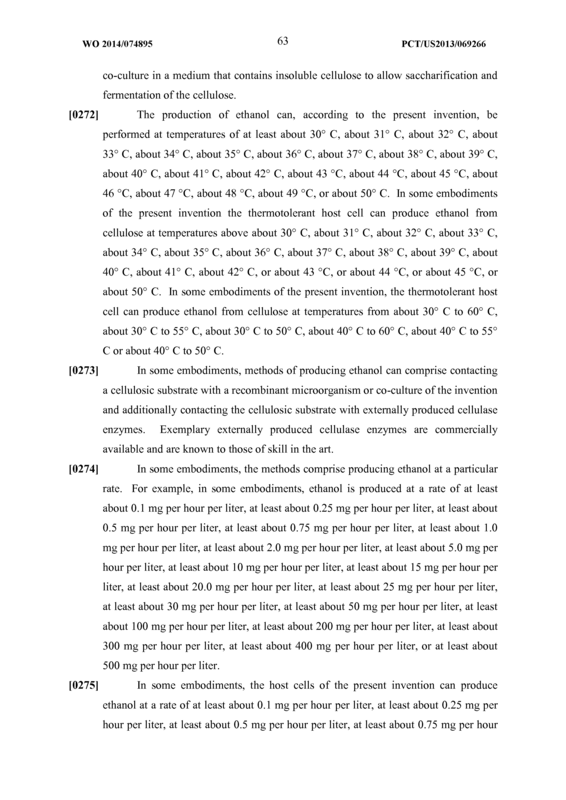 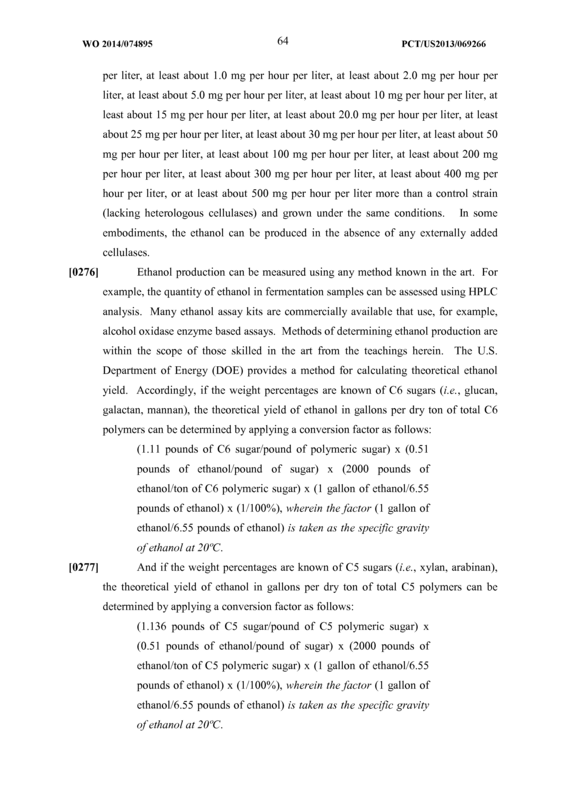 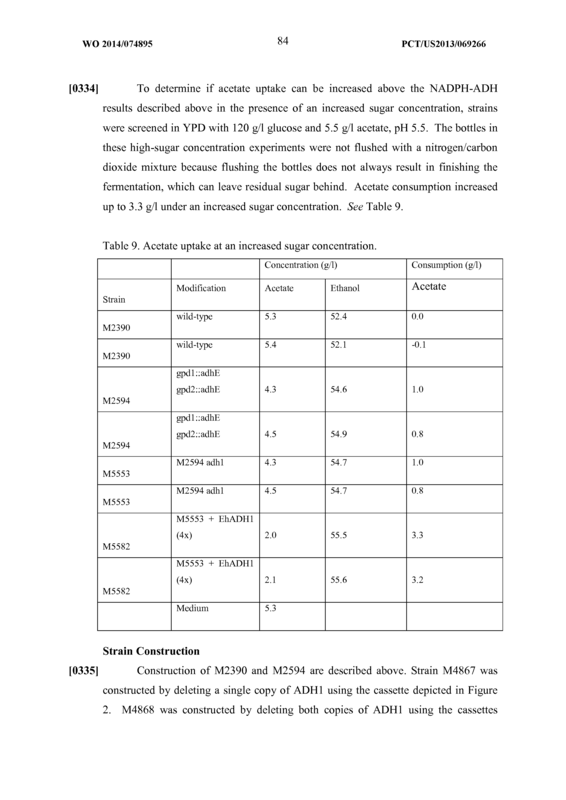 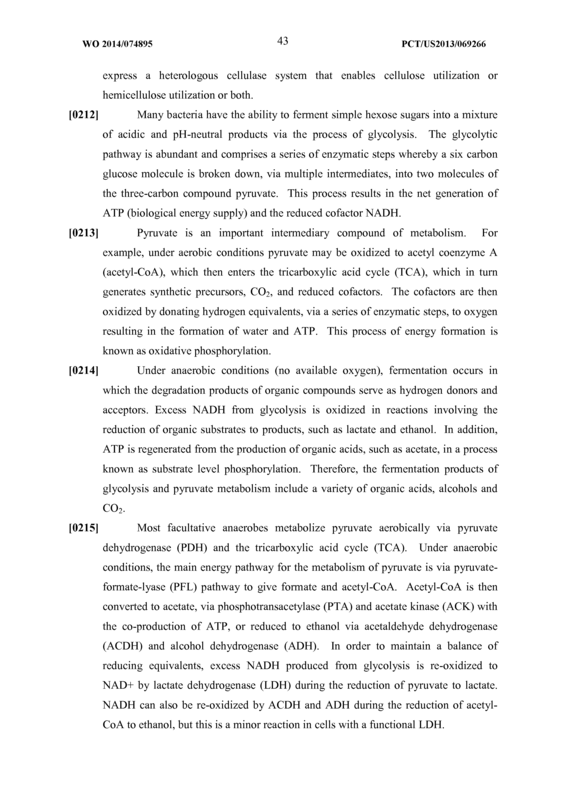 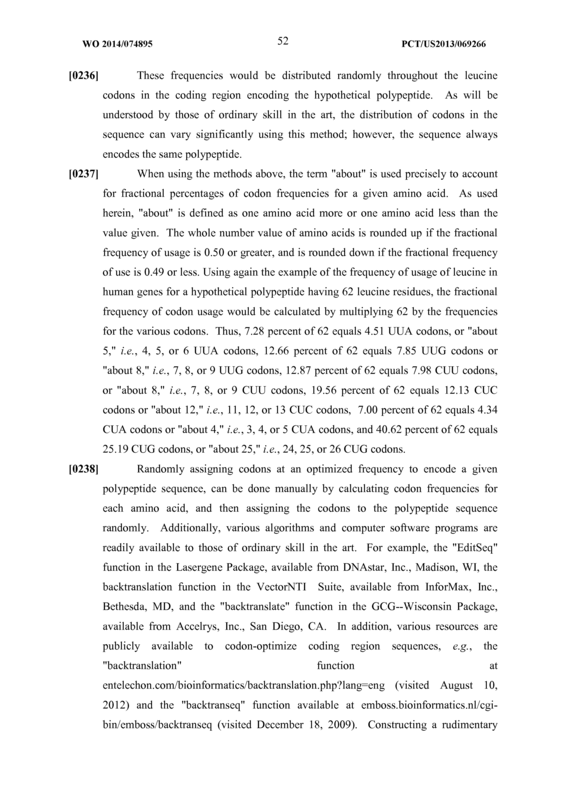 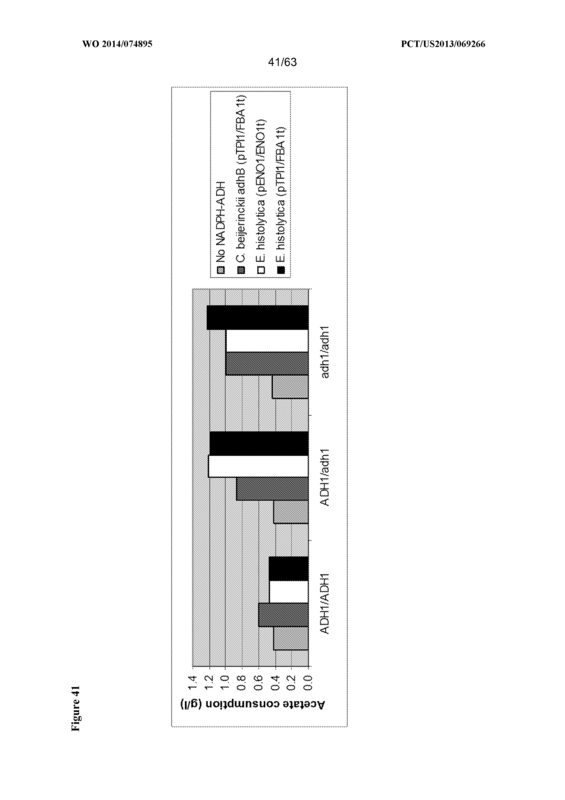 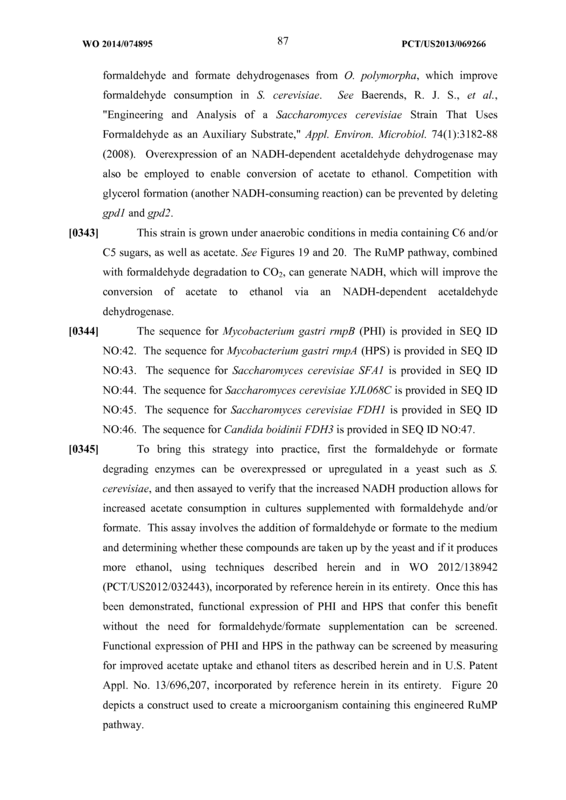 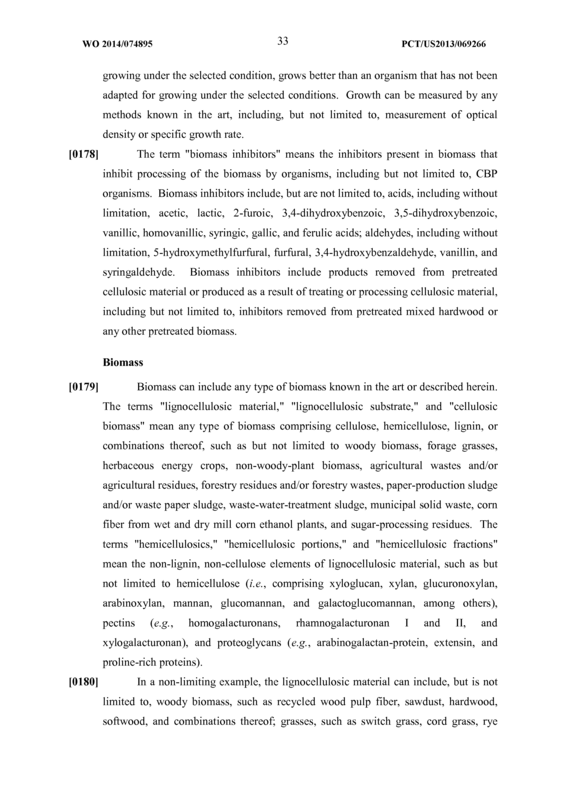 The method of claim 43, further comprising increasing the amount of sugars of the biomass, and optionally wherein said sugars are increased by the addition of an exogenous sugar source to the biomass or are increased by the addition of one or more enzymes that use or break-down cellulose, hemicellulose and/or other biomass components. 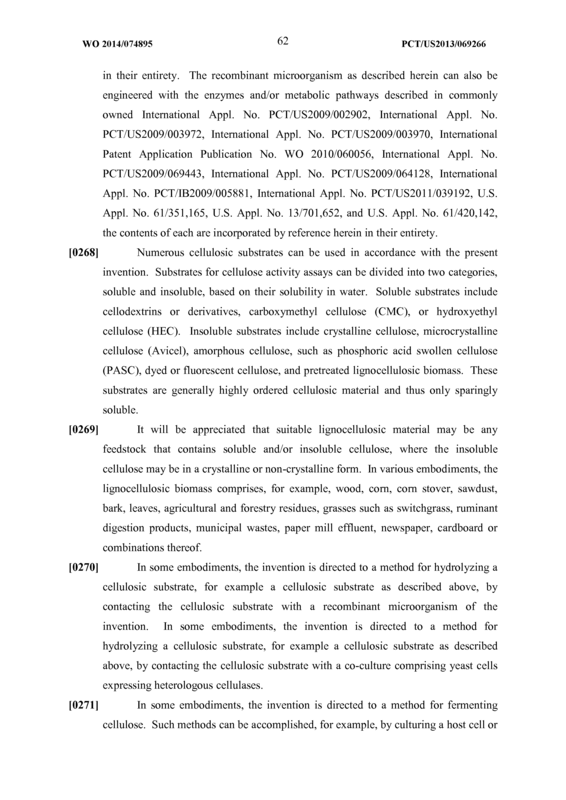 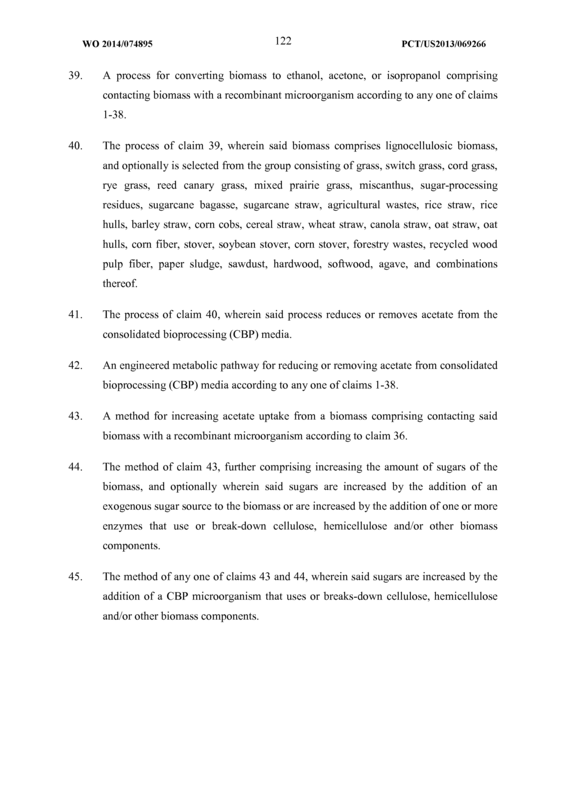 The method of any one of claims 43 and 44, wherein said sugars are increased by the addition of a CBP microorganism that uses or breaks-down cellulose, hemicellulose and/or other biomass components.